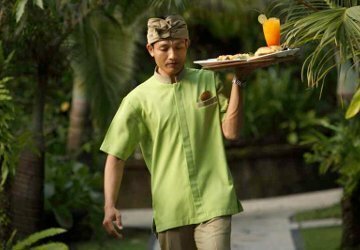 Here, you can find out more about the hotels that we use during our tours to Indonesia. 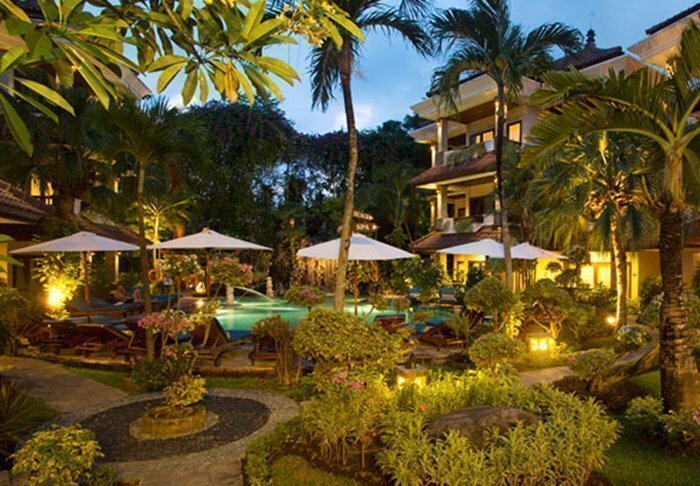 Bali Palms Resort sits right next to the ocean in the small coastal town of Candi Dasa. From here you have a gorgeous view of three islets just off the coast. A free shuttle bus to the city is available here, and restaurants, shops, bars and beauty salons are a 5-minute walk from the resort. 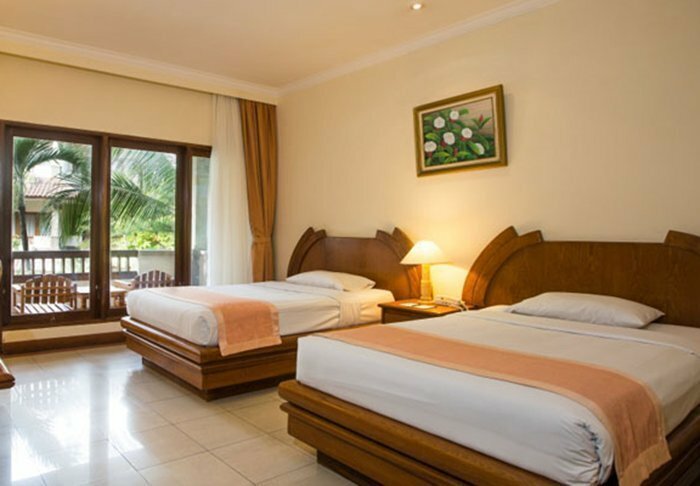 Bali Palms Resort has 48 comfortable rooms equipped with air conditioning, Wi-Fi, TV, as well as tea and coffee facilities. 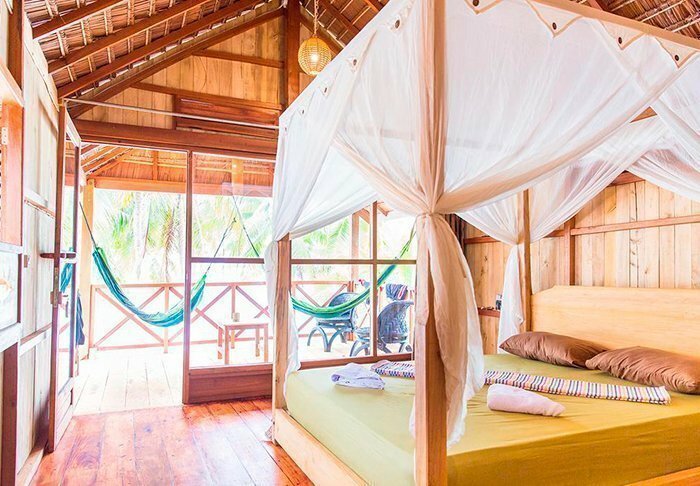 All rooms include either a porch or a balcony. 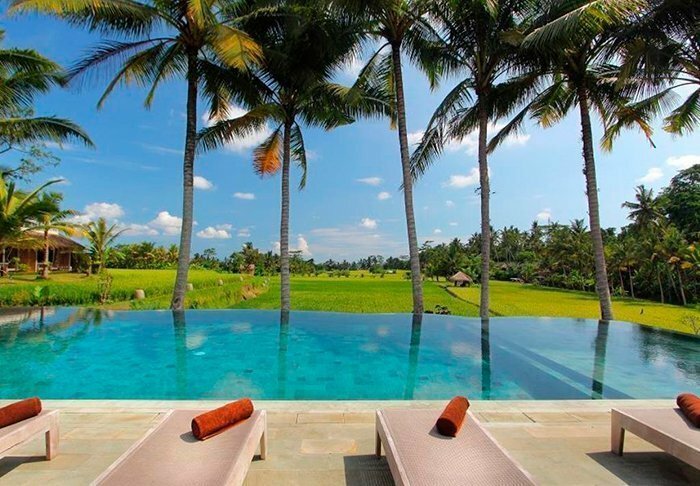 At the pool, you can lie back on a lounger, enjoy the view and unwind to the sound of the ocean and swaying palm trees, and if you need some time to pamper yourself, consider making an appointment at the spa area for a round of traditional Balinese massage or pedicure. 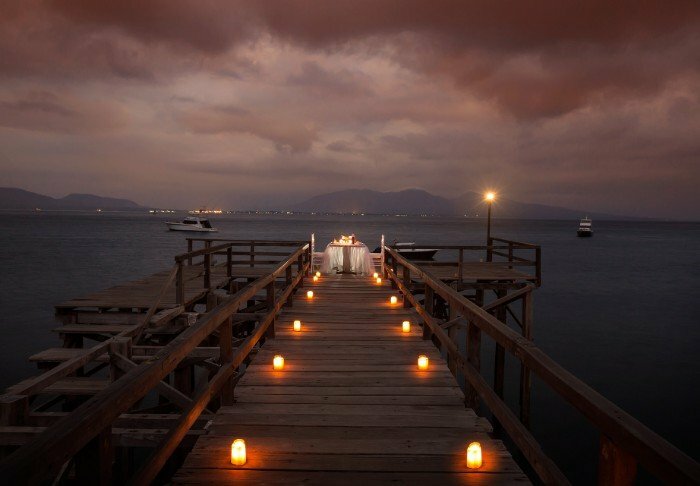 In the evening, you can watch the sun set behind the surrounding mountains. 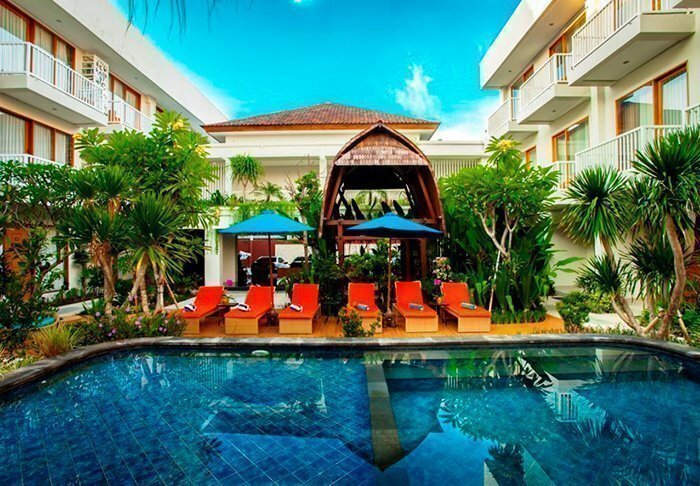 Watergarden Hotel is located in the calm and peaceful beach town of Candi Dasa. 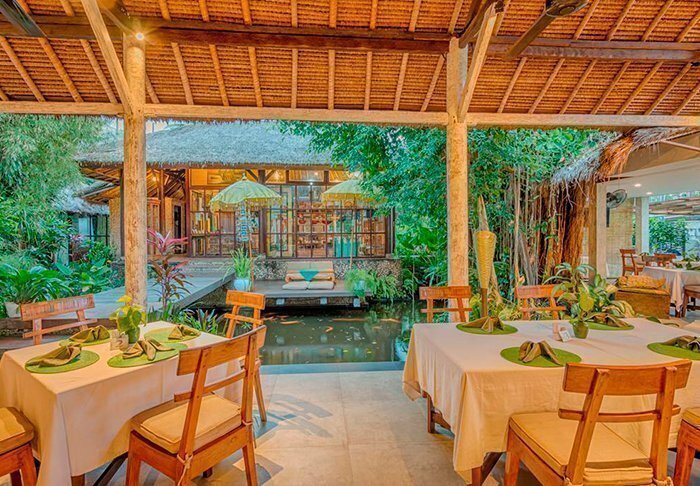 At Watergarden Hotel, you stay at a private bungalow furnished with natural materials and Balinese crafts. 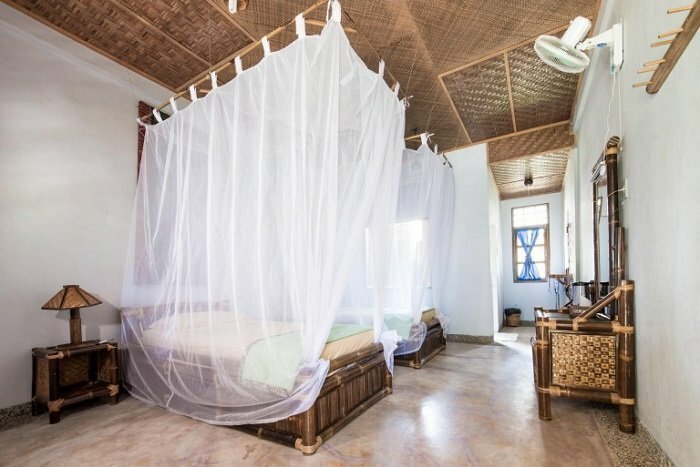 All rooms feature free Wi-Fi, air conditioning, a ceiling fan, a safe, minibar, mosquito netting, coffee and tea facilities, telephone and hair dryer. 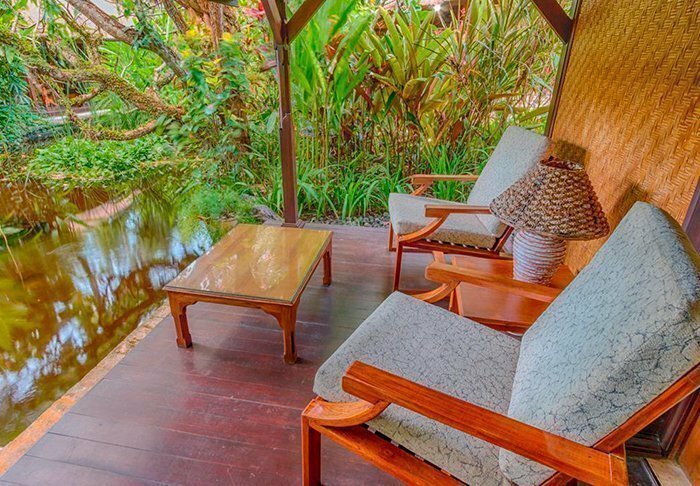 Each bungalow is built in harmony with the surrounding lush, tropical gardens, and from the porch, you can enjoy the calm at your own personal lily pond, watching the fish swim around. 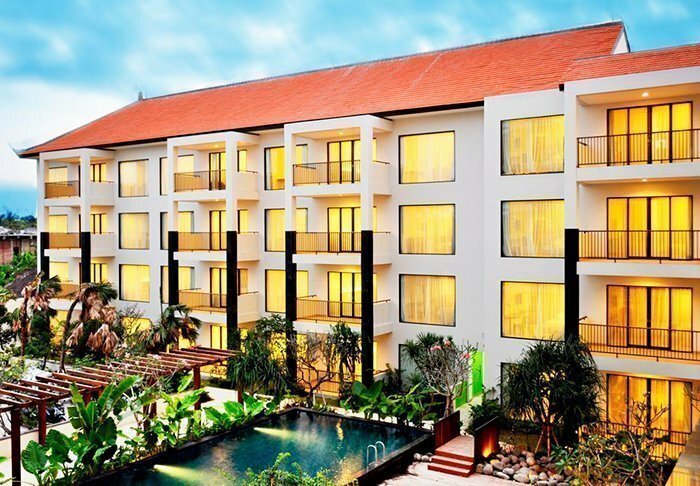 The hotel’s facilities also include a restaurant, swimming pool and spa. 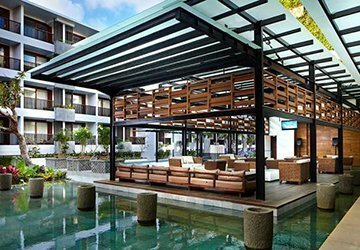 The 4-star hotel, Aston Sunset Beach Resort is located on the west side of Gili Trawangan, and the sunset overlooking the legendary volcano, Mount Agung in Bali, is an absolute must during a stay here. 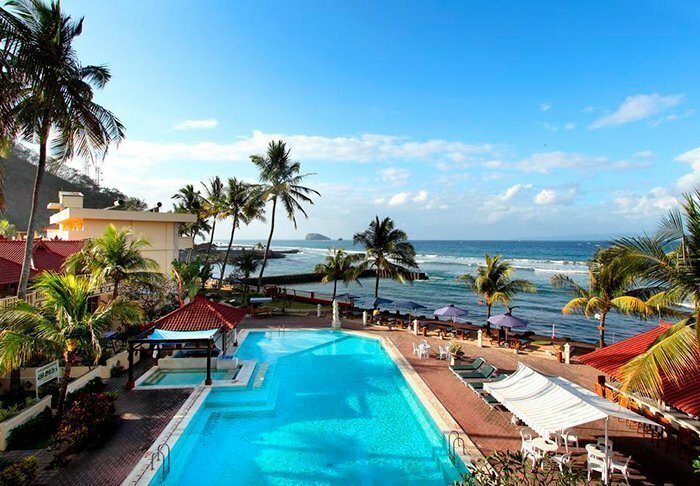 The resort is located right on the beach, and in a relatively quiet area. If you wish to go into town, you can borrow bicycles. 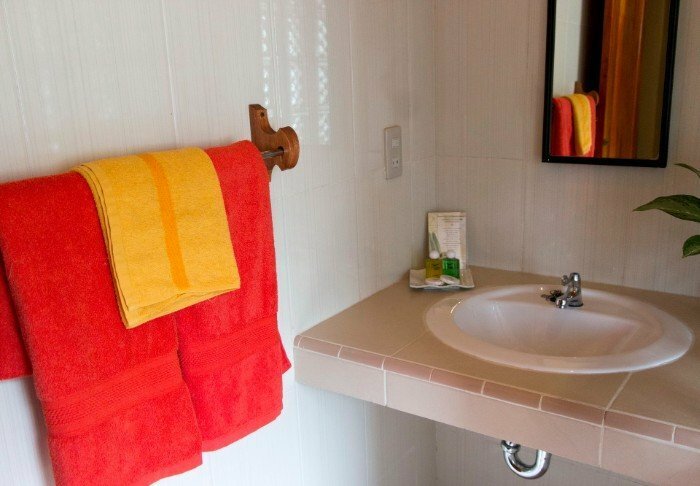 The rooms are spacious and all have an en suite bathroom, a TV, air conditioning and tea/coffee making facilities. 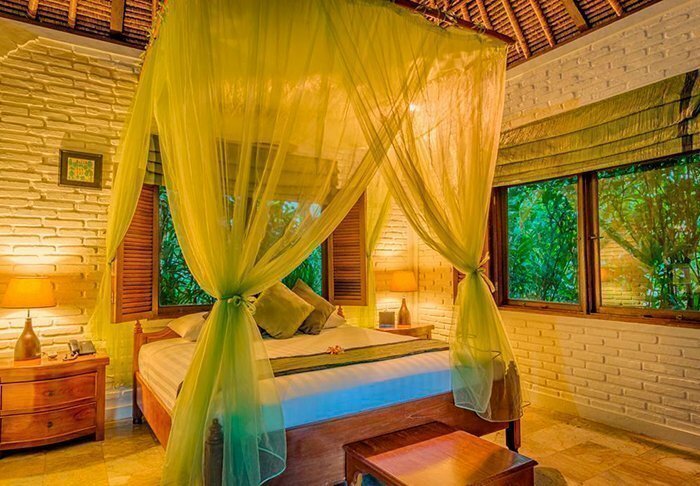 All rooms have a private balcony/terrace. 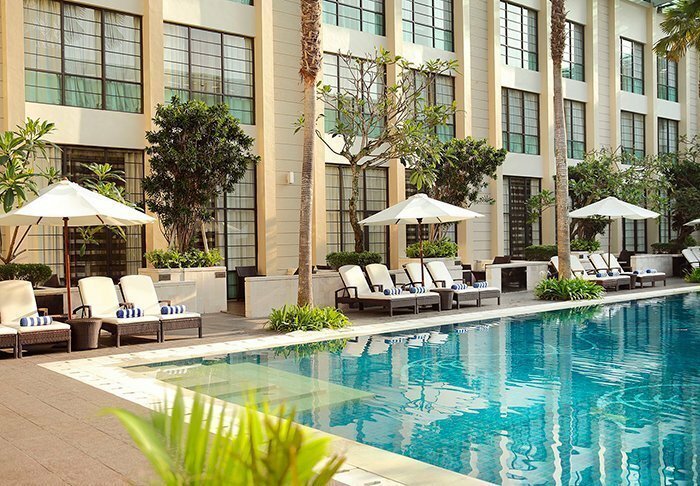 The pool is large, with ample space for sun loungers around it. There is Wi-Fi at the hotel and in the restaurant. 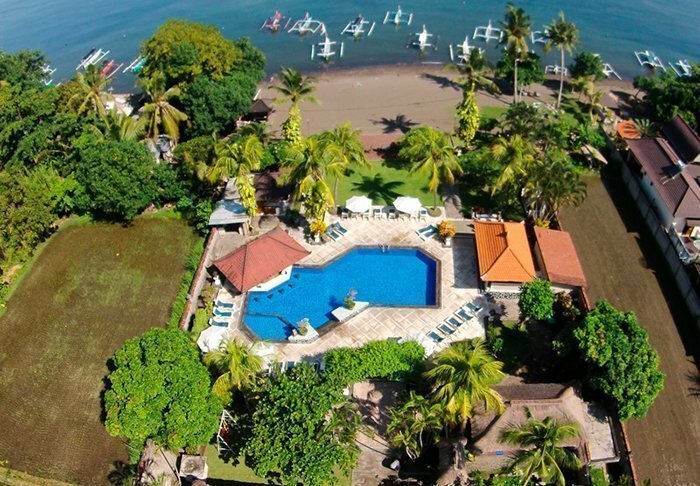 The 3-star Aneka Lovina Villas & Spa is located right next to the black volcanic beach in Lovina. 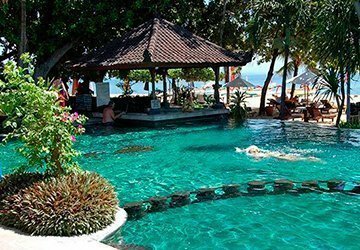 The waters off the coast at Lovina are famous for their dolphins and excellent snorkelling. 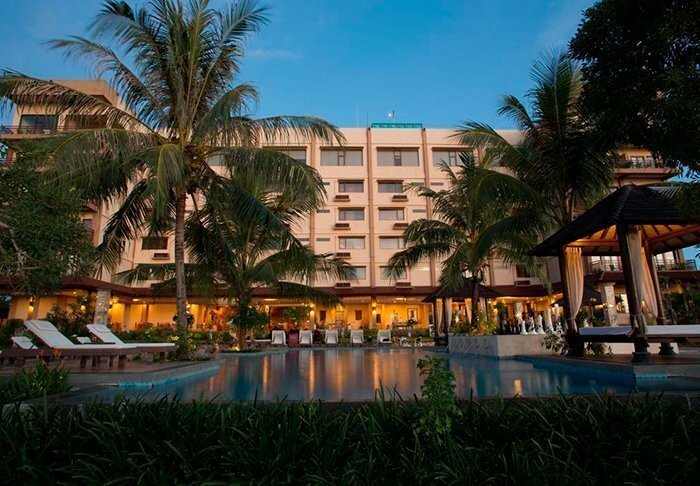 The hotel is situated in a large tropical garden, where the peace and quiet ensure a truly relaxing atmosphere. 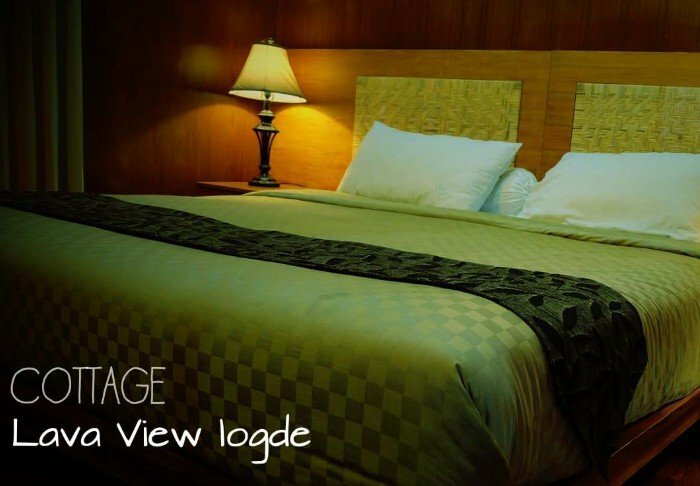 Accommodation is in both cabin rooms and standard hotel rooms. 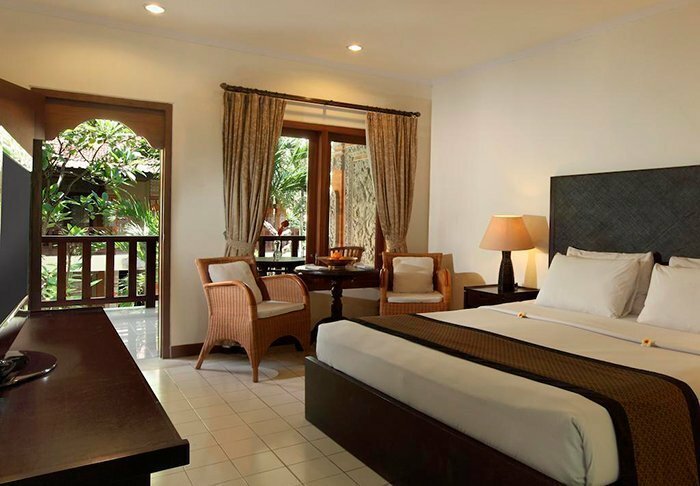 All rooms feature air conditioning and typical Balinese furniture. 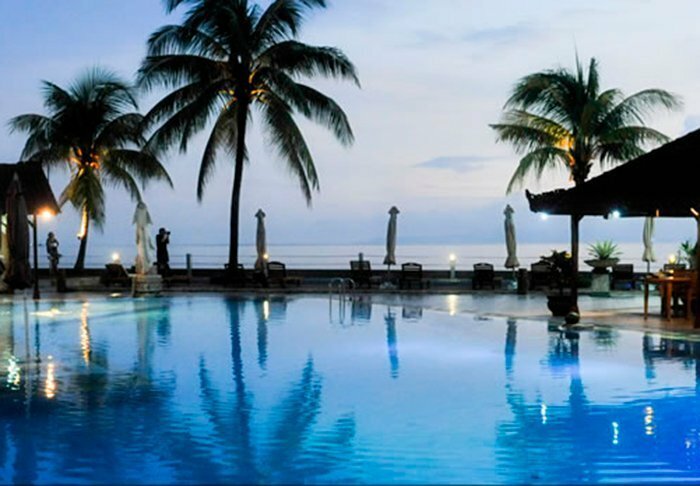 The hotel has a wonderful swimming pool, two fine restaurants – one with a sea view – a bar, pool bar, spa and tour desks. 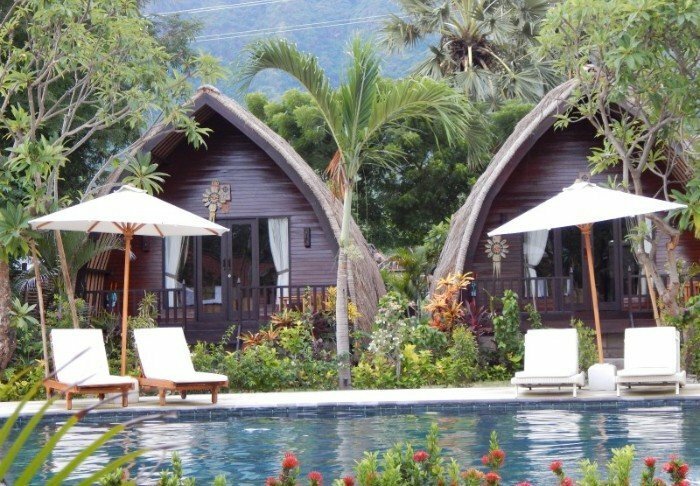 The unique ecology resort, Puri Lumbung is located in the midst of the fresh mountain air in the highlands, close to the town of Munduk in northern Bali. 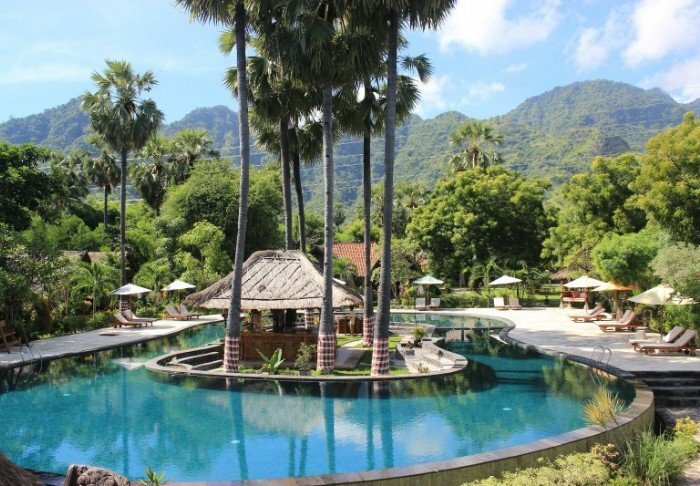 The resort affords beautiful views of the surrounding landscape, with green paddy fields and lush valleys, both of which are surrounded by mountain tops, sticking up in the landscape. 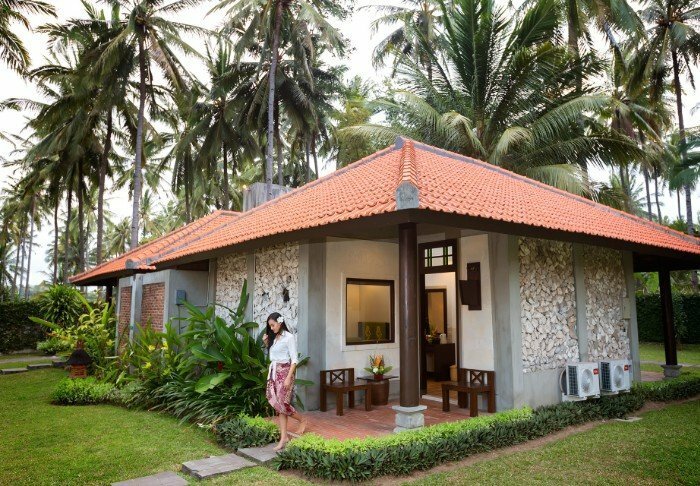 The 43 rooms all consist of charming little cabins of different sizes, all with en suite bathrooms/toilet and their own veranda or terrace overlooking the mountains or paddy fields – or both in some cases. There is no air conditioning – it is not necessary in the cool, fresh mountain air. 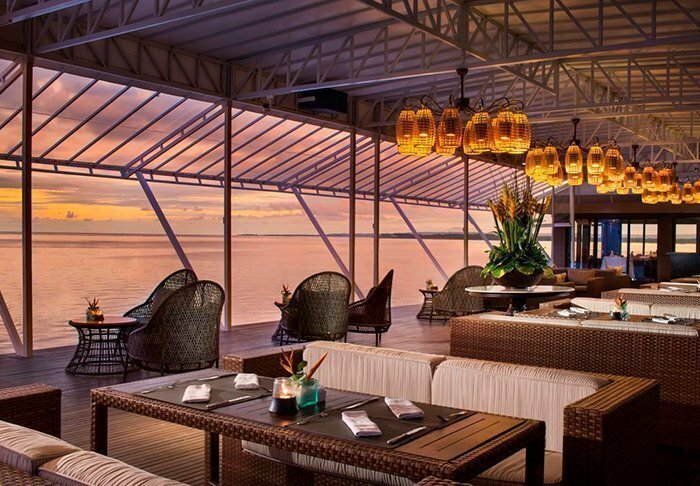 The resort has two restaurants, a bar and day spa. There is no pool at the resort. 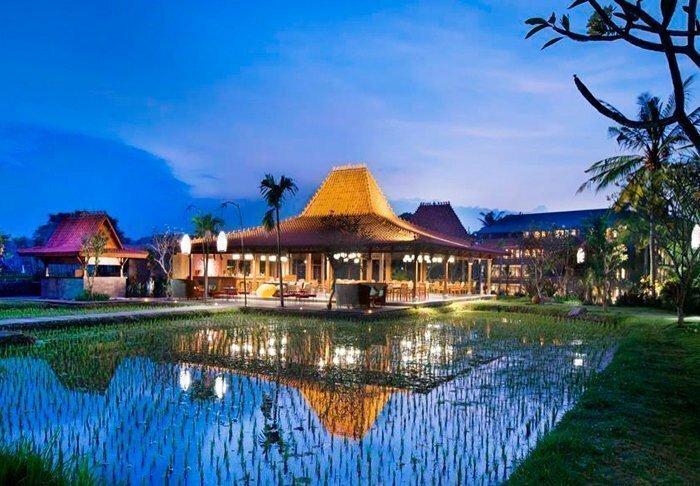 The entire resort is built in Balinese style and with respect for traditional practices and customs, and the resort works closely with the local population to retain the culture of the place and local customs. 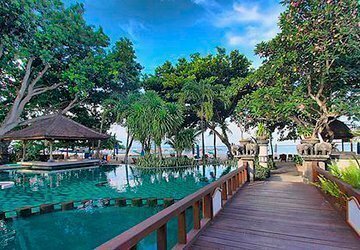 The 3-star Adi Assri Resort is located right next to the water, and just a short distance from the beach at Pemuteran, approx. 20 minutes by car from the entrance to Bali National Park. 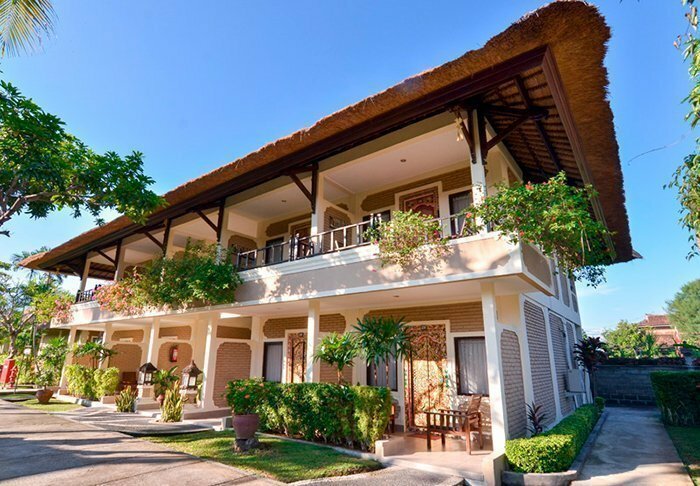 The resort is made up of a number of bungalows, and there are around 60 rooms in all. 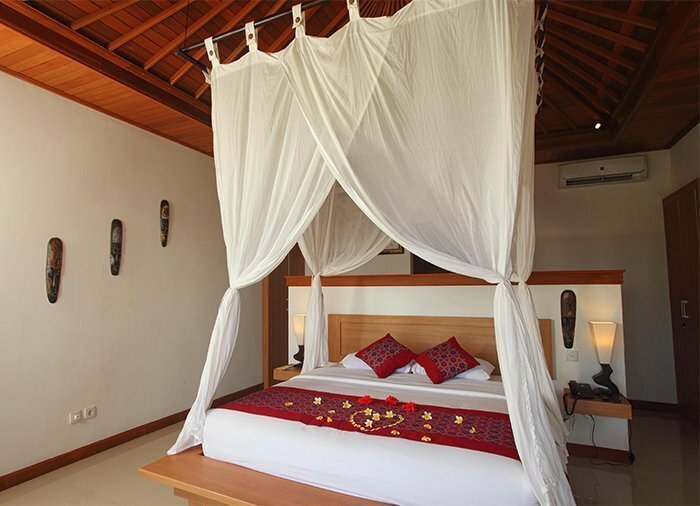 The rooms are spacious and furnished in traditional Balinese style, with a four-poster bed covered by a mosquito net. 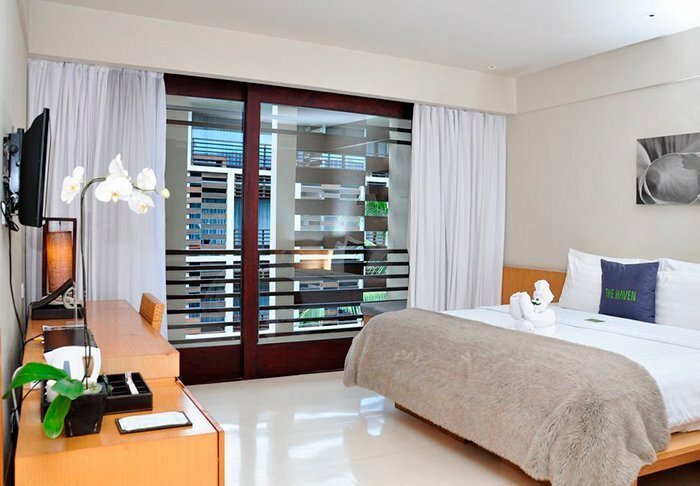 In-room conveniences include air conditioning, a minibar and small safe, tea- and coffee-making facilities, and a separate terrace. 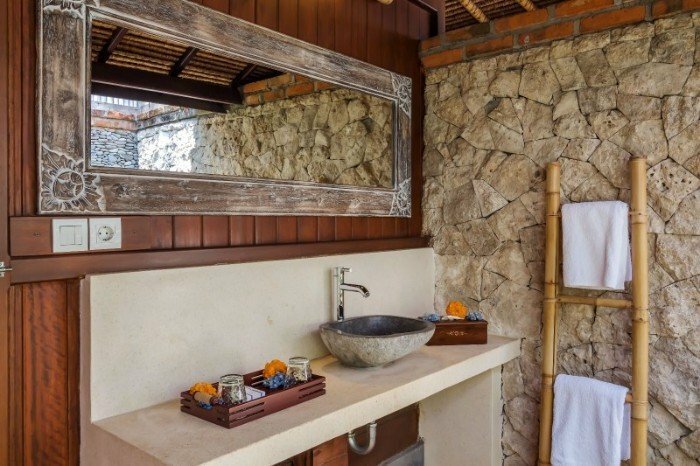 All rooms come with a traditional Balinese outdoor bathroom – i.e. 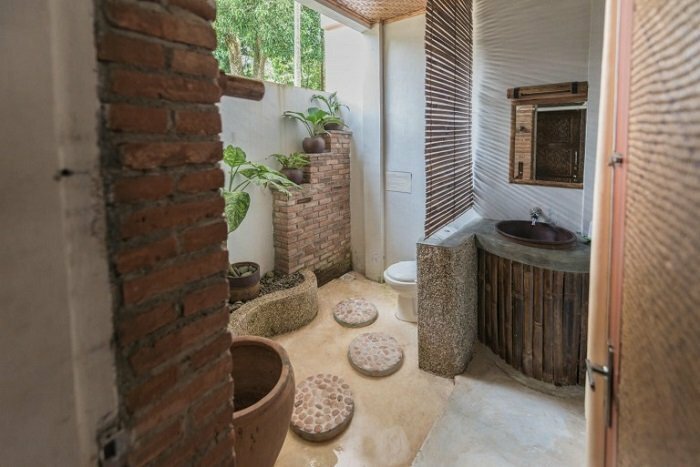 an open-air (but screened) shower. 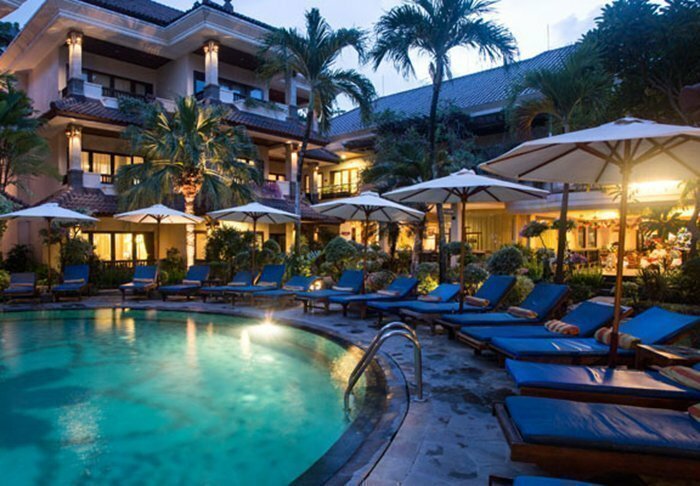 The resort has a swimming pool, spa department, restaurant, bar and, of course, free WiFi. 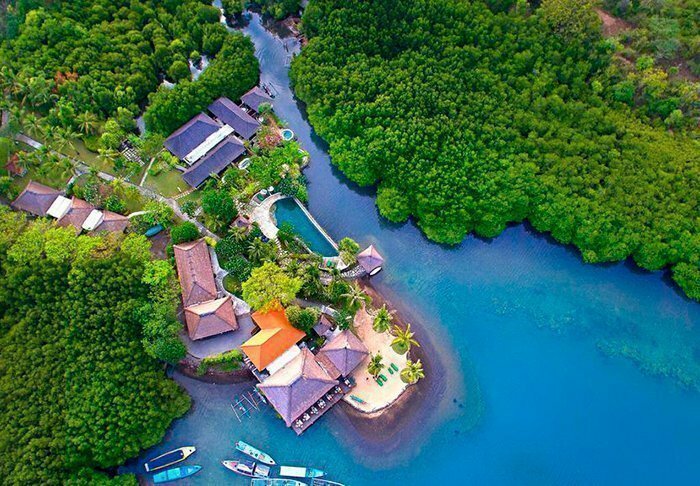 Kinaara Resort & Spa is in Pemuteran in north-western Bali. 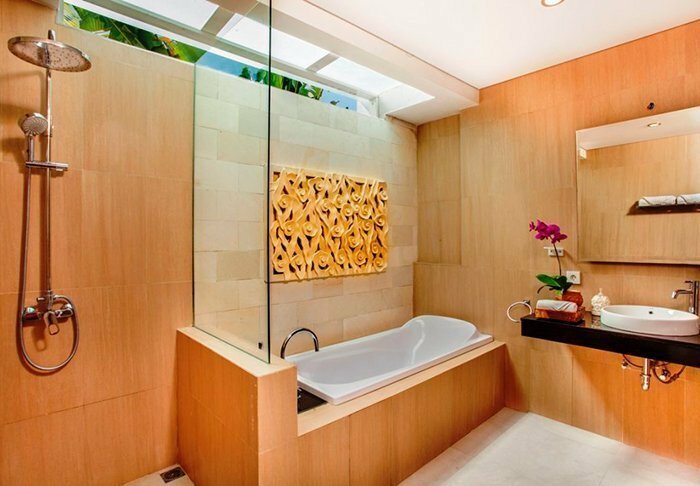 This location will no doubt enchant you and help you unwind. 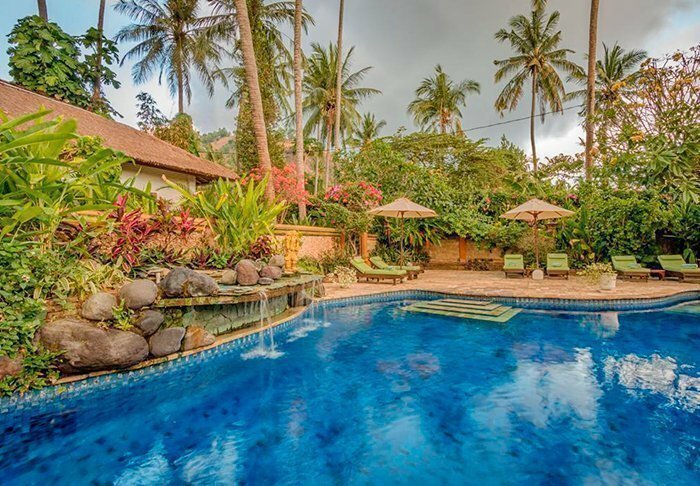 One cannot help but fall in love with this place, reminiscent as it is of a small oasis surrounded by tropical gardens, palm trees and breathtaking mountains. 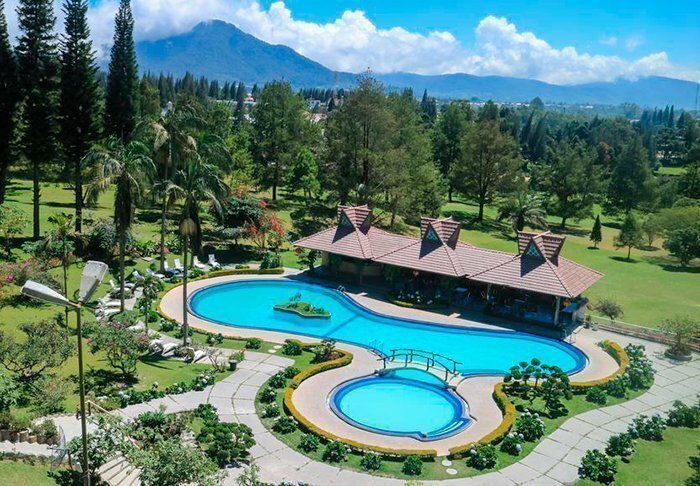 In the middle of the resort is a fantastic pool with naturally-heated water from the resort’s own springs. 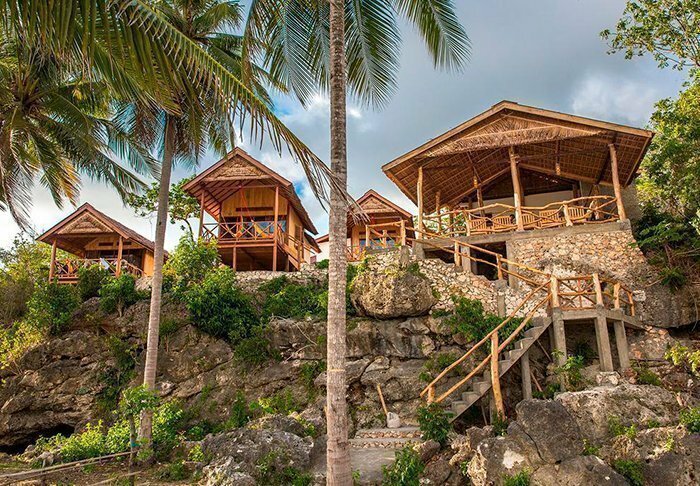 The resort consists of cottages fitted with comfortable beds and mosquito nets as well as outdoor baths. 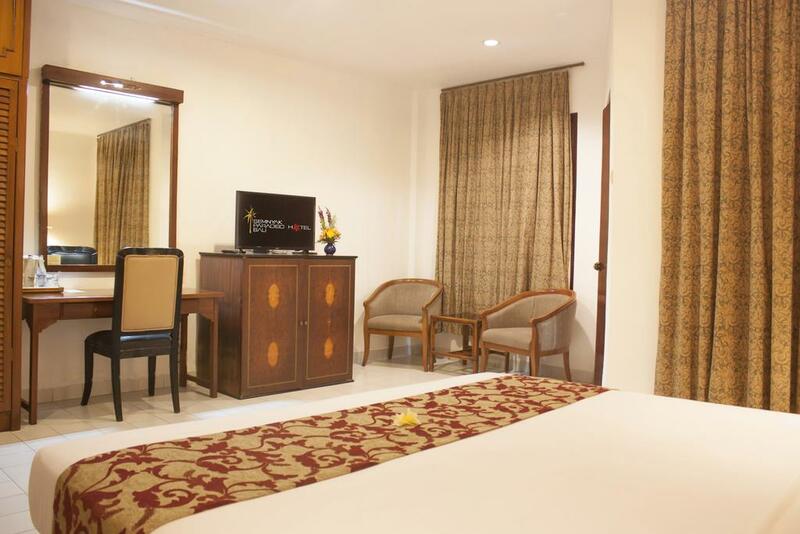 All rooms are equipped with Wi-Fi, air conditioning, a ceiling fan, a mini bar, coffee and tea facilities and a phone. 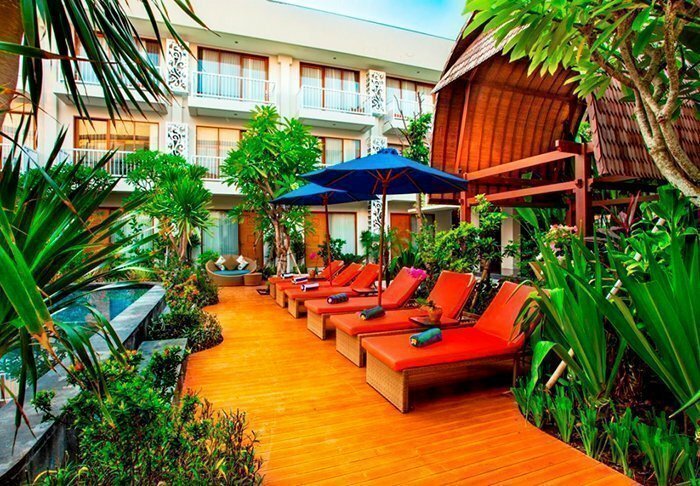 On the balcony you can relax with a good book and enjoy your view of the pool and the tropical gardens. 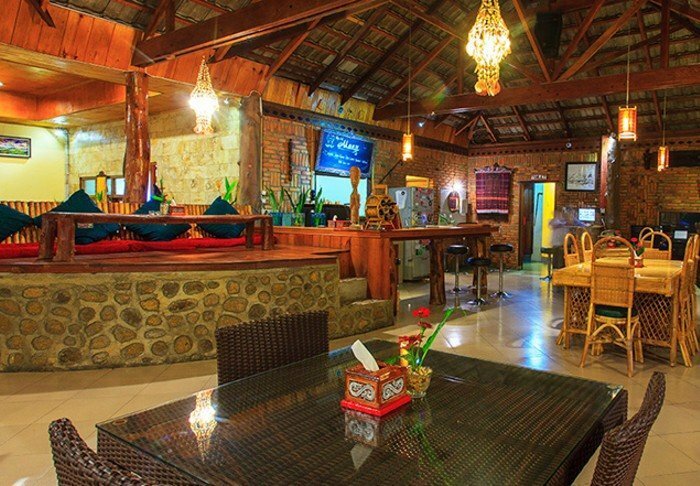 Kinaara has a bar and a restaurant, where you can enjoy colourful drinks as well as local and international cuisine. 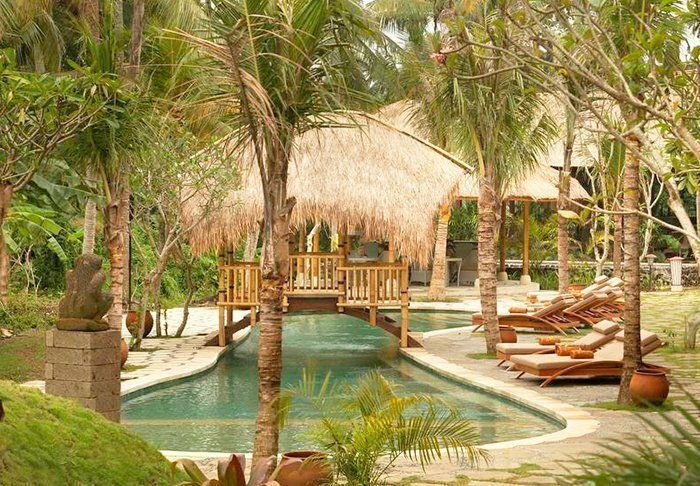 Finally, you can even treat yourself to a real Balinese massage at the spa. 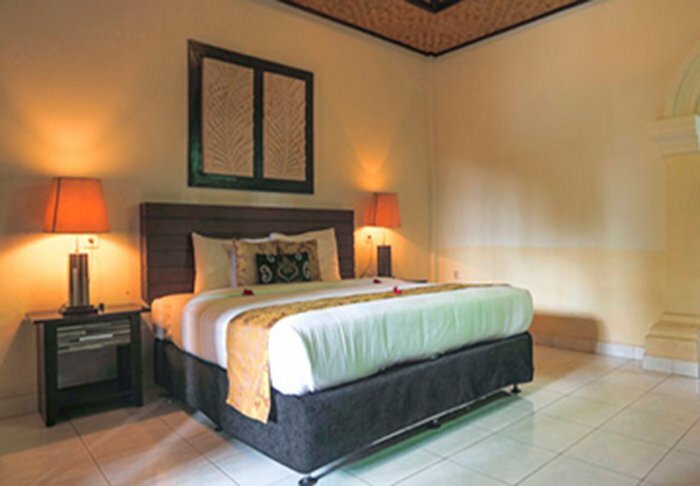 Mimpi Resort Menjangan is located next to the beach in the protected bay of Banyuwedang, with Bali Barat National Park as its nearest neighbour. 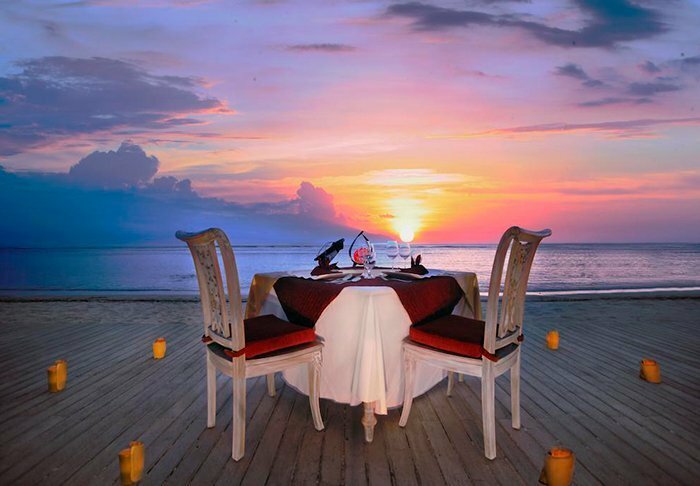 From the resort, there is a wonderful view out over the water, with the mountains on the horizon, and the restaurant is the perfect place to enjoy a truly magnificent sunset. The patio rooms have their own veranda with soft pillows and cushions – ideal for relaxing on after a day packed with wonderful experiences. 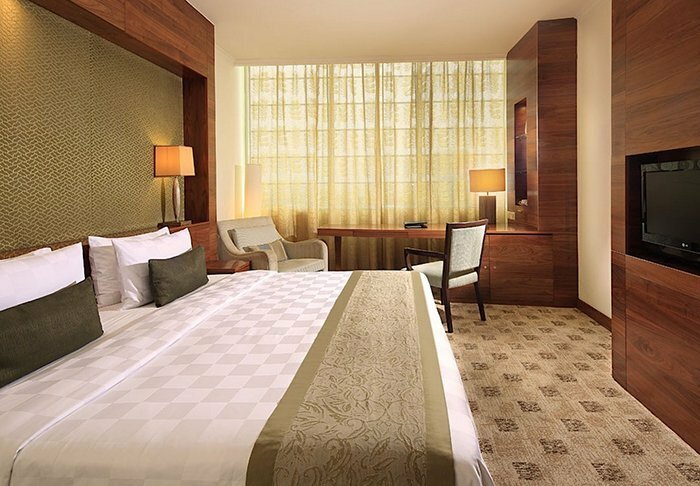 The spacious rooms are light and airy, appointed with wooden furniture and feature a full range of modern facilities. 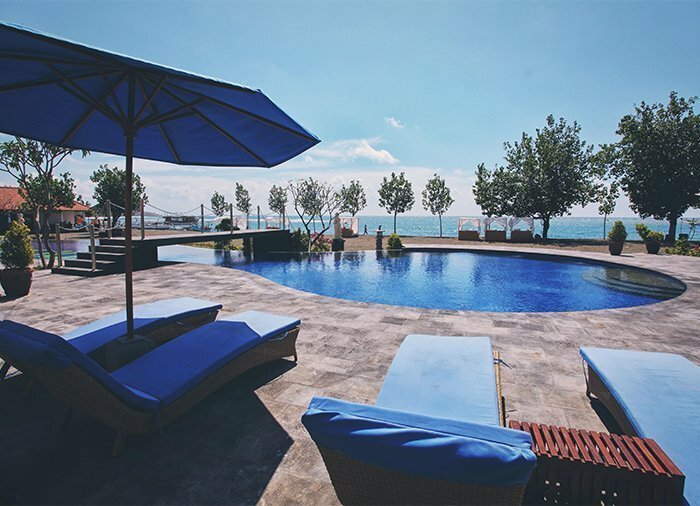 The resort has a pool heated by natural thermal water, as well as a swimming pool, spa (open during the day), diving and snorkelling facilities and, of course, a restaurant and bar. 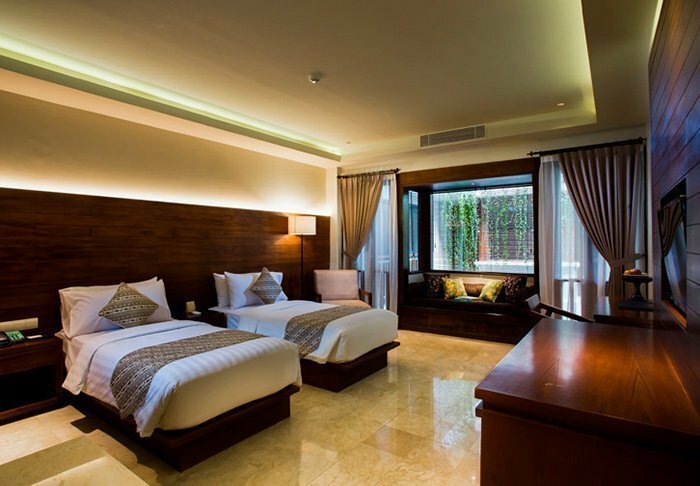 A 5-minute walk from the sandy beach in Sanur is the Abian Harmony hotel. 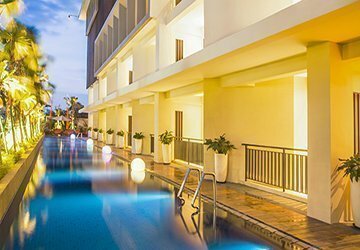 It has all you need for a relaxing beach holiday: an outdoor pool with sun terrace for those who are not big fans of the beach, optional day spa treatments and a host of restaurants and shops right on your doorstep. 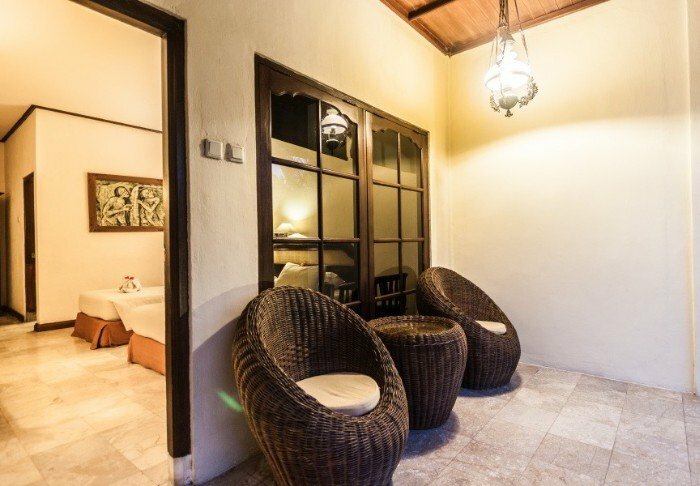 The rooms are cosy and spacious, and all have a private balcony. 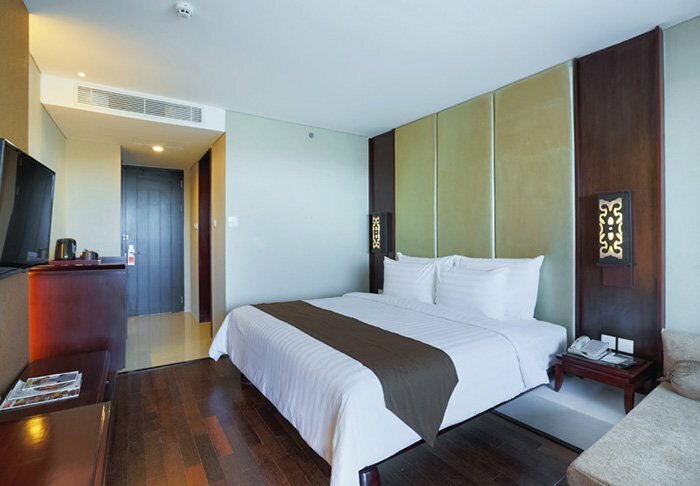 There is Wi-Fi throughout the hotel – in the rooms, too, where you will also find a TV, minibar, tea/coffee making facilities, air conditioning, slippers and a safe. All in all, a wonderful place for a few days’ relaxation. 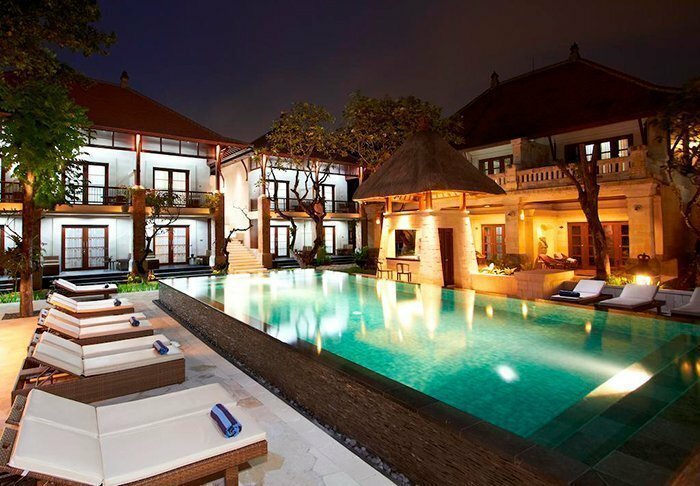 Besakih Beach Resort sits in the beach town of Sanur and is only 5 minutes on foot from the Sindhu market. 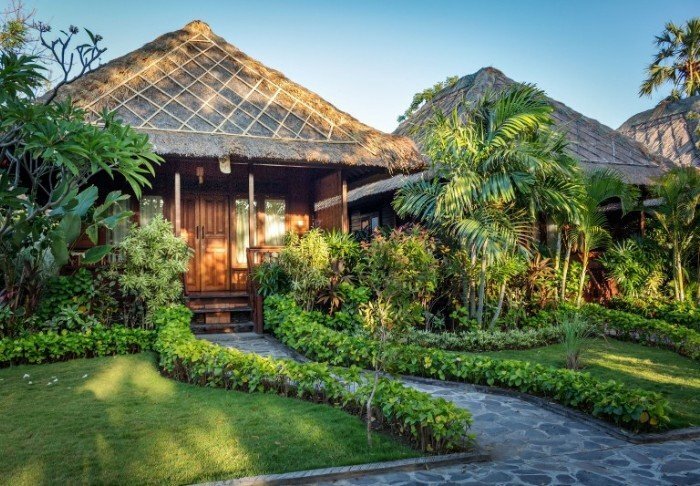 The resort has a total of 80 bungalows in a good mix of traditional Balinese architecture and modern facilities including Wi-Fi, air conditioning, TVs, telephones, minibars and hair dryers. 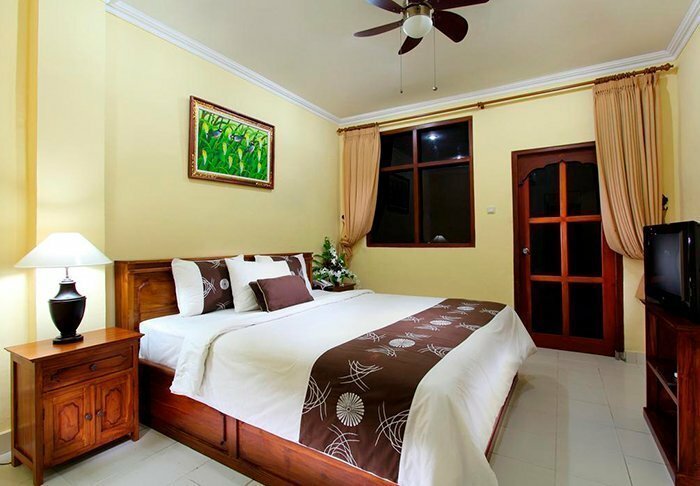 Each room has its own terrace or veranda with a view of the tropical garden. 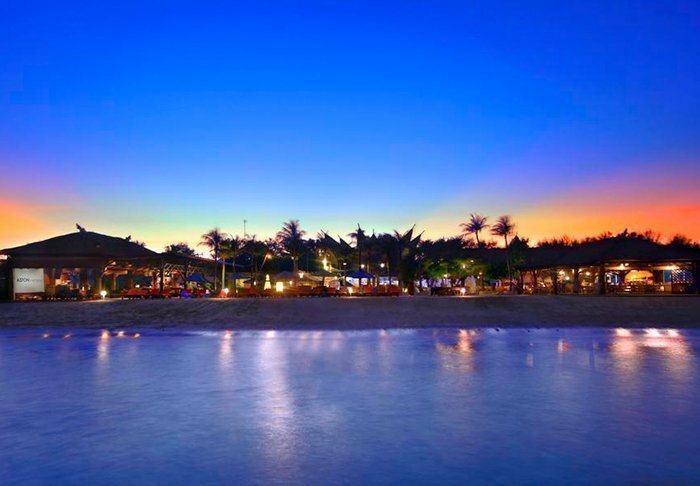 Besaikh Beach Resort is about 1 minute on foot from the private beach area, where you can enjoy Sanur’s delightful sandy beach and take part in various water sports activities. 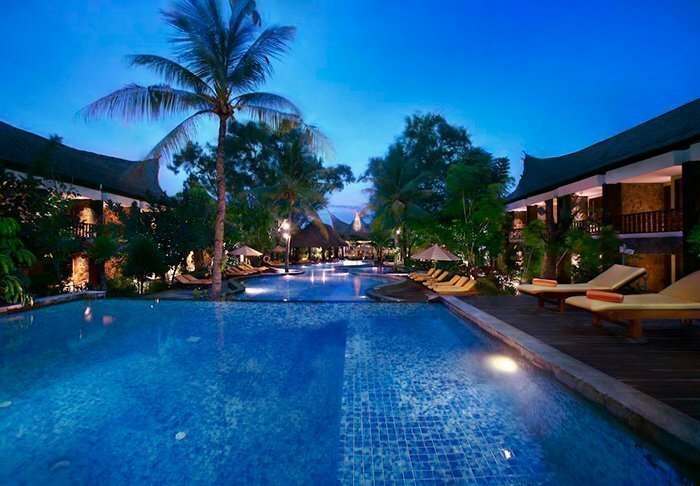 The resort also features two swimming pools and a spa area. 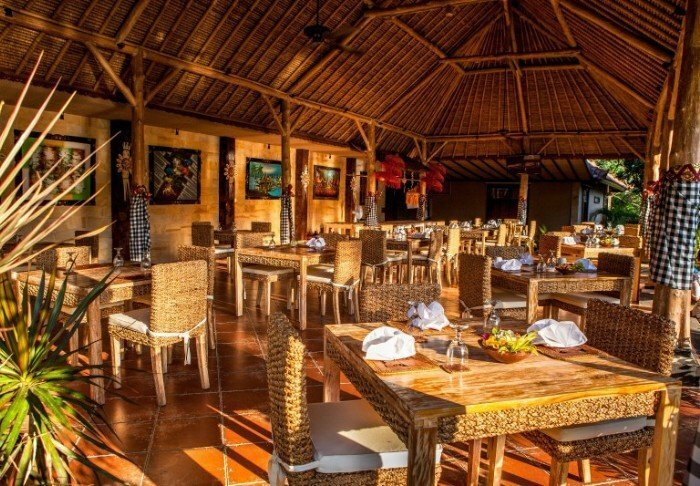 At the Nirvana restaurant, located right on the beach, you can enjoy fish and shellfish as well as Indonesian and European cuisine. 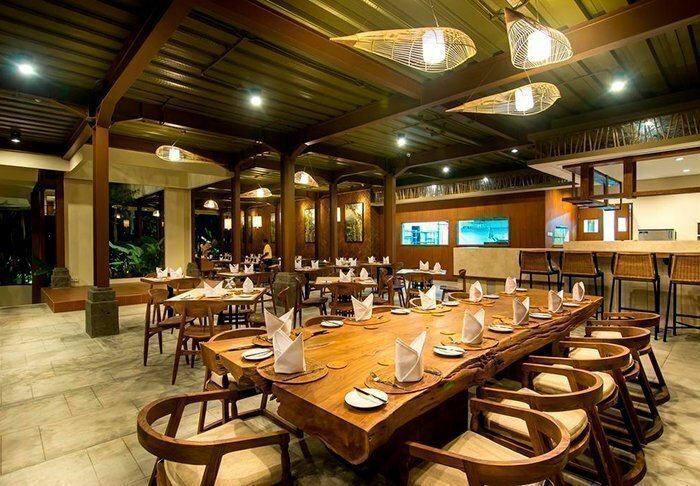 The resort’s other restaurant offers grilled foods and BBQ. 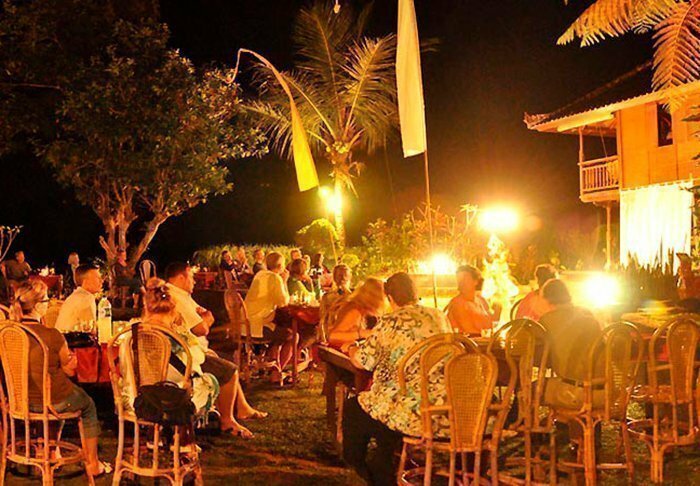 There is a Balinese night twice a week, featuring a buffet and traditional dance. 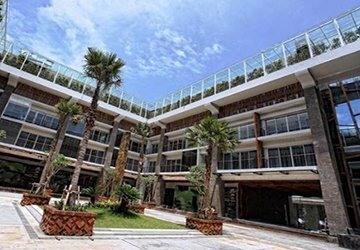 Griya Santrian is a fabulous 4-star hotel located right on the beach, walking distance from the local shops, restaurants and markets. 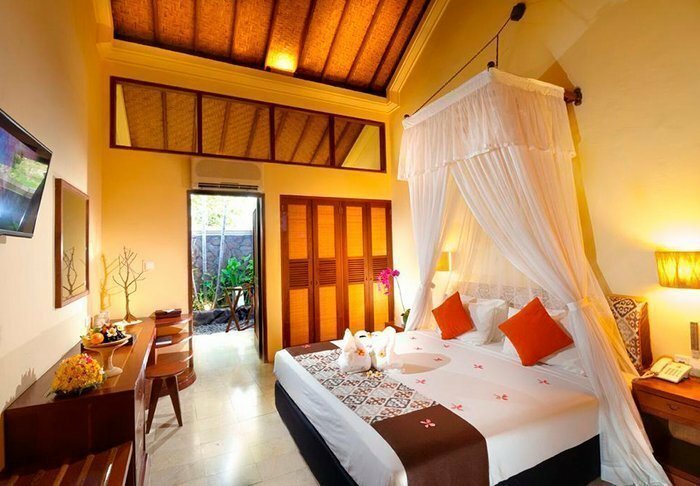 The rooms, which are decorated in traditional Balinese style, are located in the beautiful tropical garden. 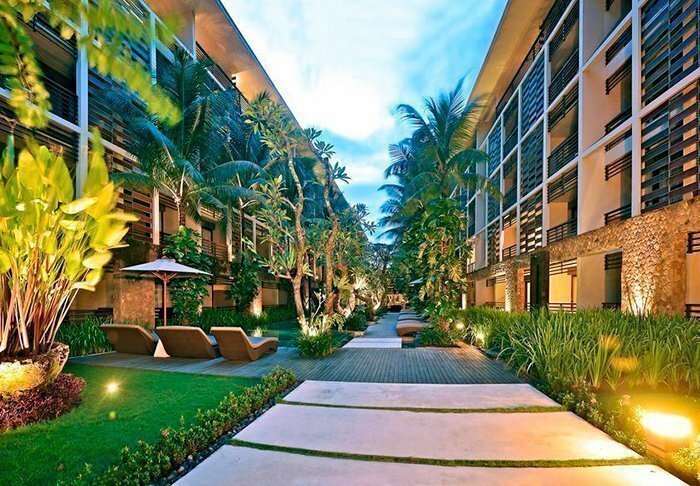 They are all spacious, each one with a terrace or a balcony overlooking the lush garden and/or pool. 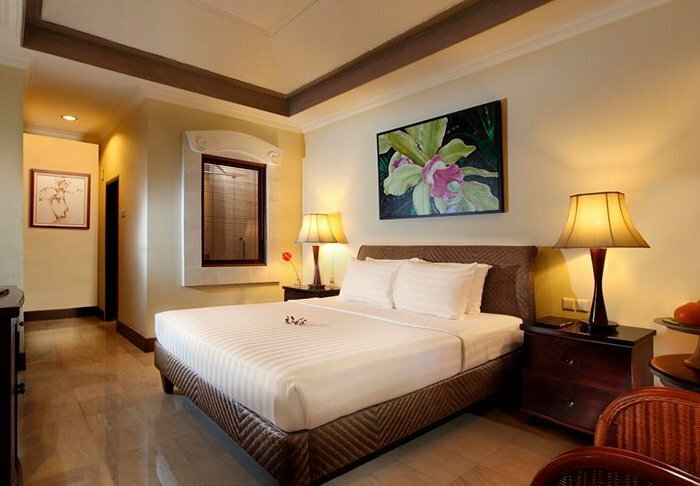 All rooms are equipped with Wi-Fi, air conditioning, a TV and minibar. 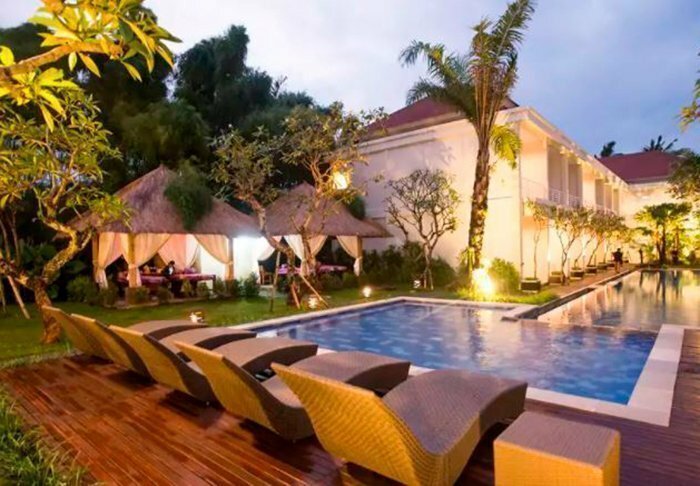 The hotel’s rooms are just a few steps away from one of the hotel’s three pools, where you can swim, sunbathe and lie in the shade under an umbrella and read a good book. 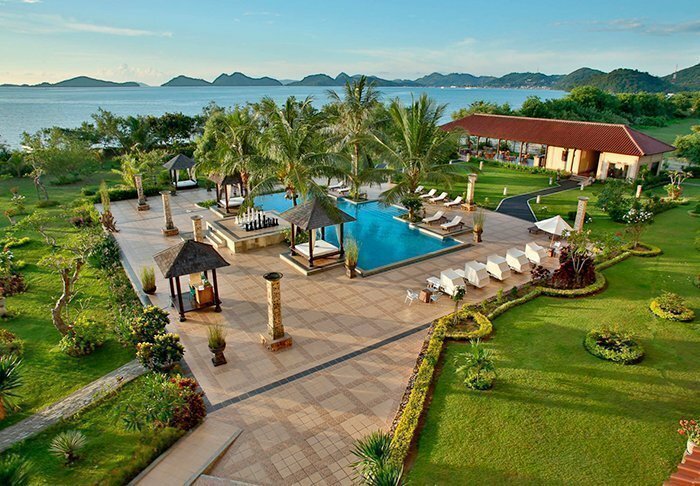 At the largest pool, you can enjoy a refreshing drink at the pool bar. 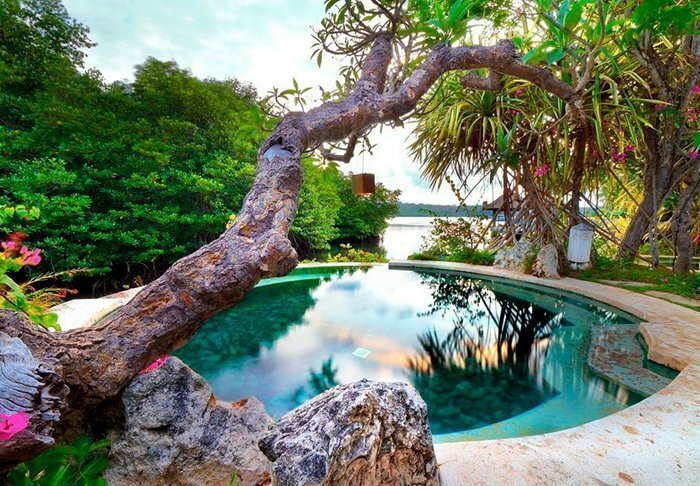 If you’re not much of a pool person, you can head for the fine golden sandy beach and swim in the calm waters of the lagoon. 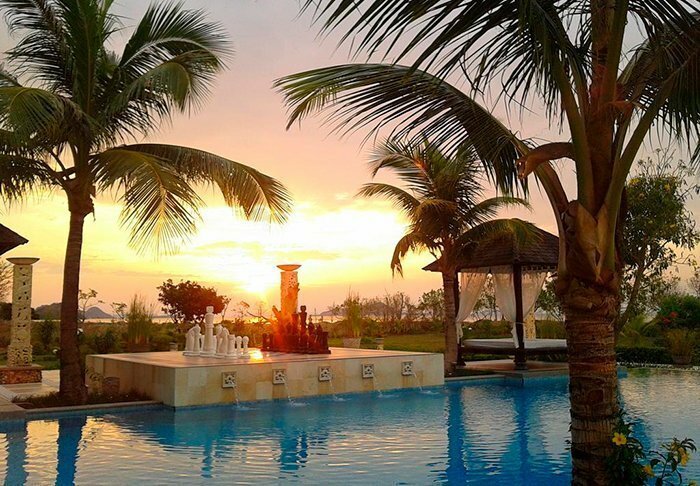 In the evening, you can enjoy the spectacular scene of the sun going down over the Indian Ocean. 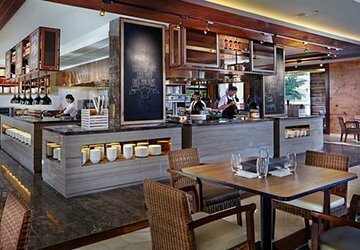 The beach restaurant, Wantilan, serves both eastern and western dishes, accompanied by live music, as the icing on the cake. 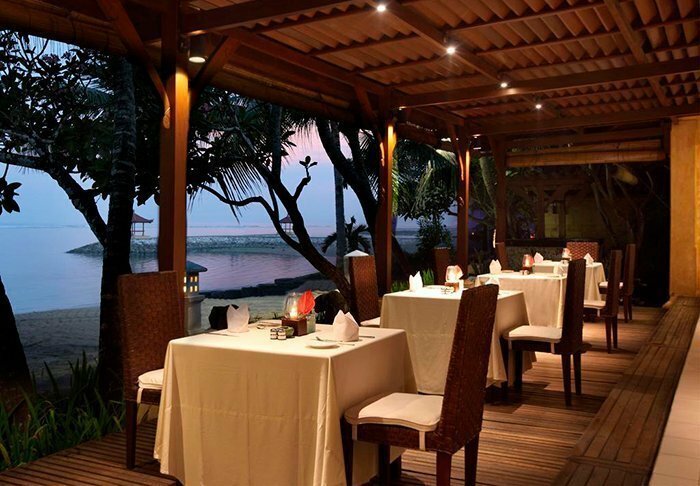 At the outdoor Griya Beach Corner restaurant, a mix of Italian and Japanese dishes are served. If a little “me time” is calling, you can treat yourself to beauty and massage treatments from top to toe at the hotel’s day spa. 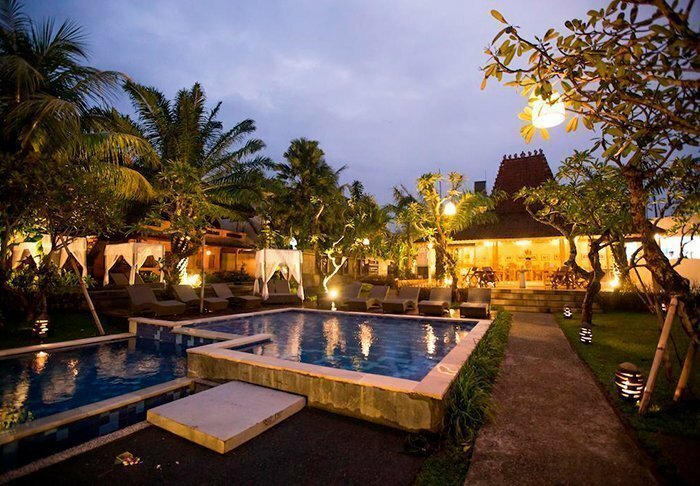 Parigata Resorts and Spa is located in the centre of the fishing village of Sanur, approx. 20 minutes by car from the airport. 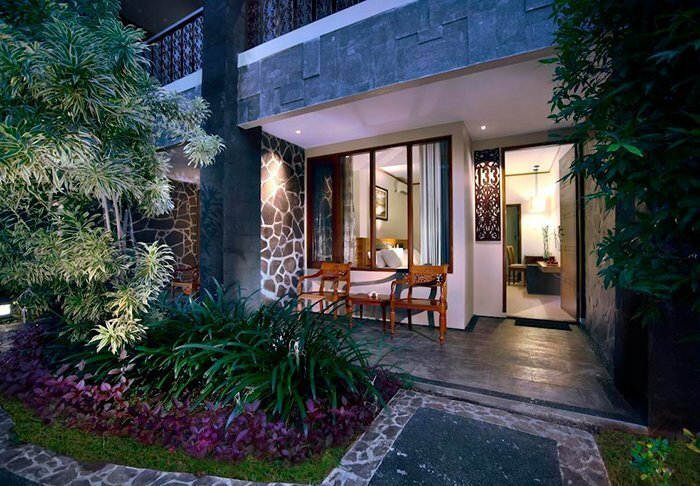 The charming boutique resort is set in a large tropical garden, just a 5-minute walk from the sandy beach of Sanur. 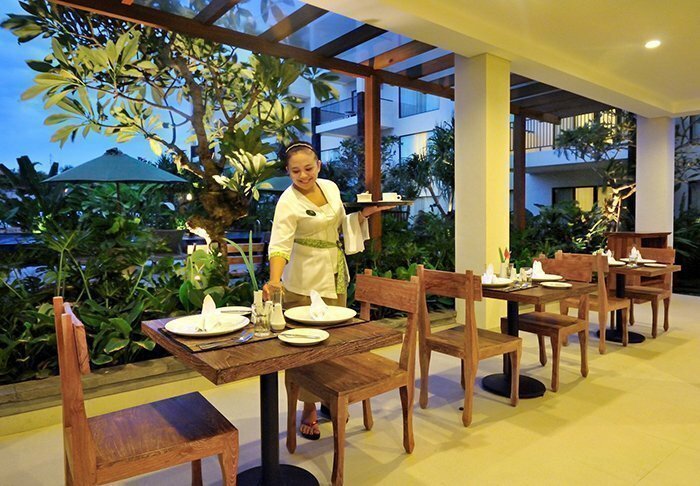 Just outside the resort, there are numerous restaurants, cafés, small shops and street kitchens. 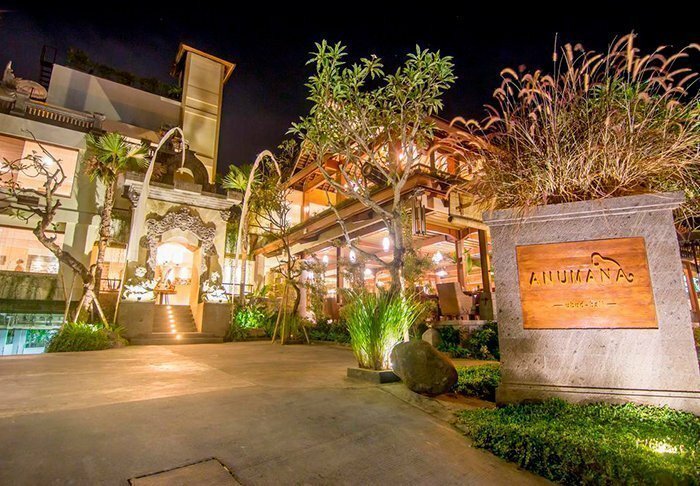 The resort is imbued with authentic Balinese ambience, and its buildings are beautifully shaped in typical, local village style. 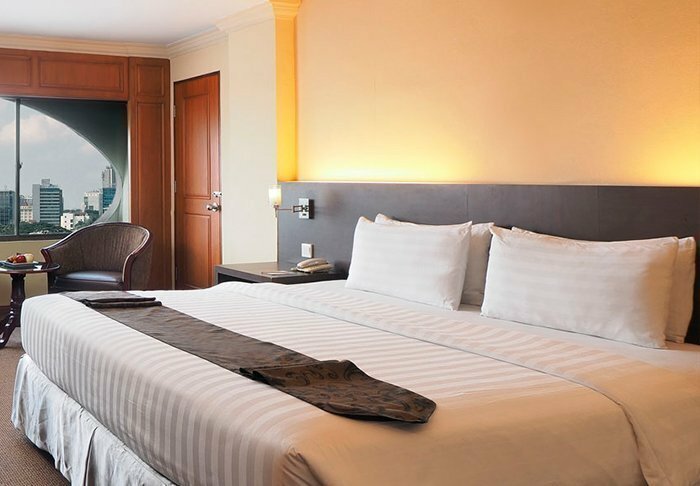 The de luxe rooms are positioned on the ground floor, with direct access to the swimming pool. 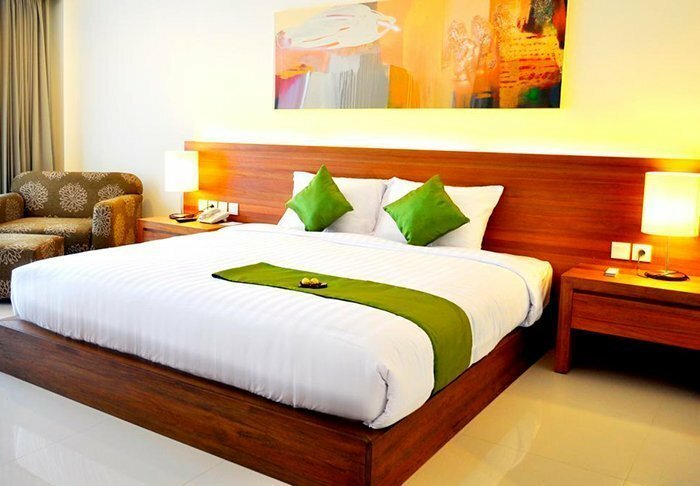 The rooms are spacious, simply furnished in modern style, with a full range of facilities. 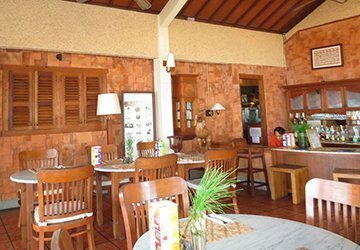 They have their own terrace, with light wicker chairs or authentic wooden furniture. 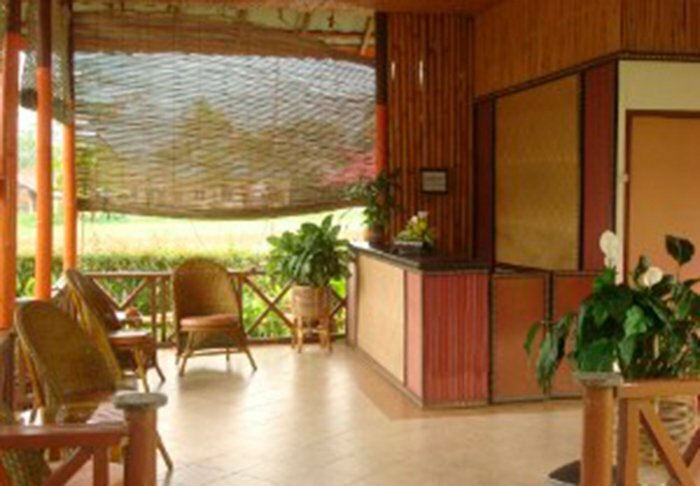 Facilities at the resort include a spa, restaurant and bar. The friendly staff are extremely helpful. 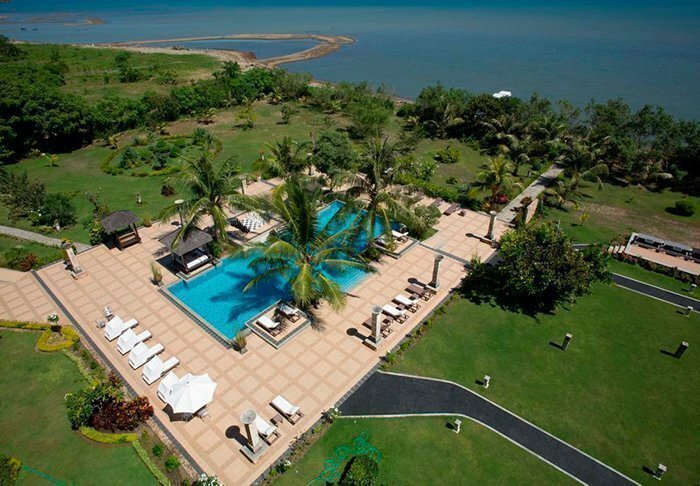 All in all, this is the perfect place to spend a few relaxing days. 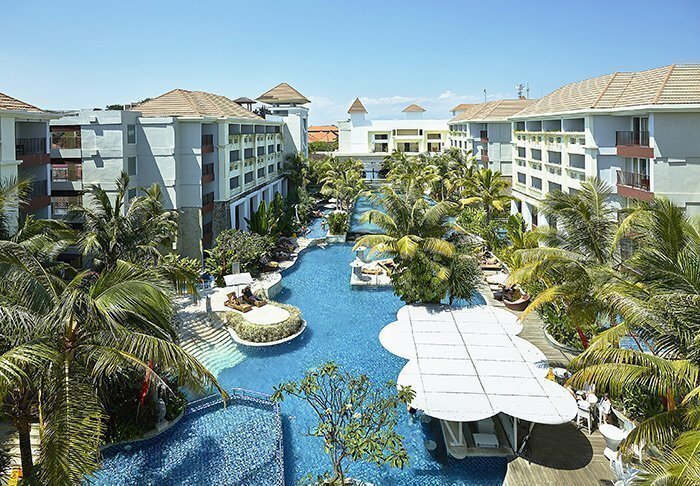 Puri Santrian is a beautiful 4-star resort adjacent to a 200-metre-long private beach in Sanur. The water is calm, making the beach incredibly child friendly. 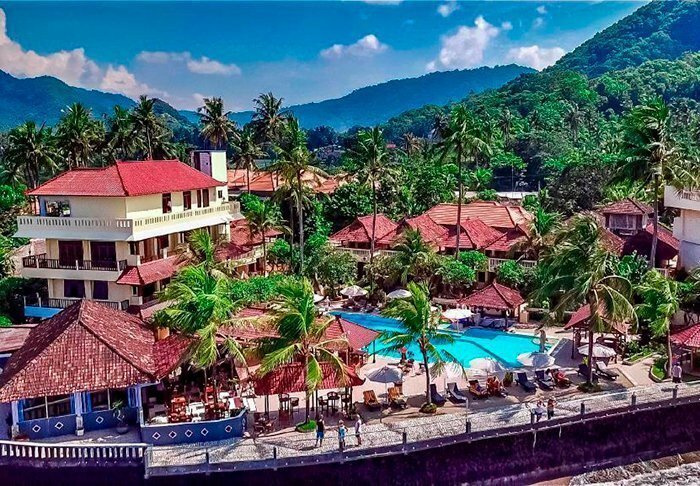 The hotel offers a wide range of water sports, but it goes without saying that you can also choose just to lie back and relax on a sun lounger in the shade of the palms. 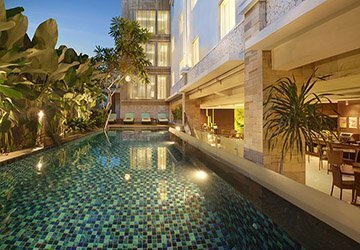 If swimming in a pool is more your thing, you won’t be disappointed at Puri Santrian – the hotel has two pools, accommodating children and adults. 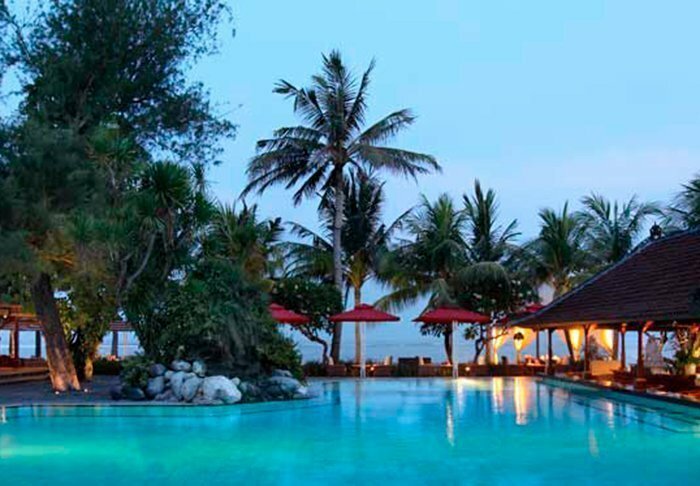 Swim over to a sunken pool bar and enjoy a cocktail in the sunshine to really get you in the holiday mood! 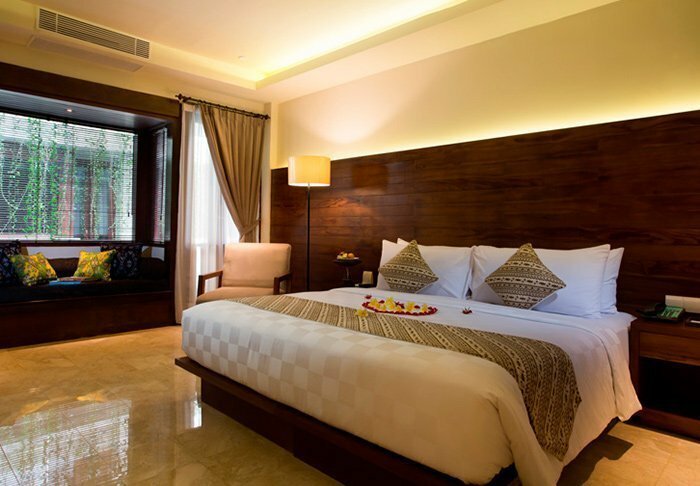 The rooms are spacious and pleasantly appointed, with air conditioning, TV, minibar and a private balcony. 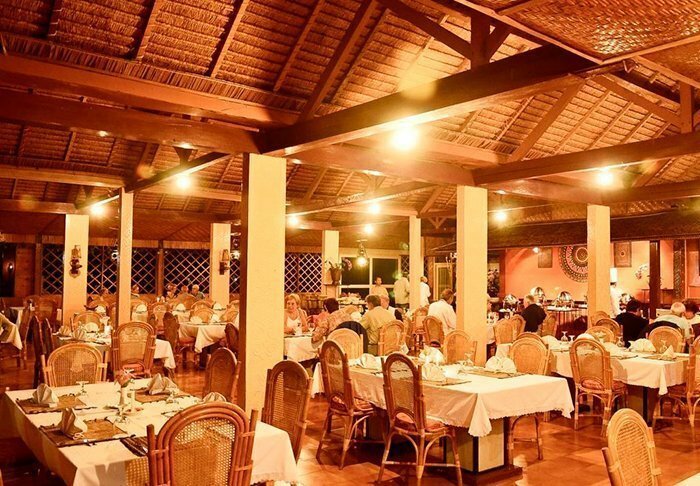 The restaurant is located right on the beach, and it is possible (for a fee) to arrange a completely private romantic dinner on your balcony or perhaps on a secluded area of the beach. 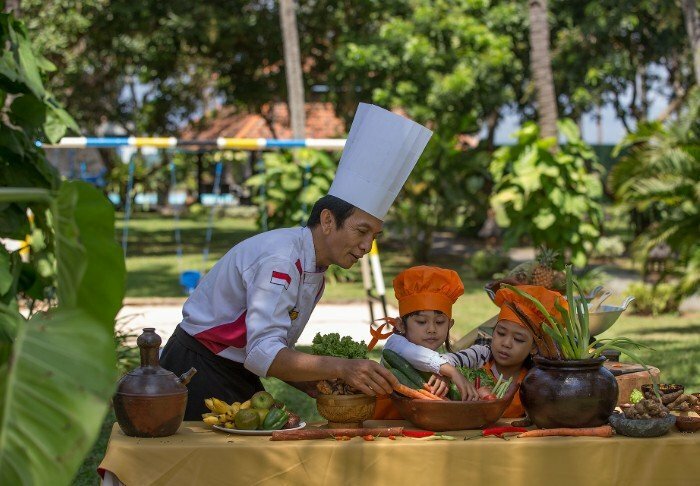 In the morning (Monday–Friday), you can enjoy free yoga classes and Balinese cookery classes (fee applies). 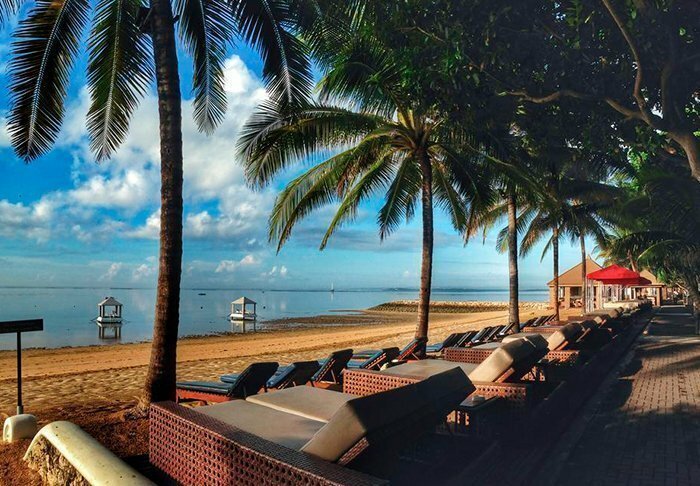 At Swissbel Resort Watu Jimbar you are close to restaurants, shops and Sanur’s golden sandy beach, where you can enjoy the sun from one of the free sun loungers. 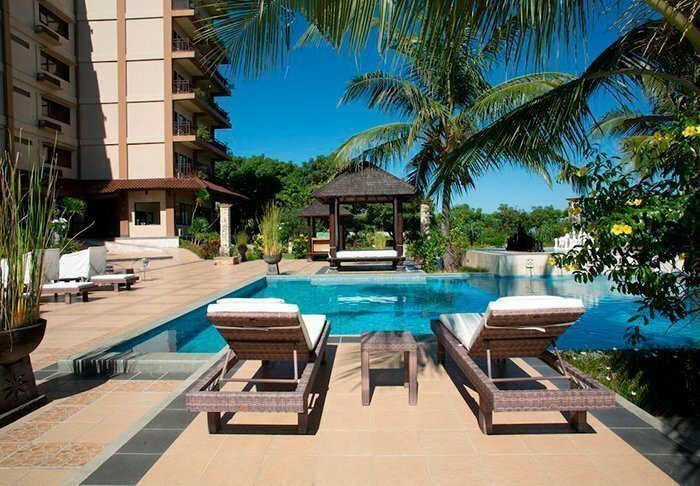 The resort has 306 spacious rooms with balconies overlooking the pool. 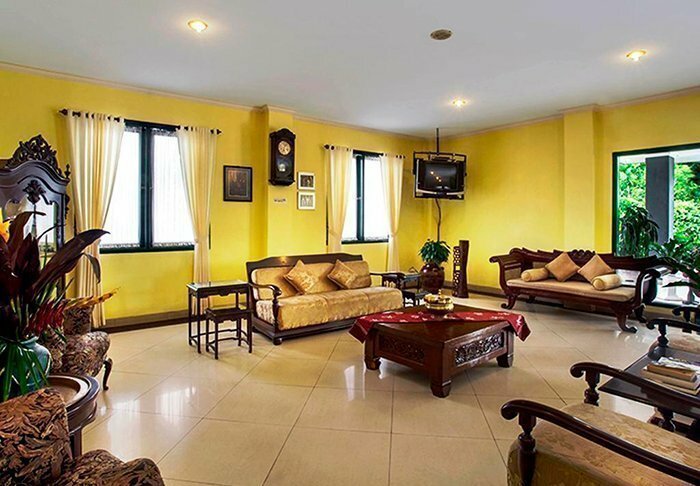 The rooms are decorated in warm, earthy colours and are equipped with Wi-Fi, air conditioning, safe, minibar, TV, coffee and tea making facilities and a hair dryer. 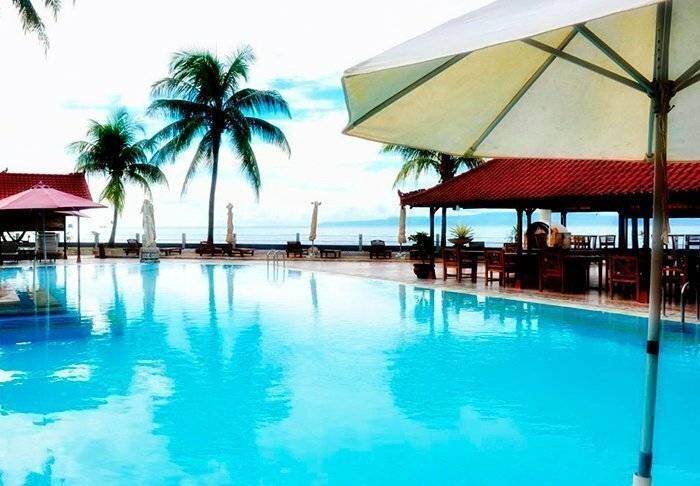 If you are not big on beaches, you can enjoy the resort’s large swimming pool with its sun loungers and pool bar, or relax under a swaying palm and read a good book. In need of some “me-time”? Then treat yourself to a massage at the day spa. And for those who like to keep fit when they’re on holiday, there is also a gym. 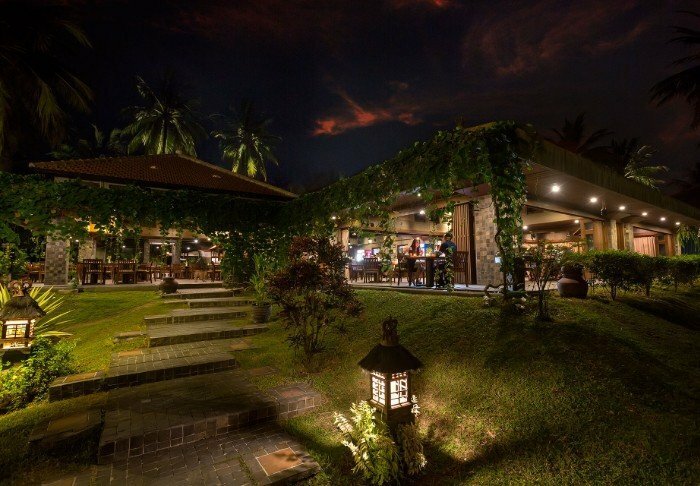 The Swiss-Café al fresco restaurant serves both Asian and Western dishes. 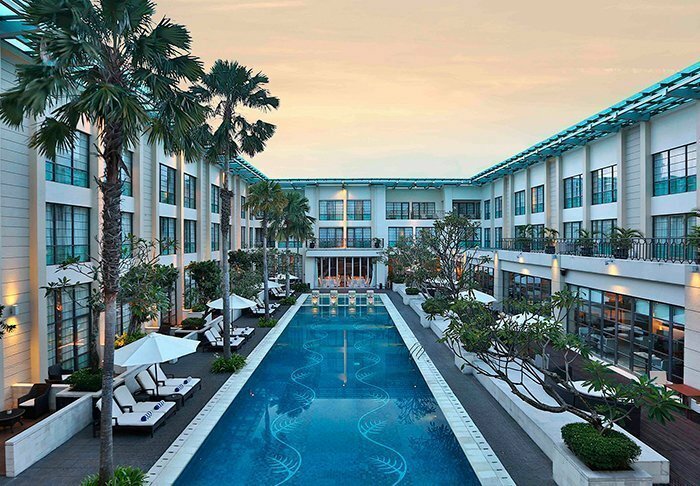 A 10-minute walk away from the beach in Sanur is where you will find this good 3-star hotel. If you don’t feel like walking to the beach, you can make use of the hotel’s shuttle service. 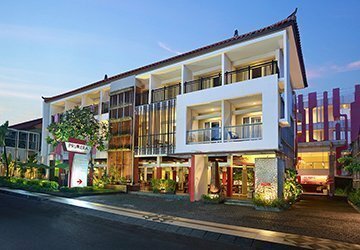 The high street in Sanur is a mere stone’s throw from the hotel, so you are within really easy reach of shops and restaurants. 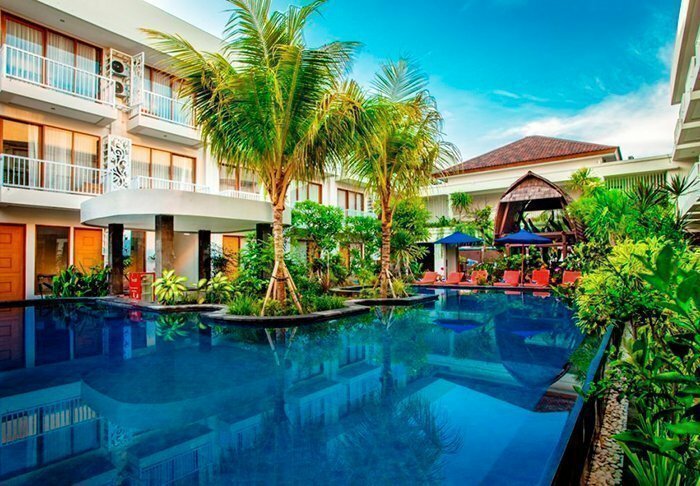 The hotel has a large pool and a smaller children’s pool. It also has a lovely green garden with plenty of space to enjoy the sun and shade. 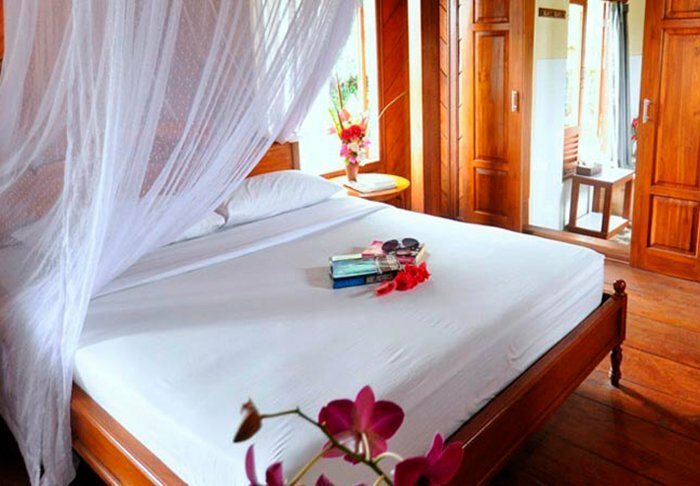 The rooms are large and well-appointed, and all have a balcony or terrace. 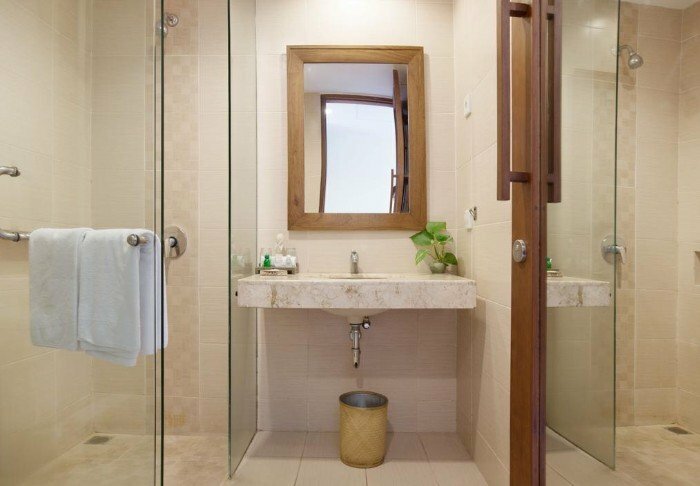 Naturally, all have an en suite bathroom/toilet, TV, air conditioning, coffee/tea-making facilities and a minibar. 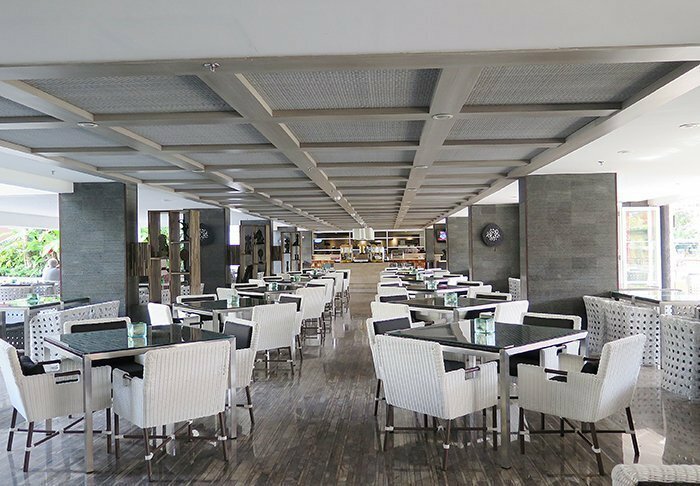 There is a restaurant at the hotel and Wi-Fi in the communal areas. 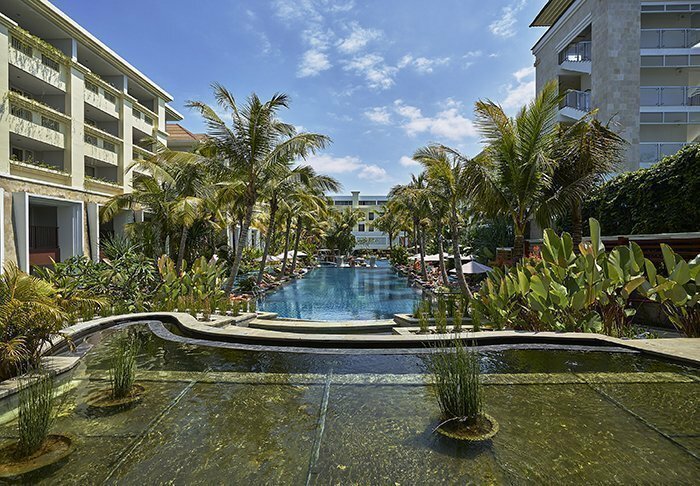 The Oasis Lagoon sits at the heart of Sanur and is surrounded by restaurants, shopping centres and crafts shops. 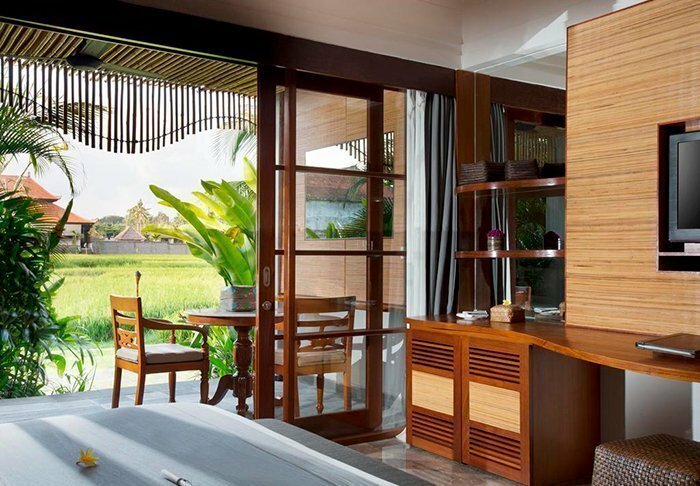 A new era of Balinese architecture can be seen in the hotel’s combination of modern comfort and gorgeous teak furniture. 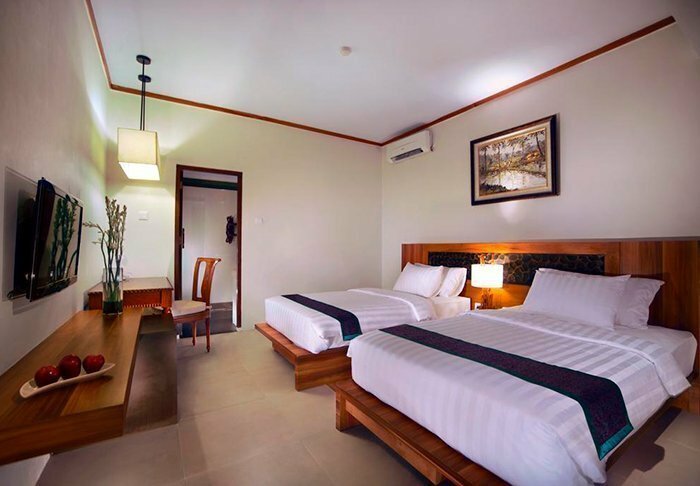 The rooms are beautiful, comfortable and spacious, and all feature free Wi-Fi, air conditioning, TV, a safe, minibar, tea and coffee facilities, telephone and hair dryer. 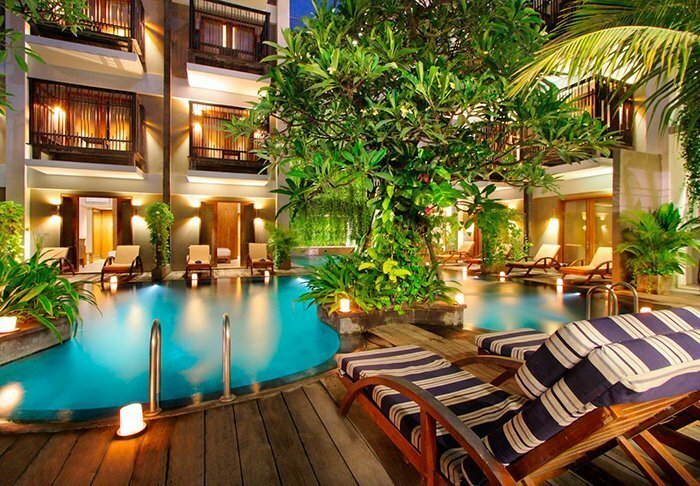 You have a view of the pool from your private “lesehan” balcony. 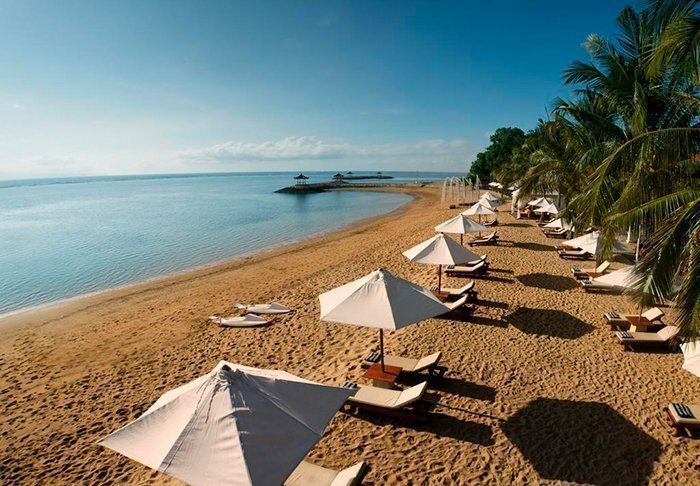 The hotel’s beach club is a 7-minute walk away, and loungers, parasols and towels are available there. If you would prefer to skip the walk, a shuttle bus is available from the hotel. 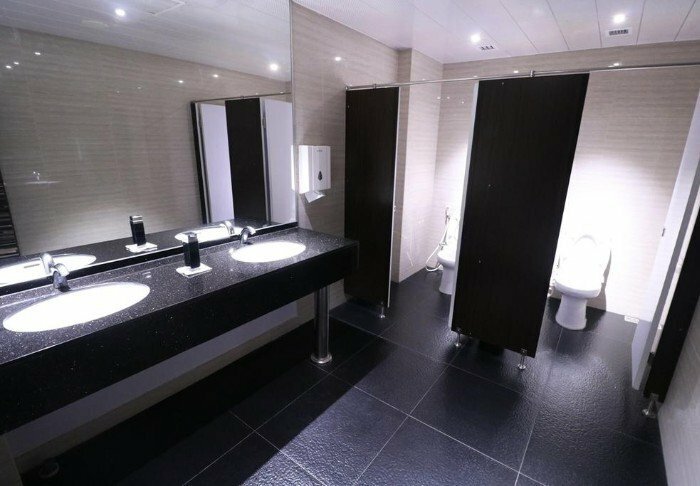 Further facilities include a spa and bicycle rental, as well as a bar and restaurant with Asian and international cuisine. The Oasis Lagoon is also very helpful in arranging excursions. 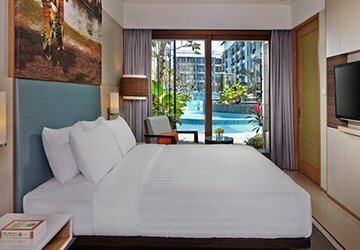 The 4-star hotel The Haven Bali Seminyak is located in the centre of Seminyak, close to shops and markets ideal for shopping, yet just a 10-minute walk from the beach. If you would prefer to skip the walk to the beach, a shuttle bus is available from the hotel. 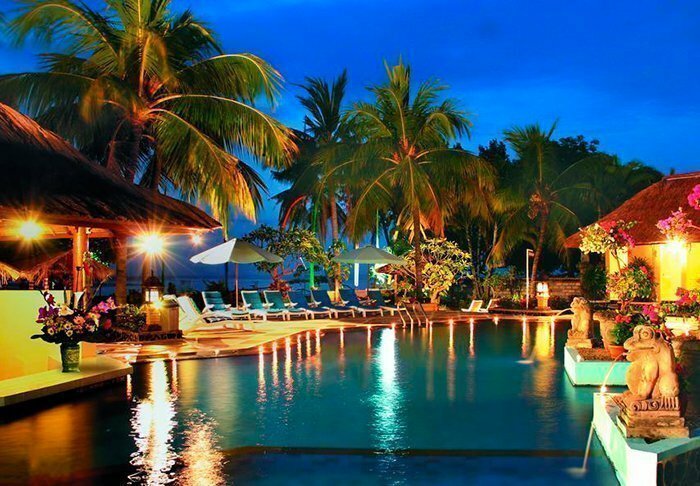 You are also welcome to use the large swimming pool, which has a bar where you can buy drinks and snacks. 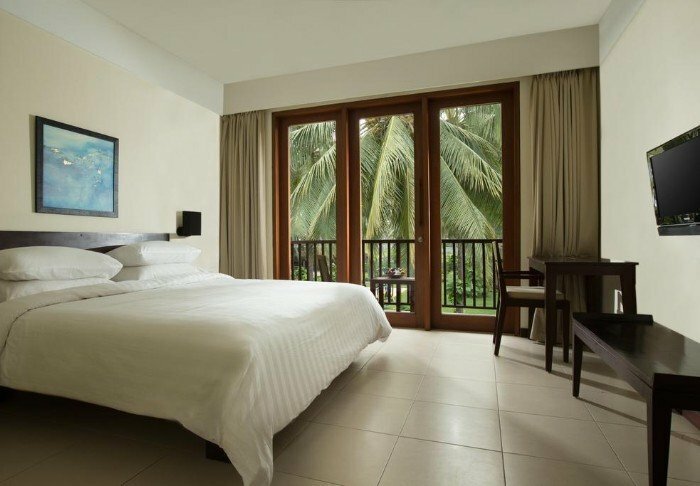 The stylish, simple décor of the rooms is enhanced by the natural light coming from the large windows and the private balcony. 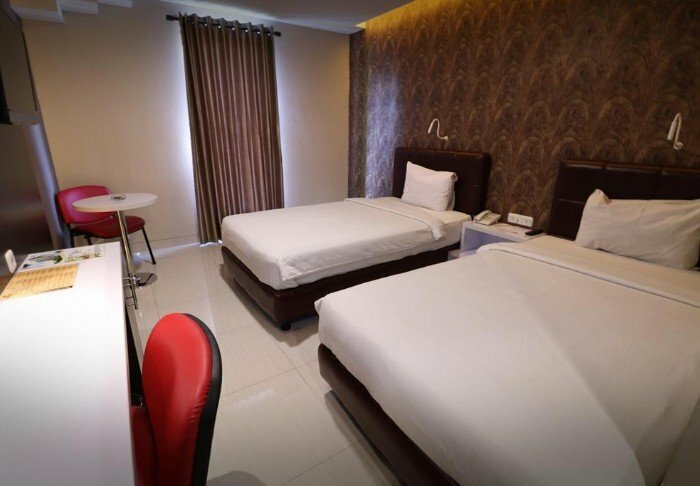 All rooms are equipped with tea/coffee making facilities, a mini bar, a ceiling fan, a safe, TV and free Wi-Fi, as well as a bathroom with bathtub, hair dryer and make-up mirror. 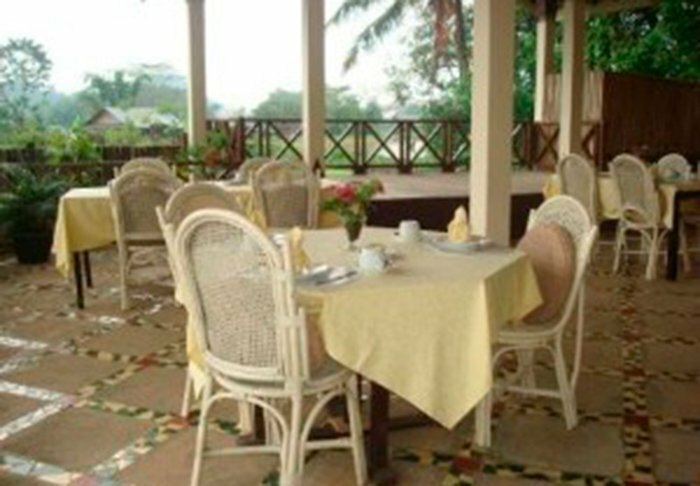 Breakfast can be enjoyed outside in the hotel’s restaurant, where other meals can also be purchased around the clock. And why not treat yourself to a beauty treatment and massage at the hotel’s day spa or take advantage of the gym facilities for a workout? 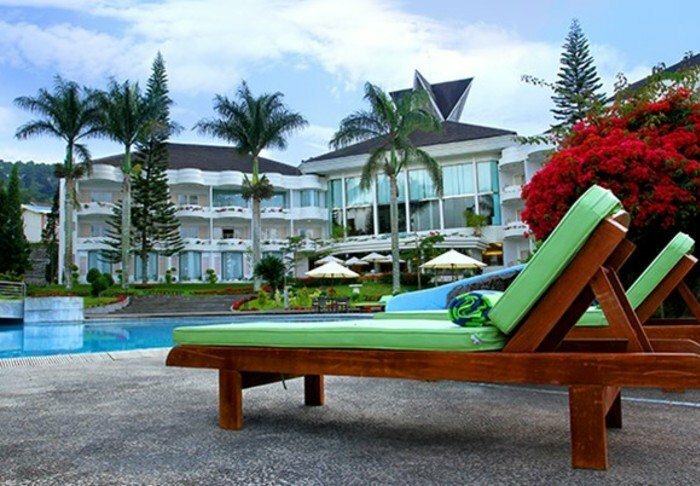 The Haven Bali Saminyak is also happy to help arrange excursions. 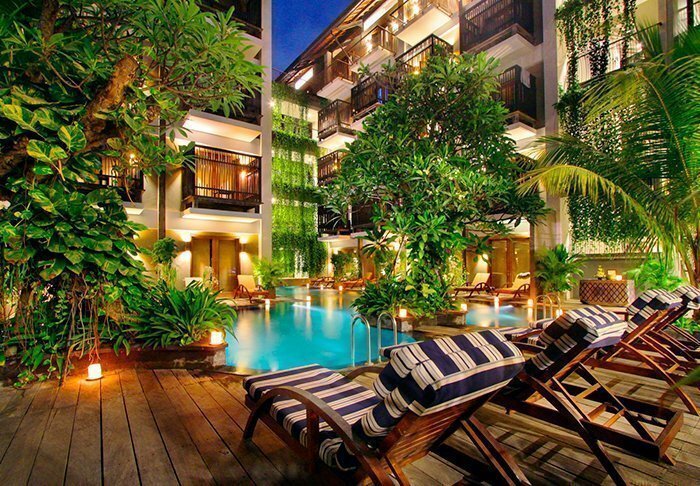 In the heart of Seminyak, on one of the town’s main streets, is where you will find this fabulous 5-star hotel. 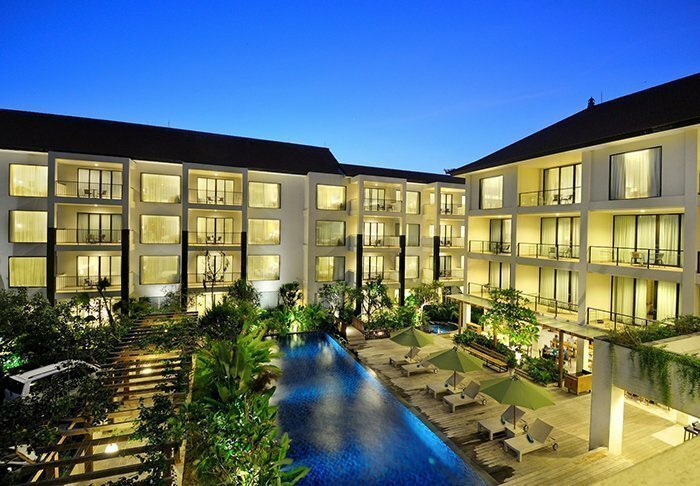 Its 290 rooms have a sophisticated design, infused with classic Balinese charm. 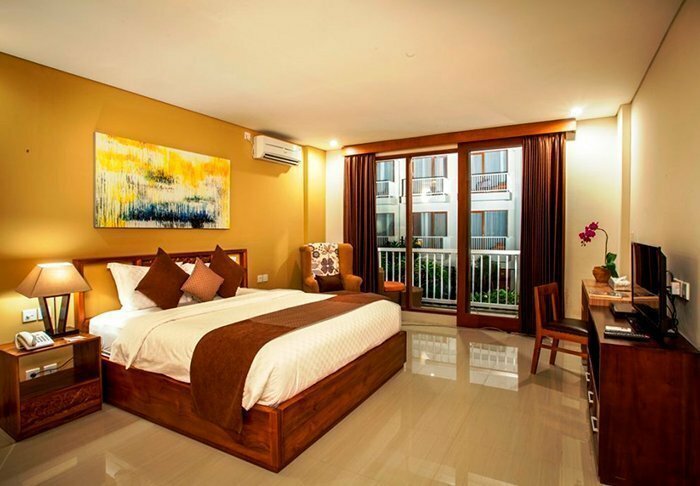 The rooms are spacious and equipped with free Wi-Fi, TV, iPod docking station and a private balcony. 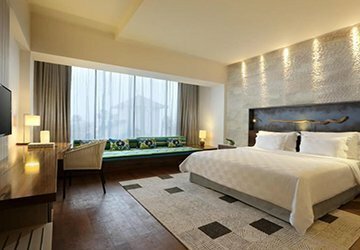 The Courtyard by Marriott has everything you could wish for – in fact, you almost don’t need to leave the hotel to enjoy a perfect holiday. 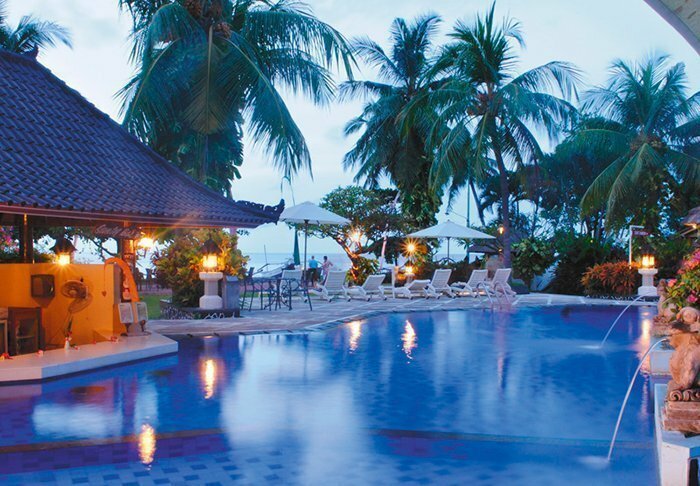 If you need a refreshing dip, the hotel has three pools, one of which has a pool bar. 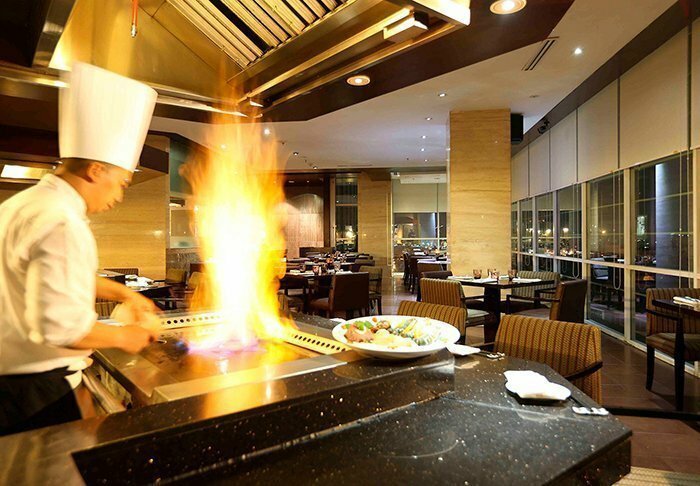 When hunger strikes, you have three restaurants to choose from serving international dishes. If you have children with you on holiday, they are bound to love the hotel’s Kids’ Club, and if you all have a lie in one day, never fear: the hotel serves breakfast around the clock! The day spa offers facials and the most wonderful, relaxing massages. If activity is more your style, you can make use of the hotel’s gym. 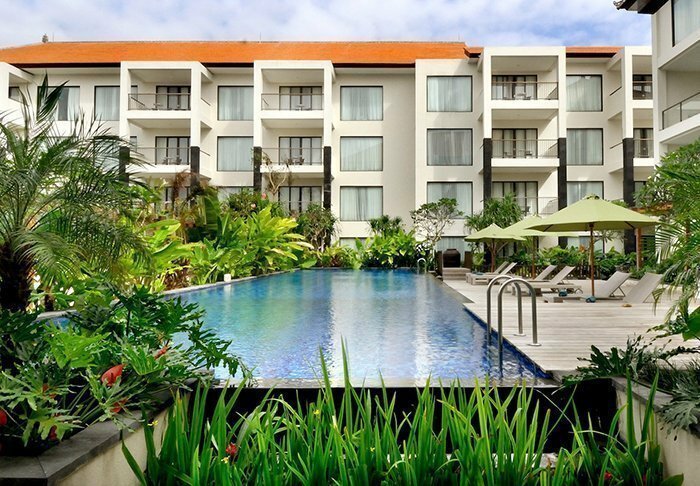 This well-appointed hotel is just 10 minutes’ walk from the beach and 5 minutes from one of the most exciting and vibrant main streets in Seminyak. 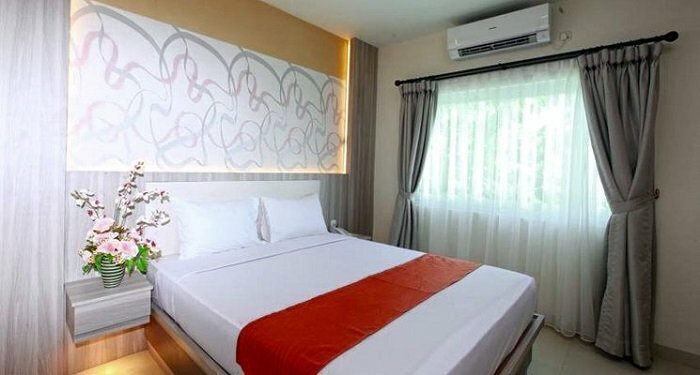 The rooms have a bright, contemporary design, all with Wi-Fi, air conditioning, TV, telephone, minibar, tea/coffee making facilities, safe and en suite bathroom with hairdryer. 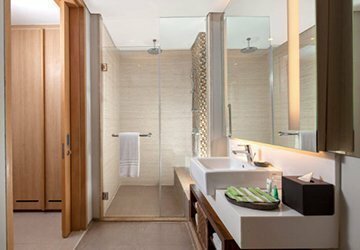 Guests at Harris can enjoy a swim in the pool, a massage at the day spa and a workout in the gym. 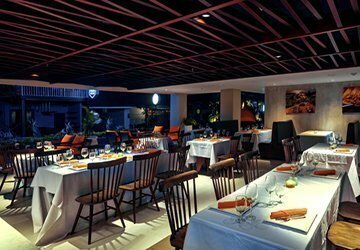 The hotel also has a restaurant and bar. 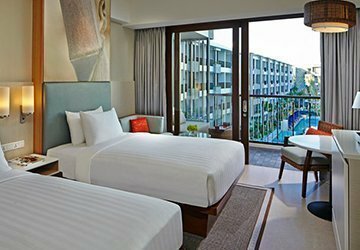 This cosy, modern 3-star hotel is a 10-minute walk from Seminyak beach. Right on your doorstep, you’ll find shops and restaurants. 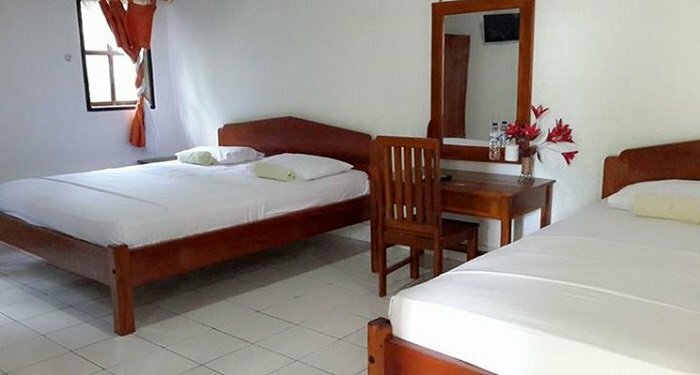 All rooms are simple but pleasantly and modernly decorated, with free Wi-Fi, air conditioning, TV, safe and an en suite bathroom. 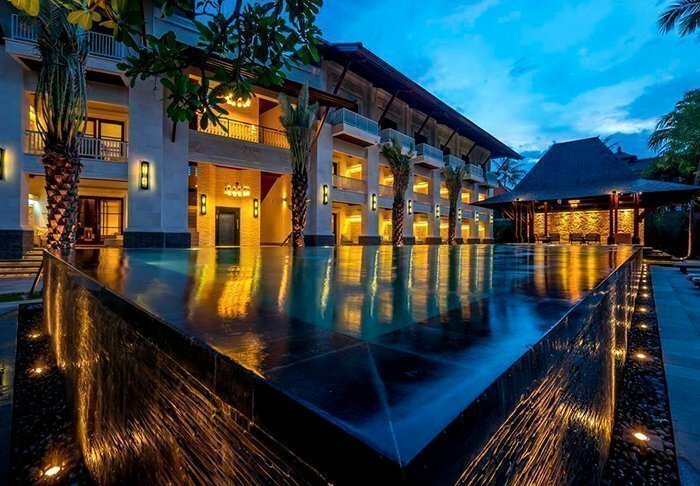 The hotel has a swimming pool, day spa and a restaurant and bar. 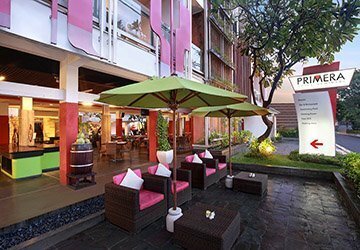 Seminyak Paradiso is a 3-star hotel located in the hip town of Seminyak, close to restaurants, galleries and great shopping opportunities. 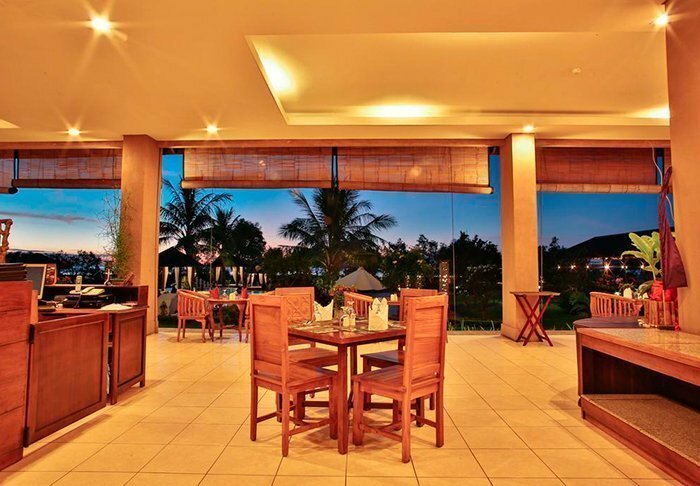 The hotel is walking distance from the famous sandy beach, 15 minutes from the Kuta area and 25 minutes from the airport. 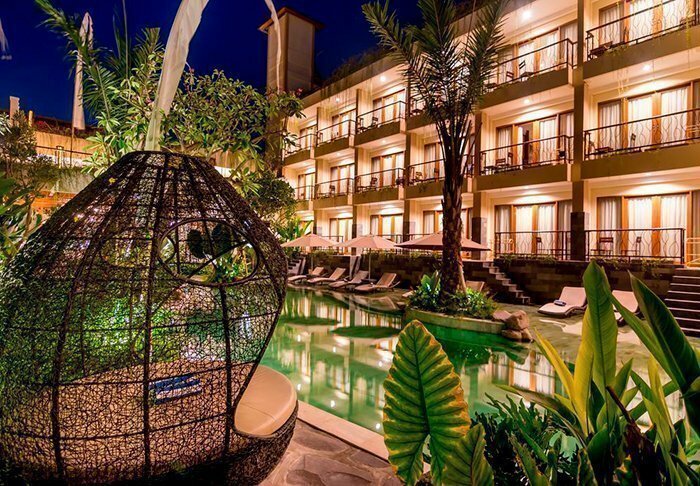 The rooms overlook the hotel’s tropical, landscaped gardens and are decorated in Balinese style. 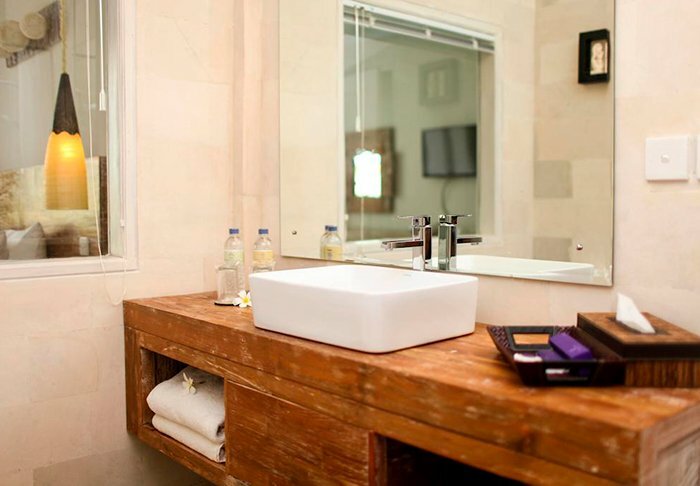 Every room is equipped with air conditioning, a minibar, a TV, a telephone and coffee and tea-making facilities. 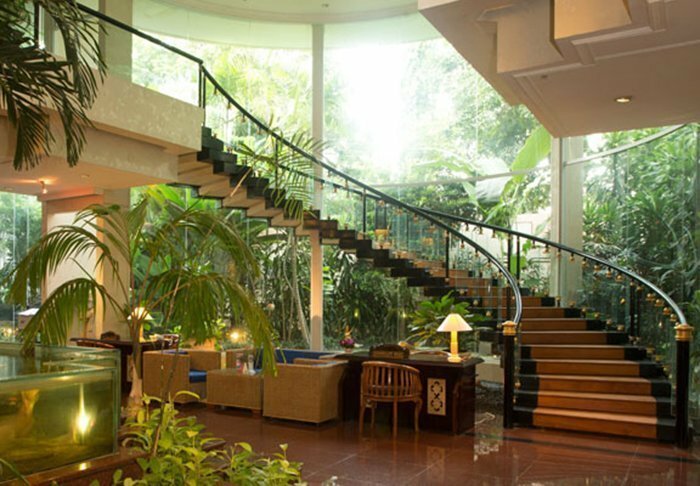 On the balcony, you can sit in the shade of the trees and relax in the peaceful surroundings with a good book. 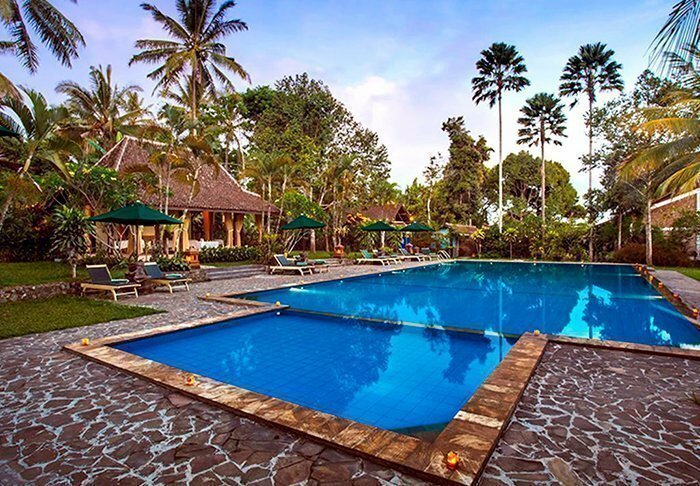 If you need a refreshing dip, you can jump into the pool and round off your swim with a little refreshment, hot or cold, which can be purchased at the bar, which serves snacks and drinks. 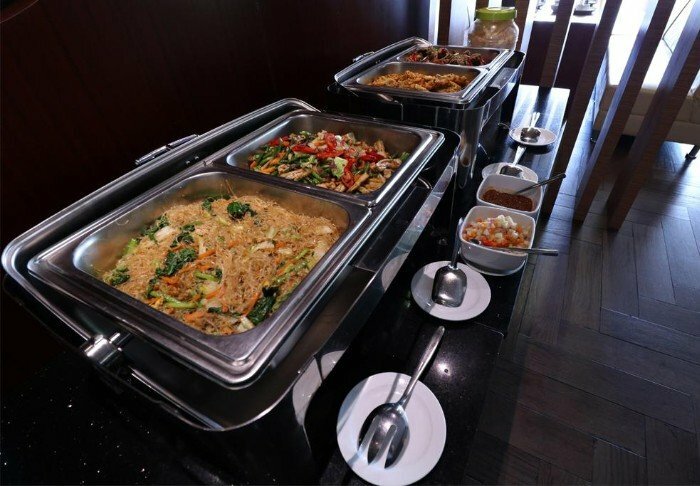 Free Wi-Fi is available in the lobby and in the restaurant, where you can also enjoy delicious European, Chinese and Indonesian dishes. If your aching muscles need soothing, why not treat yourself to one of the wide range of massages offered in the day spa? 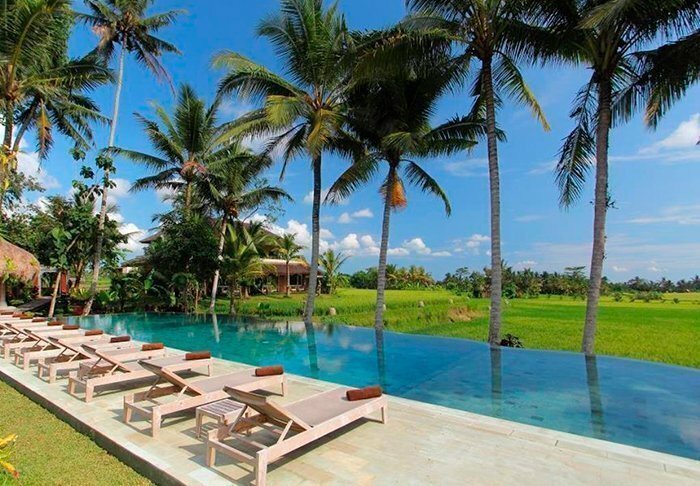 At the northern end of Seminyak is Tony’s Villas and Resort, a 4-star hotel. 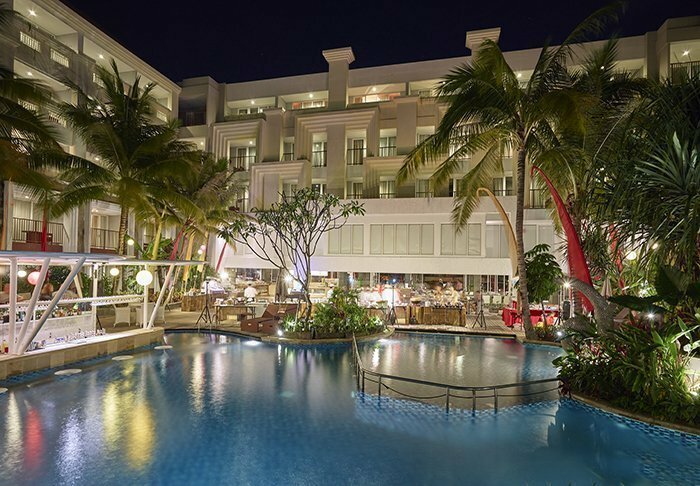 The hotel is some distance away from the busiest part of Seminyak, but it offers a great selection of restaurants and shops just outside the door, not to mention Petitenget Beach, just 600 metres away from the hotel. 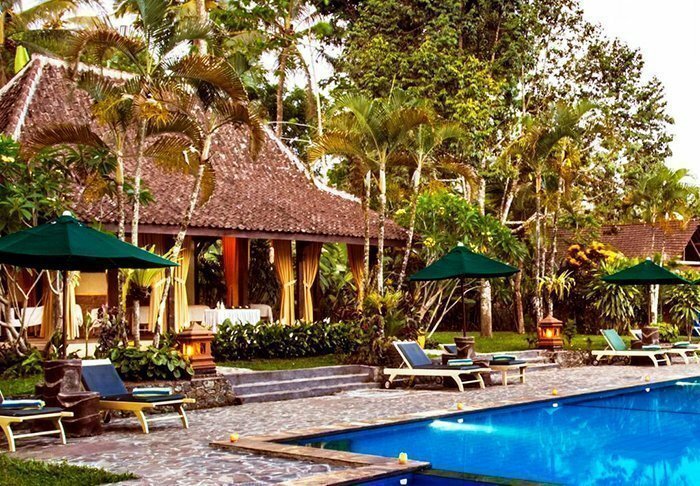 The hotel is surrounded by gorgeous nature, and you can always find the shade by the pool. 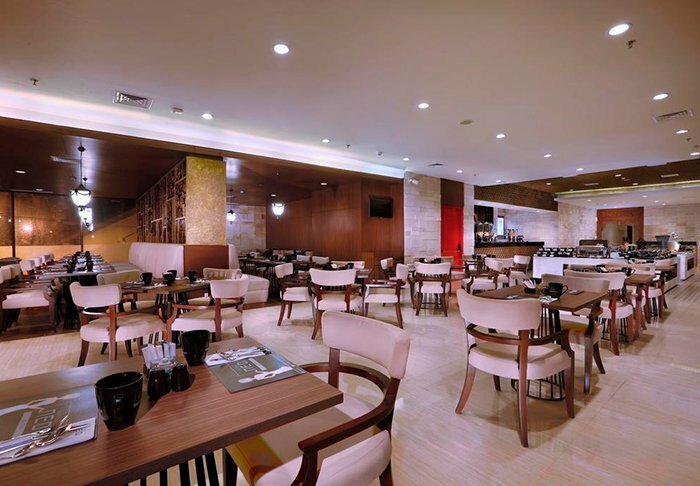 The hotel has its own restaurant and spa, and free Wi-Fi is available at all locations. 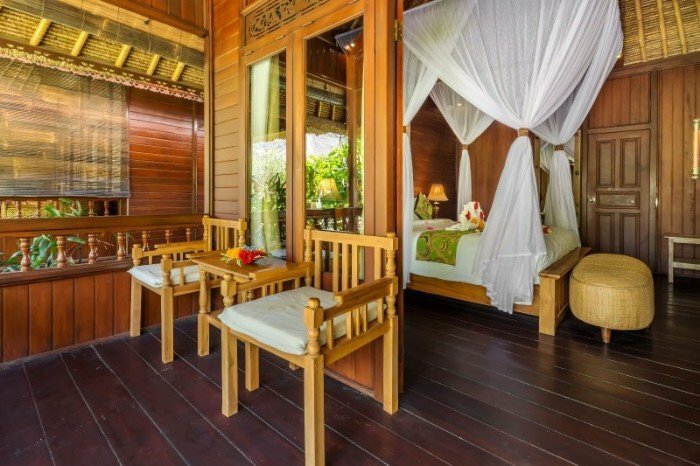 All rooms and bungalows are designed in a classic Balinese style, featuring their own balconies and terraces. 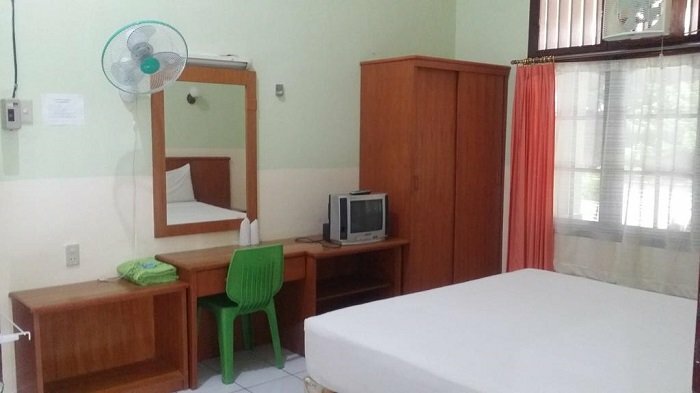 The rooms have modern interiors with air conditioning, TV, refrigerators, tea and coffee facilities and free drinking water in the room. 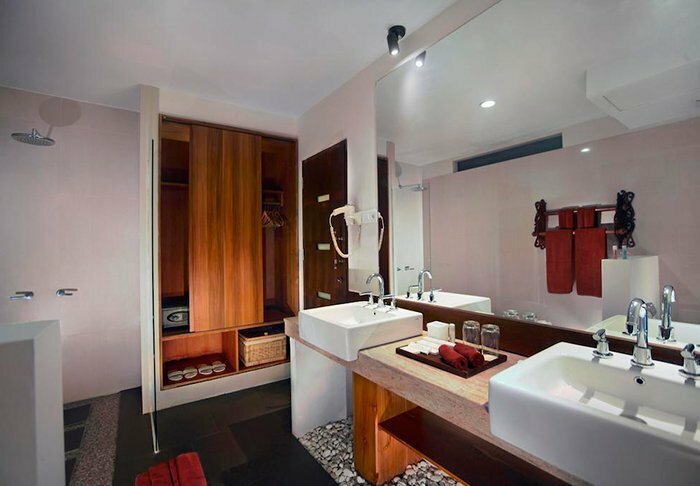 If you really want to treat yourself, upgrade to TS Suites, one of the most modern 5-star hotels in Seminyak. 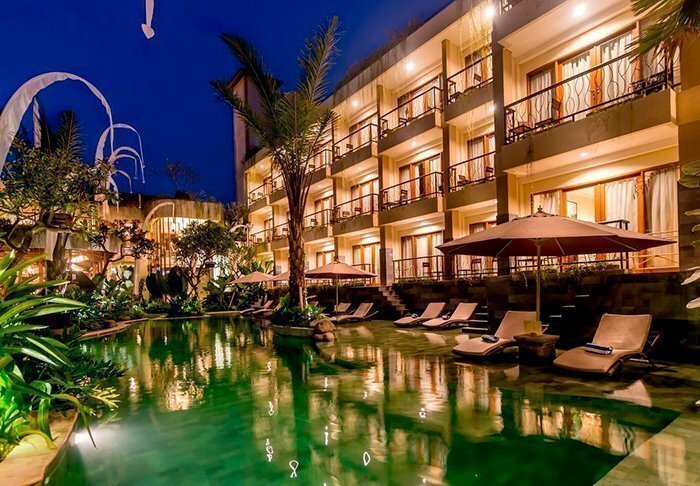 The hotel is located in the heart of Seminyak’s hippest shopping and restaurant areas, so you don’t have to go far to enjoy the charming, vibrant atmosphere that Seminyak is so famous for. 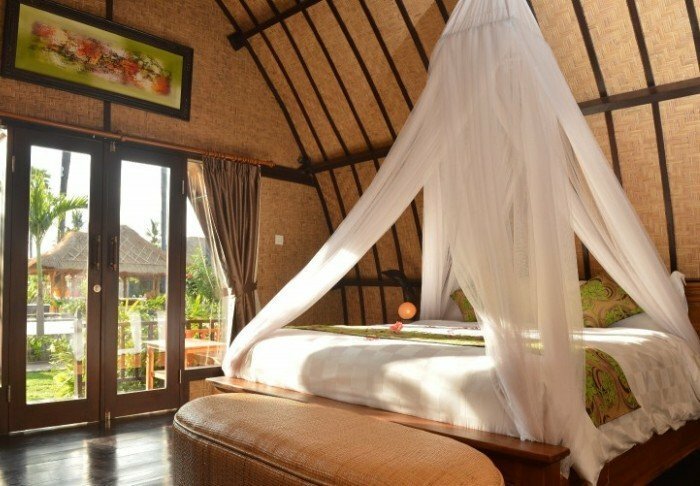 TS Suites is decorated in a unique, rustic, contemporary style, with a touch of Indonesia. 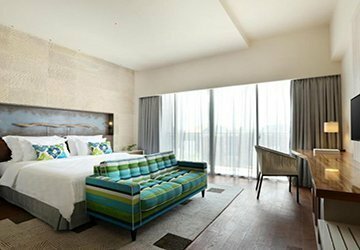 All 155 rooms are large and tastefully appointed, with free Wi-Fi, free minibar, a TV, safe, tea/coffee making facilities and bottled water. 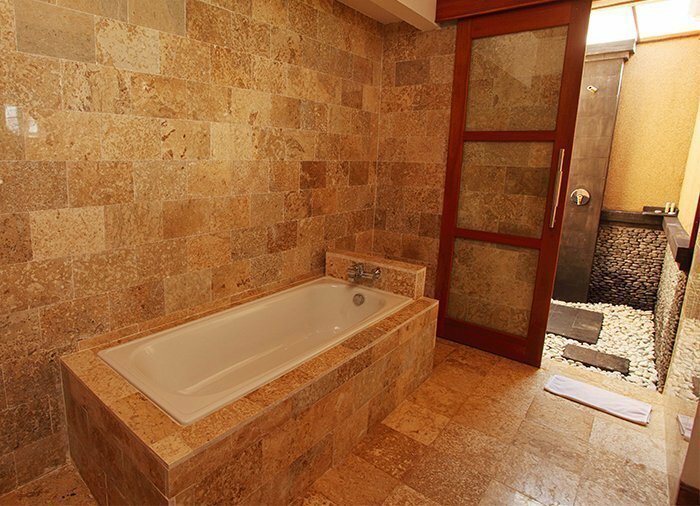 The rooms have a lovely large bathroom with free-standing bath tub and bath salts provided, so you can make your own little day spa. 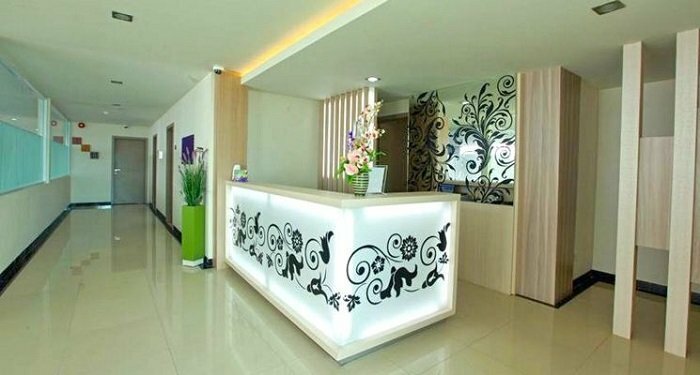 Naturally, you can also visit the hotel’s fantastic day spa, which offers a wide range of different treatments. 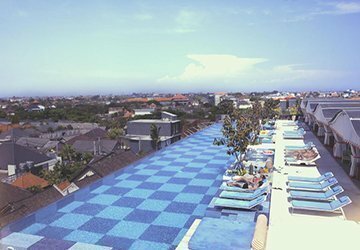 As a guest at TS Suites, you can work out in the gym or relax in the 50-metre pool – which also happens to be an infinity rooftop pool – perhaps even the best of its kind in all of Bali! 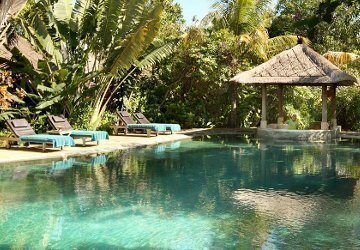 Some of the sun loungers are located at the edge of the pool, so you can simply dip your feet in the water if you need to cool down a little. If you’ve had enough of the pool, you can take the hotel’s free shuttle bus to the beach. The restaurant is open for breakfast, lunch and dinner. 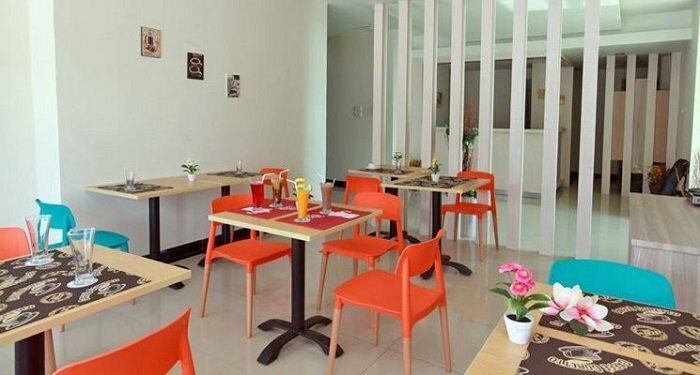 As a special feature, you can enjoy breakfast around the clock. So if you’re not a morning person – or perhaps want to start the day with a long run along the beach – you don’t have to worry about missing breakfast. It’s right here waiting for you! 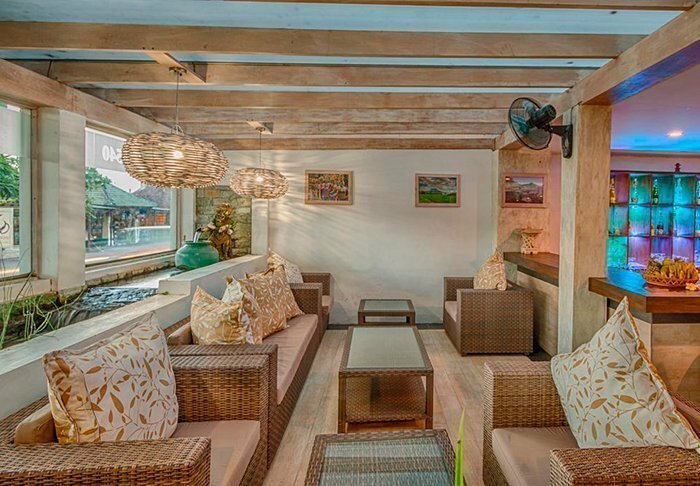 In the evenings, you can enjoy a drink in the cosy lounge bar. 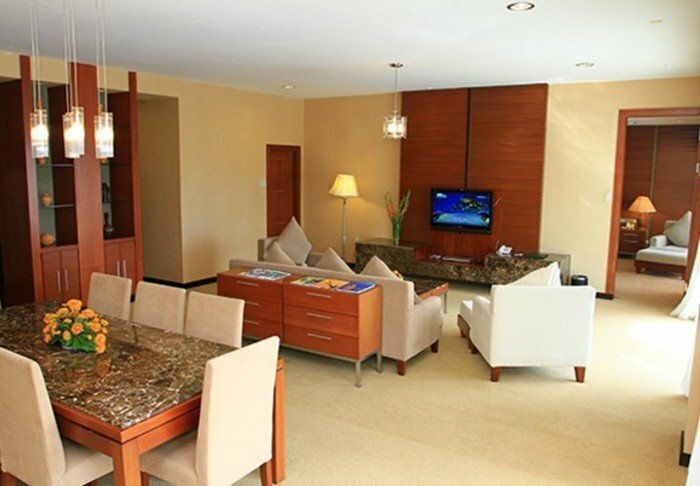 If you are travelling with children, TS Suites offers family-friendly facilities, with rooms designed for guests young and old, as well as a children’s pool and a children’s club. The hotel also has a library, nightclub and games room where you can play pool. 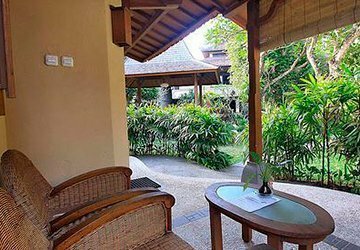 Alaya Resort is located in the heart of Ubud, surrounded by rice fields and just 200 metres from the famous monkey forest. 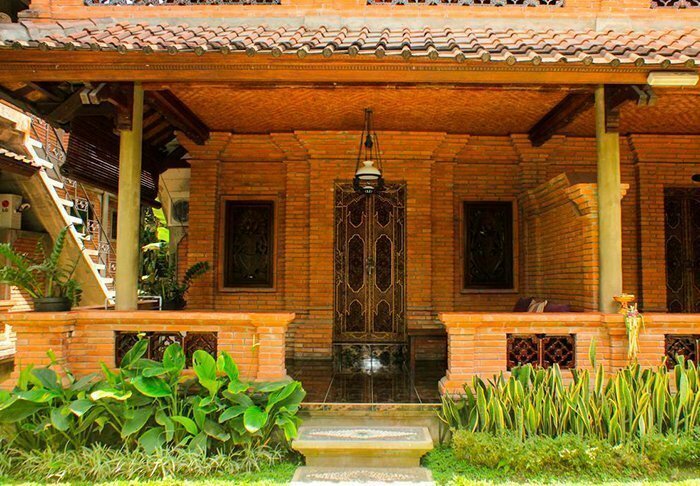 Built in harmony with the surroundings, it is decorated with artworks from Ubud and the rest of Bali. 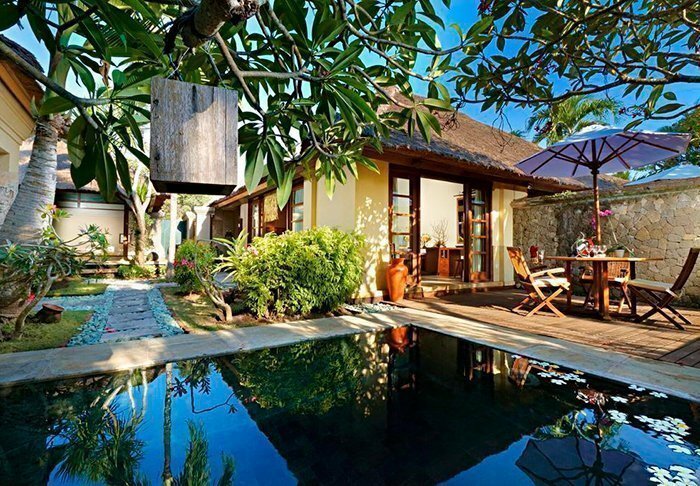 The resort offers 105 fabulous and tastefully appointed rooms in Balinese style. 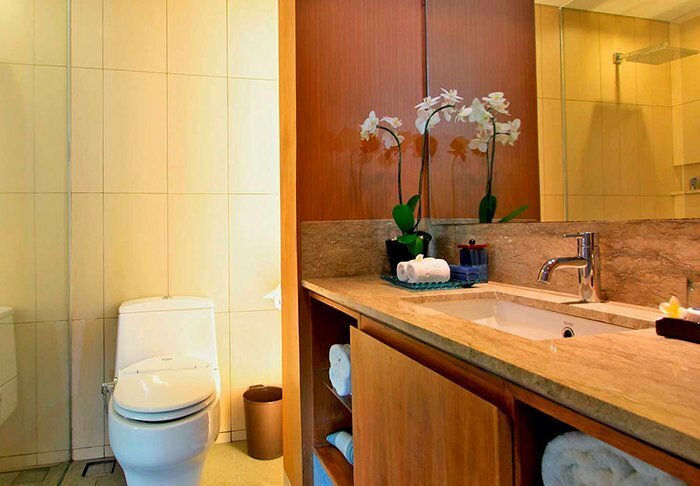 As soon as you step into the room, you are greeted by a calm, relaxed atmosphere. 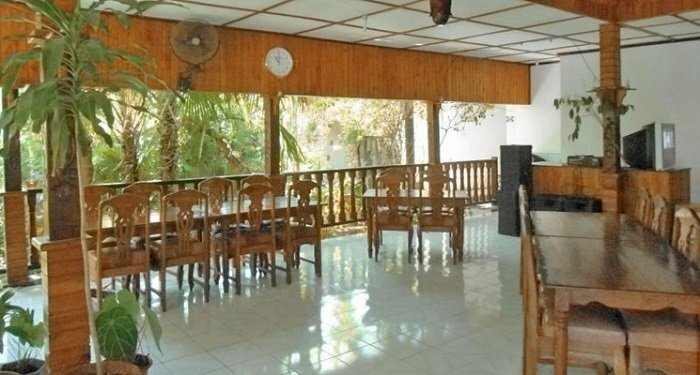 Free Wi-Fi, air conditioning, ceiling fan, minibar, TV, telephone, tea/coffee making facilities and safe. 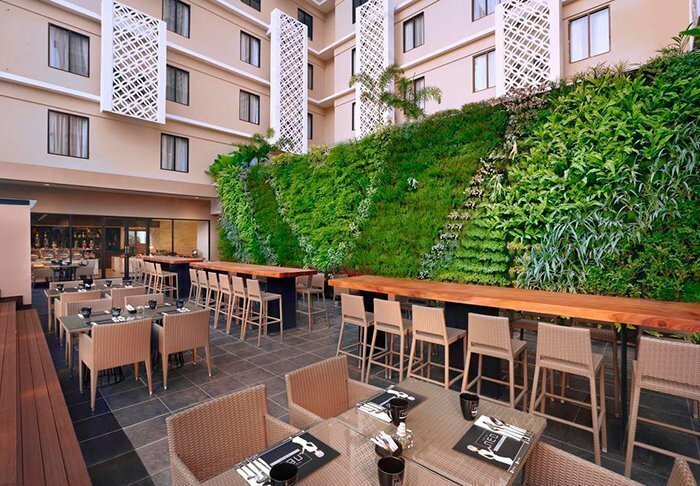 From your terrace or balcony, you can enjoy the view of the beautiful surroundings. 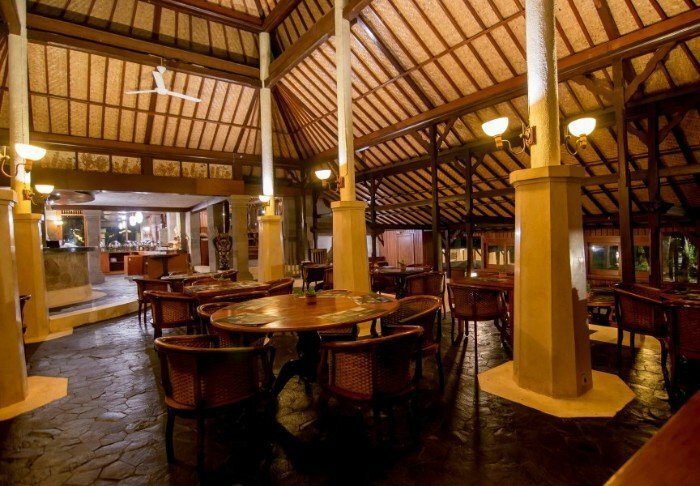 At Restaurant Petani, you can dine on both Indonesian and international dishes, and at Bamboo Bar you can enjoy a drink. 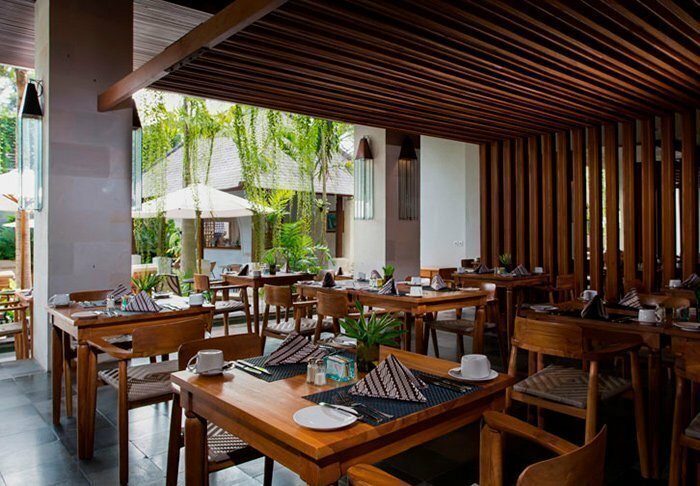 Canapés, coffee, tea and cake are served at Manisan Bali. 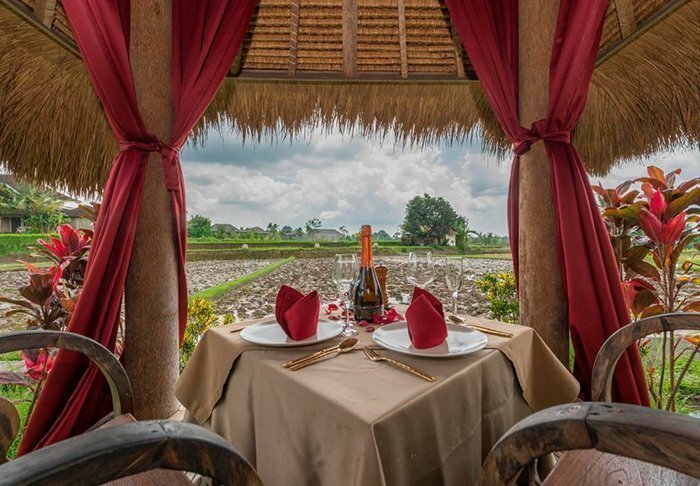 Enjoy a “sundowner” before darkness falls overlooking the green rice fields. 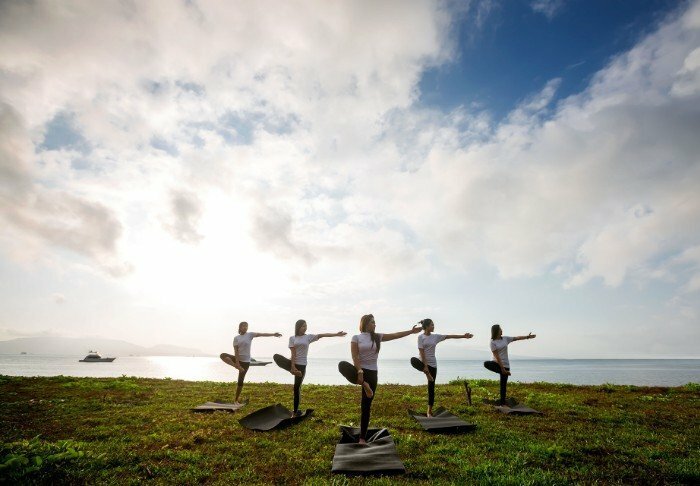 If you wish to enjoy a spot of pampering and relaxation, you can book an appointment at Dala Spa and do yoga in the Bale pavilion. 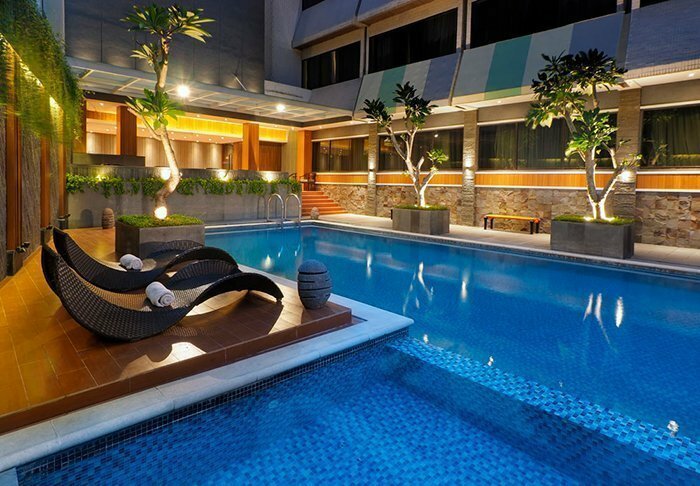 You can also take a dip in the pool. And if you wish to explore the area on your own, you can rent a bicycle. 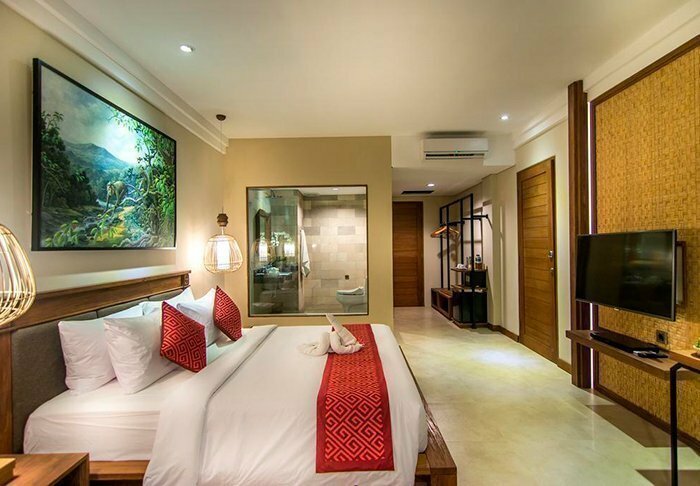 This cosy 4-star boutique hotel is located just a few minutes’ walk from the famous and sacred Monkey Forest – in the heart of Ubud. 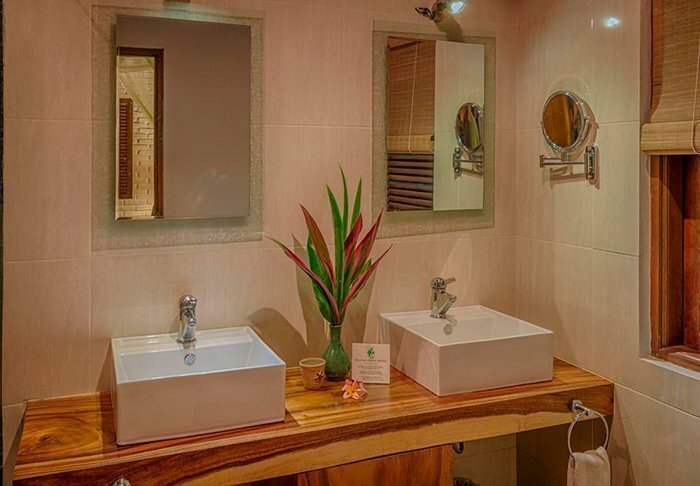 The hotel has just 39 rooms, all of which are stylishly appointed with an en suite bathroom/toilet, air conditioning, TV, minibar, tea/coffee-making facilities. 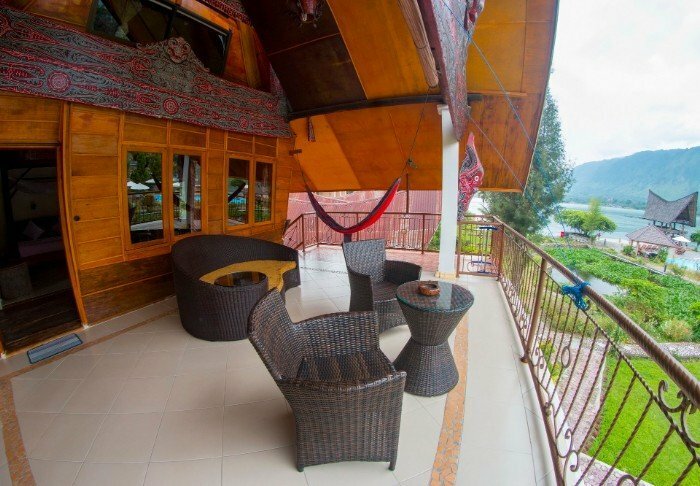 All rooms have their own balcony or terrace. 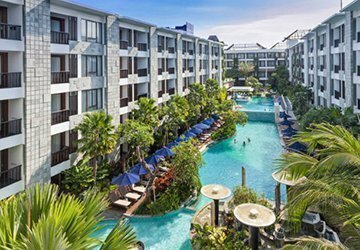 The hotel is built around the impressive lagoon-like pool, which offers good shade in the form of palm trees and exotic flowers and shrubs. 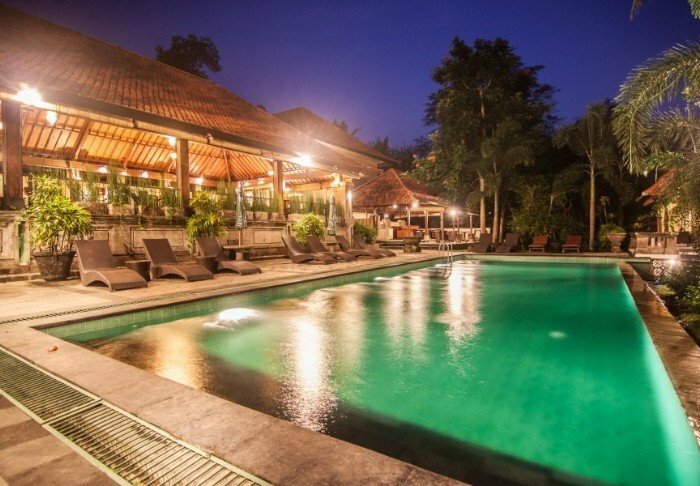 There is a restaurant, bar, day spa, free Wi-Fi, and if you wish to explore the area around Ubud, the hotel also offers bicycle rental. 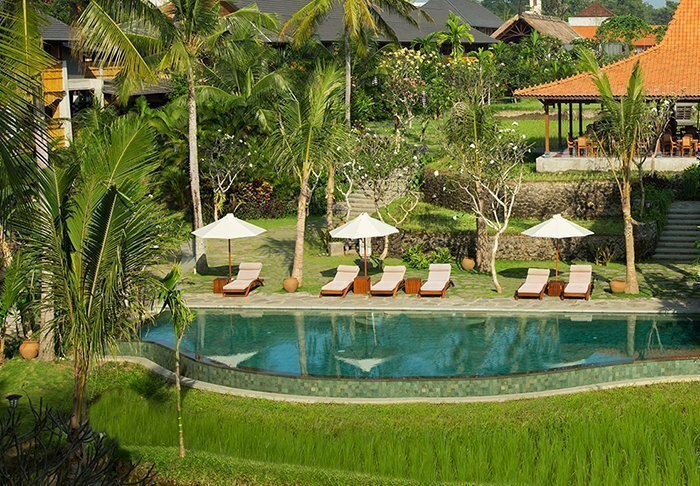 Champlung Sari is a relaxed and relaxing retreat located in Ubud, surrounded by lush, green mountains and deep gorges. 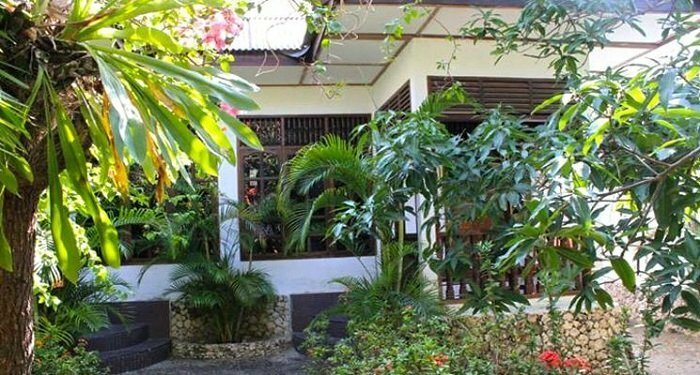 The retreat is situated in a large tropical garden, divided by two natural watercourses. 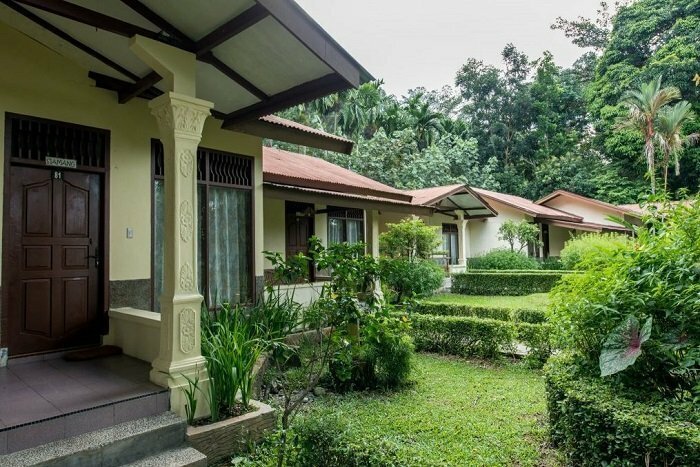 The rooms are in bungalows gathered in groups in different parts of the grounds to highlight the village ambience. 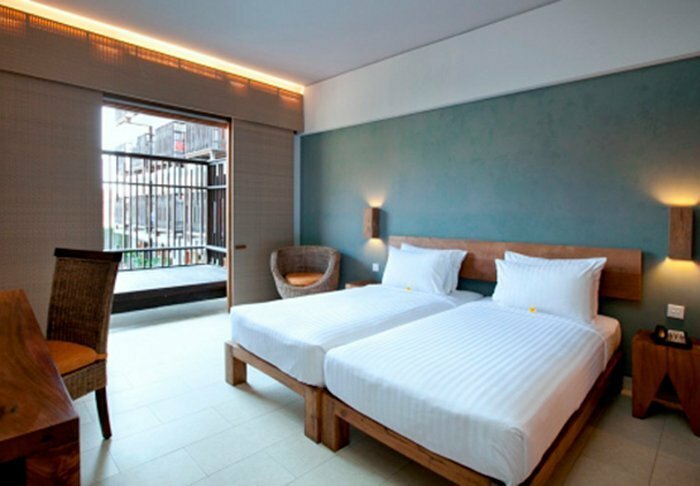 The superior rooms have their own terrace or balcony and are appointed with excellent wooden furniture. 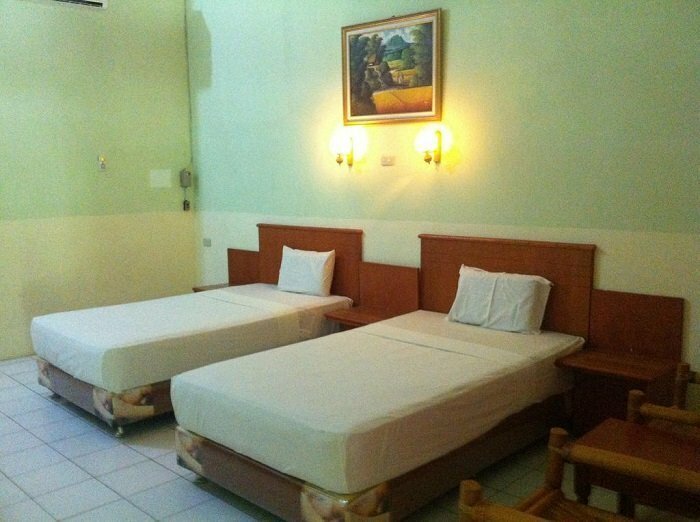 The rooms are naturally equipped with all modern conveniences. 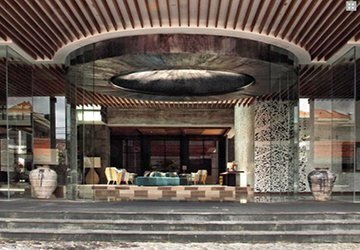 Facilities at the retreat include a spa, restaurant, bar, café and two swimming pools. 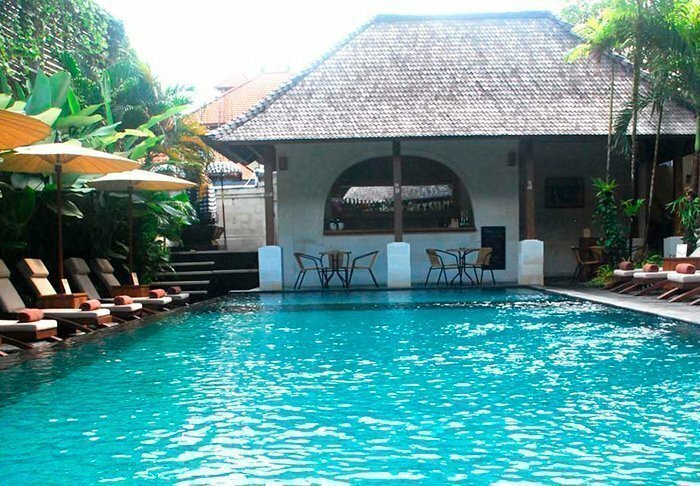 There is also a free shuttle bus service to and from the centre of Ubud. 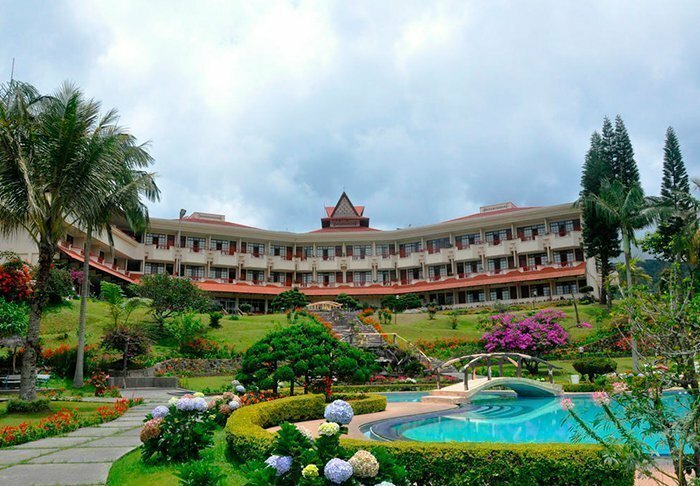 Grand Sunti Resort is a short 15-minute walk from both the Monkey Forest and the city’s shopping street. 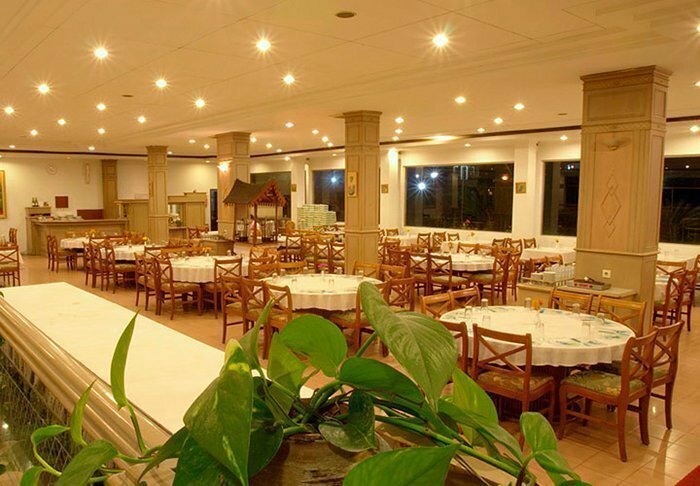 Not far from the resort are several excellent places to eat, as well as an ATM and the Arma museum. 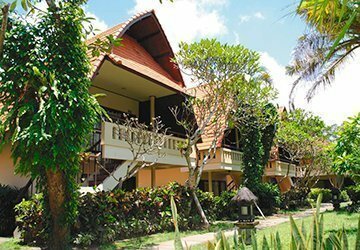 Grand Sunti Resort has 52 pleasant rooms furnished in the Balinese style, with dark wooden furniture and beautiful carved doors and windows. 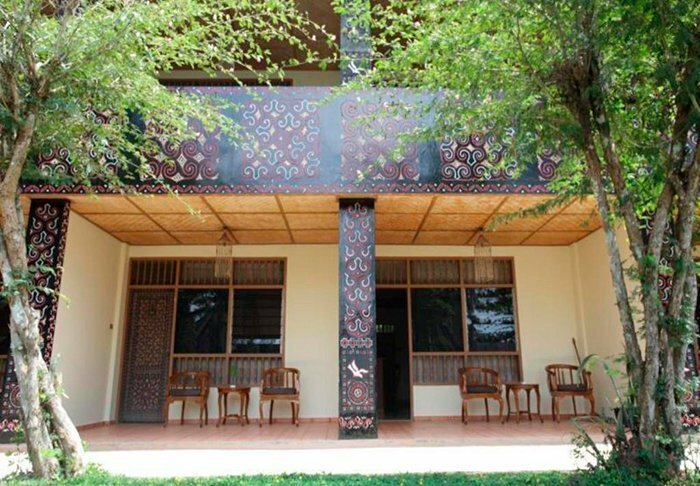 All rooms have free Wi-Fi, air conditioning, a safe and a porch or balcony. 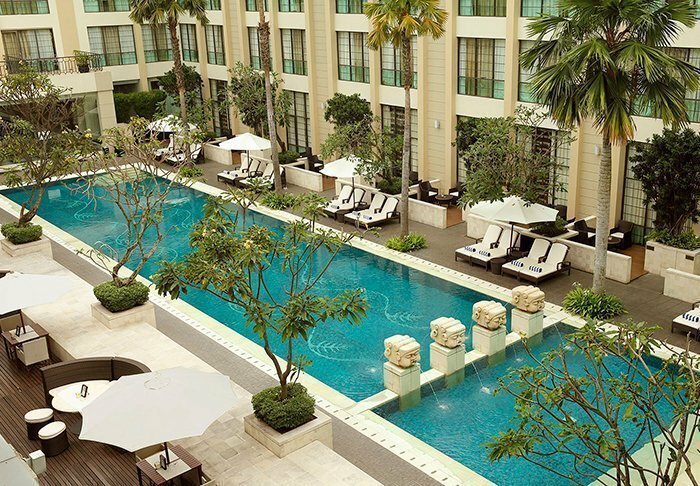 To relax, you can lie back at one of the three swimming pools, or unwind in the spa area with a nice massage. 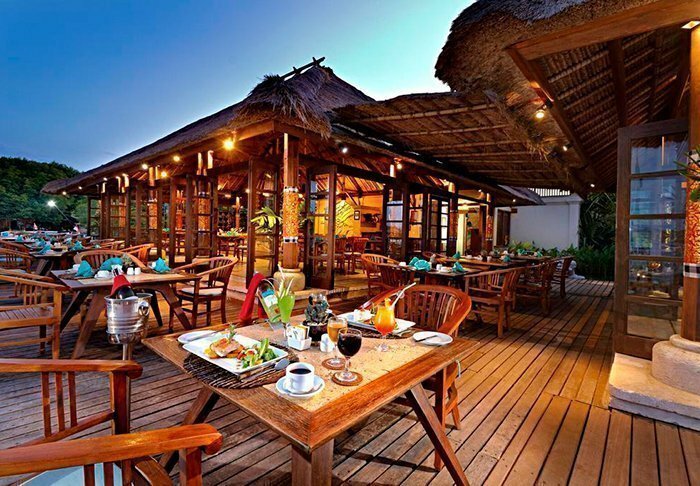 The resort also features a coffee shop and restaurant. 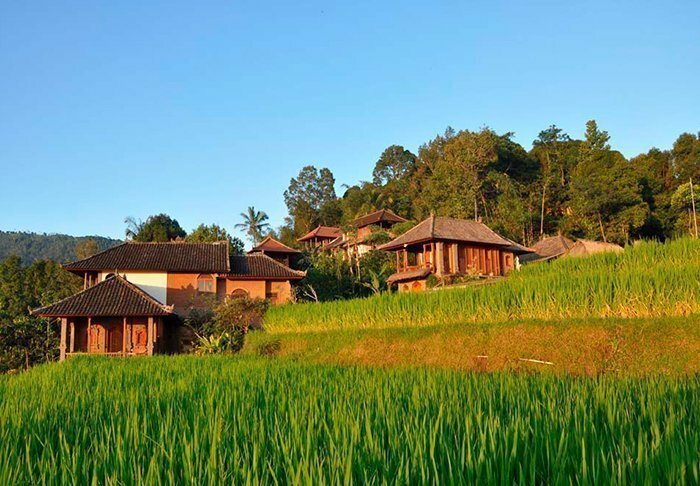 Ubud’s green surroundings, overlooking the scenic rice fields, are where you will find the cosy 4-star hotel, Mathis Retreat. 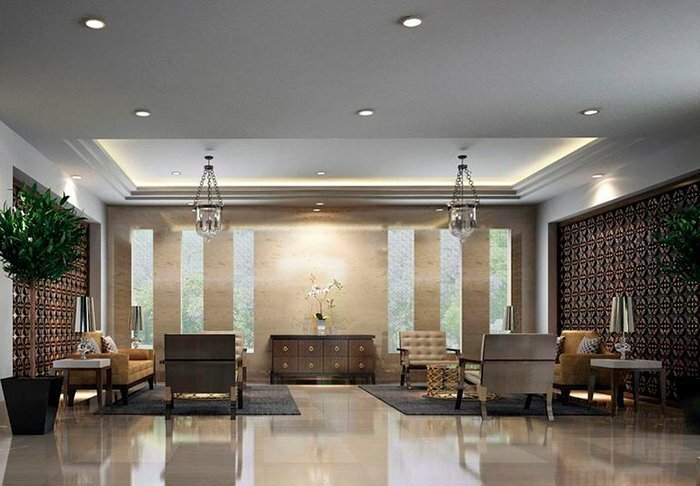 The atmosphere of the hotel is both personal and relaxed, making it the perfect place to relax on a lovely day filled with wonderful experiences. 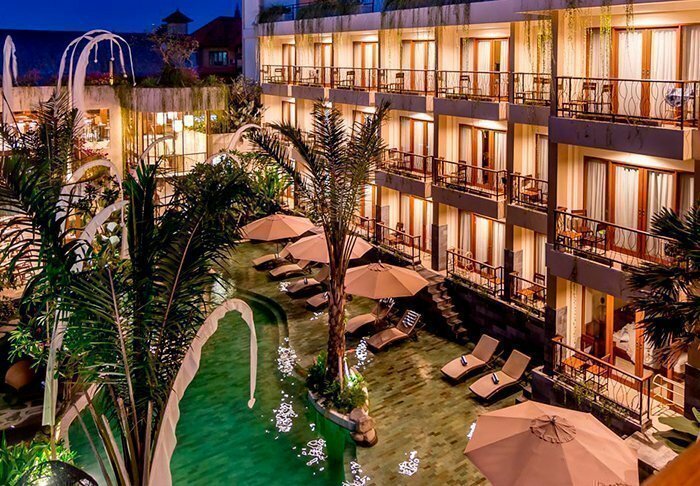 The hotel only has 21 rooms, all of which are decorated in a stylish mix of contemporary and Balinese design. 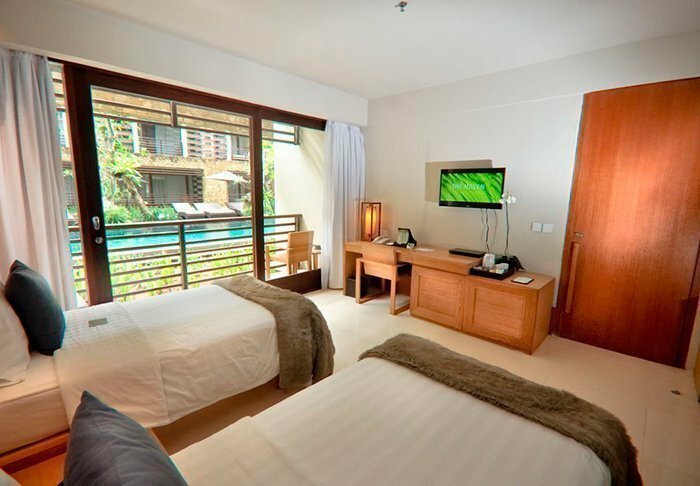 All rooms have a private terrace, air conditioning, tea/coffee making facilities, minibar, TV and free Wi-Fi. 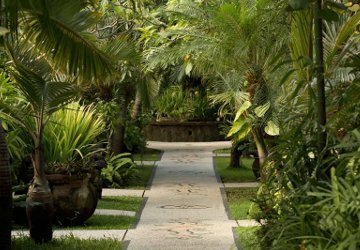 Relax by the pool in the shade of the palm trees, directly overlooking the rice fields, or enjoy a fabulous massage at the hotel’s day spa. 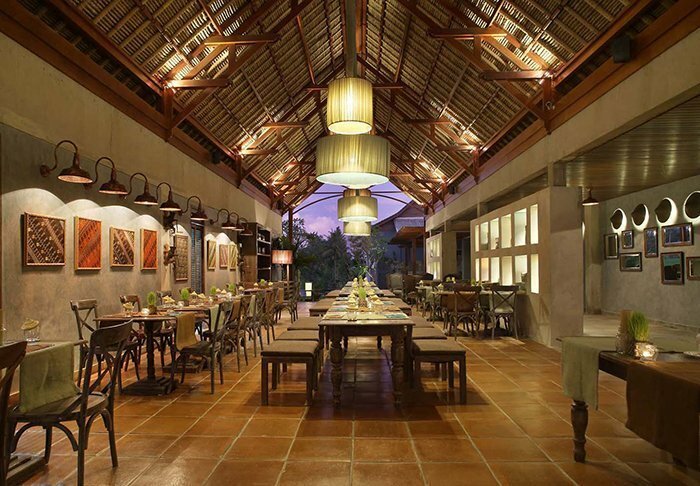 The hotel’s restaurant offers delicious Balinese dishes with an international twist. 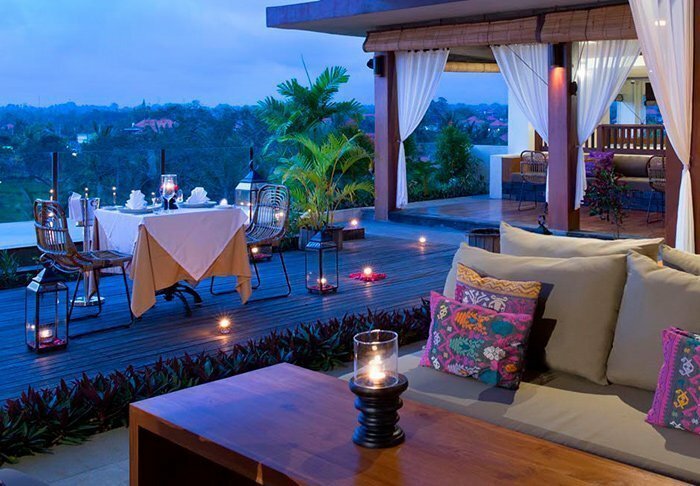 Ubud is just a 5-minute drive from the hotel – if you can drag yourself away from the view that is! 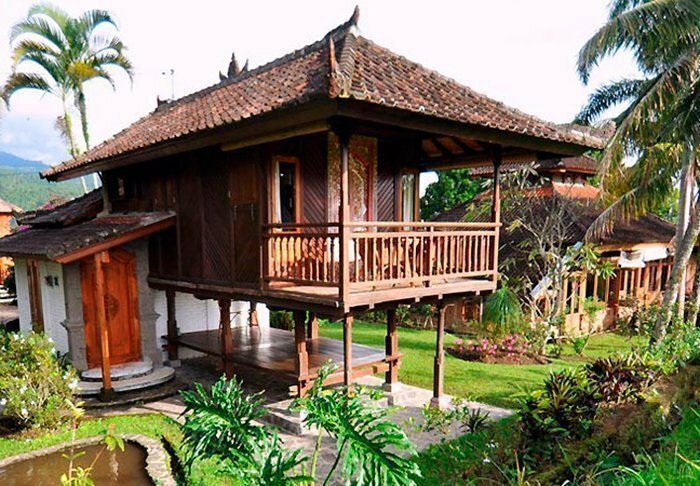 Taman Harum Cottages is just outside Ubud in fantastic, calm surroundings, close up to several sightseeing spots. 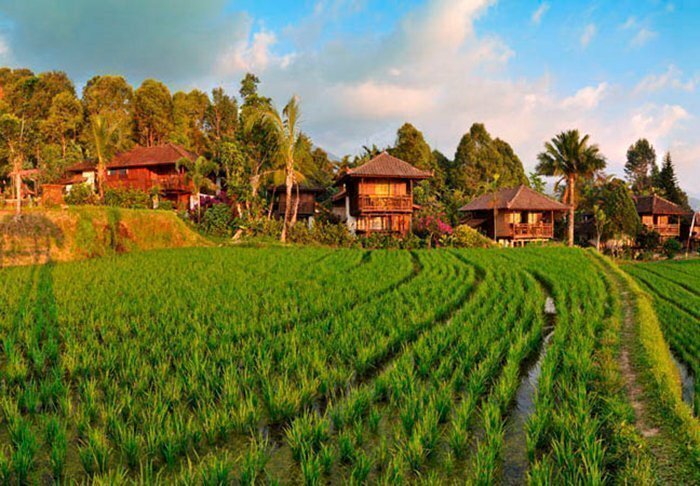 The hotel is surrounded by gorgeous, verdigris green rice paddies all the way to the sacred Mount Agung, which can be spotted in the distance. 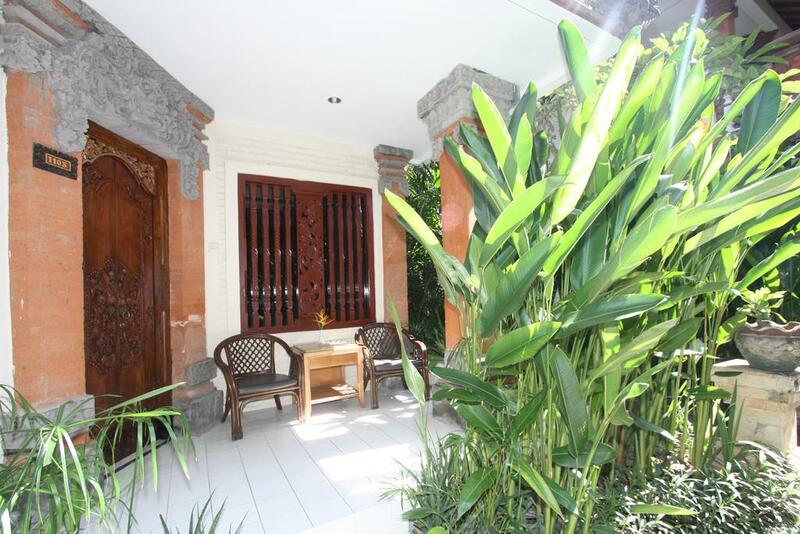 The hotel has 17 excellent, spacious rooms, designed in a modern, Balinese style. 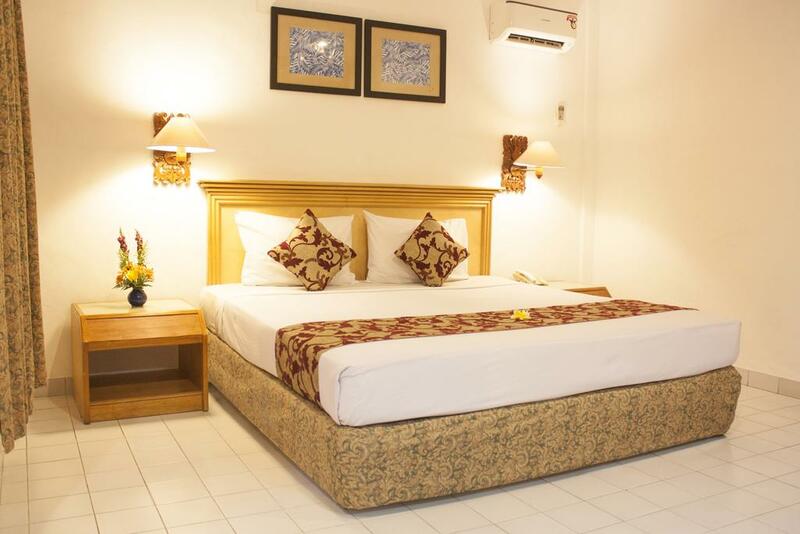 All rooms are equipped with Wi-Fi, air conditioning, a mini-bar, safe, TV, DVD player and phone. 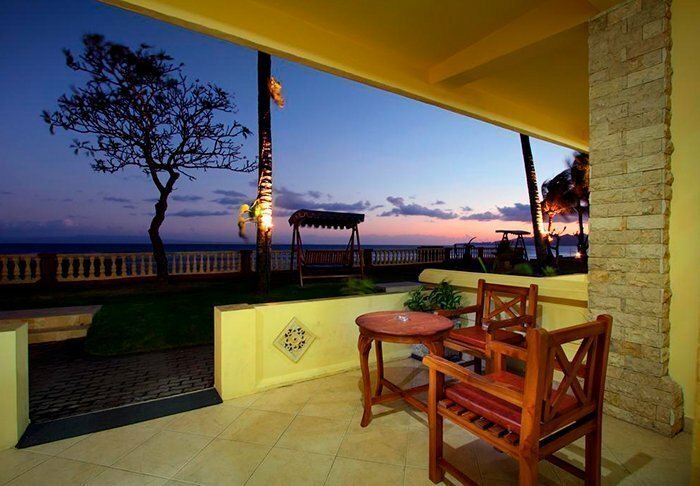 From the balcony you can unwind with a book, enjoy a game or take in the view of the garden. 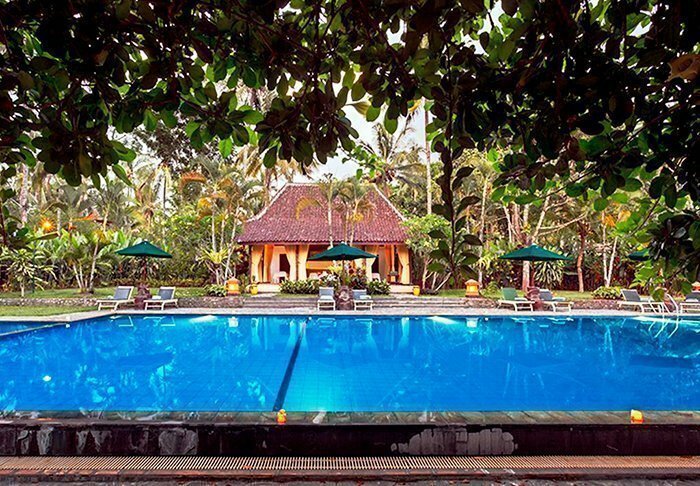 Taman Harum Cottages has a delightful pool area with both a regular pool and a children’s pool. 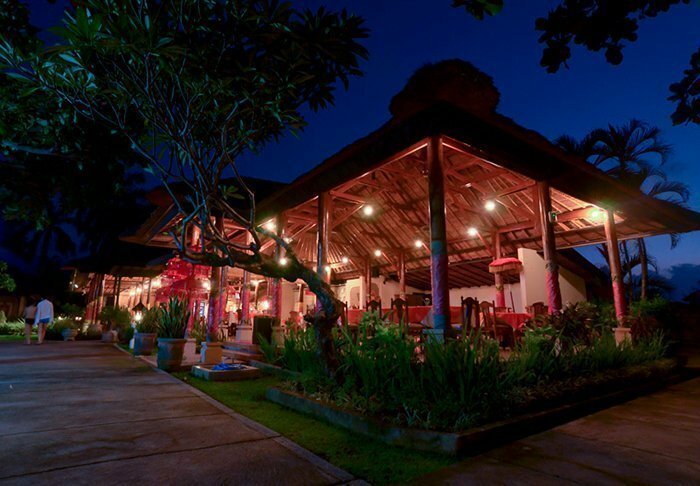 In the restaurant you can enjoy traditional and international cuisine, and in the spa you can relax and have your sore muscles softened up by a traditional Balinese massage. 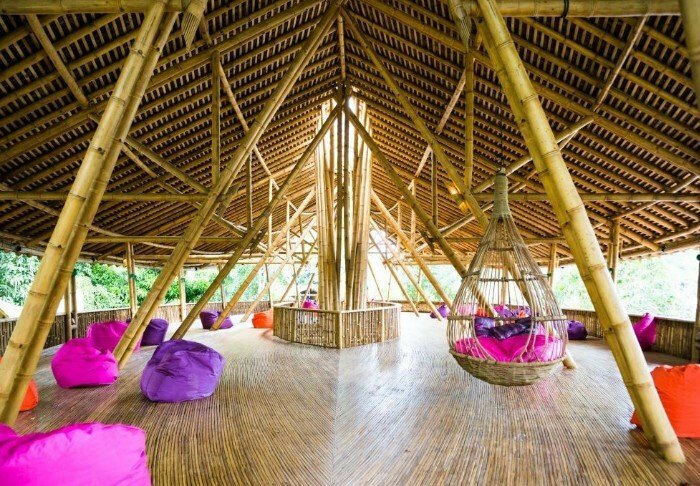 Other facilities include yoga, meditation, aerobics, workshops and a wood carving workshop. 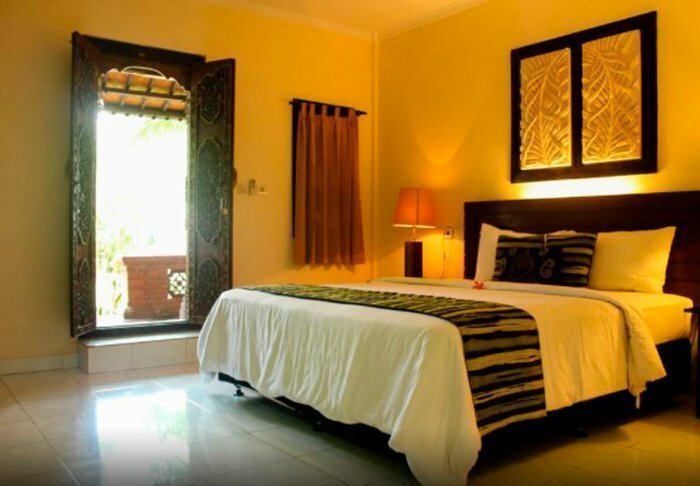 The hotel also offers a free shuttle bus to central Ubud, operating from 09:00 to 22:00. 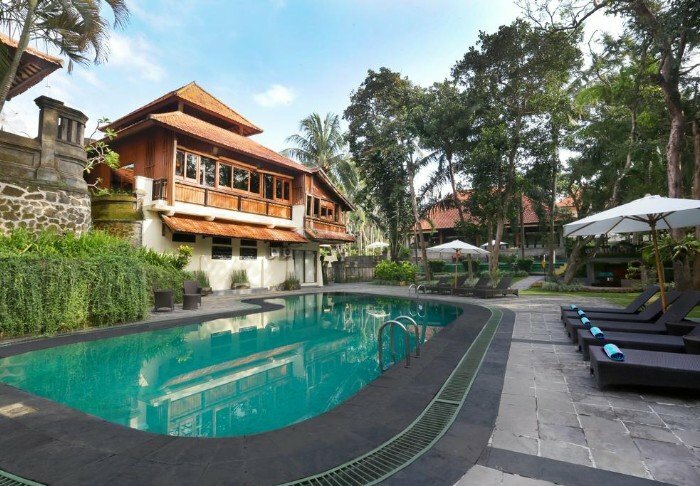 In the heart of Ubud, you will find the lovely Ubud Village Hotel where peace and tranquillity meet Balinese tradition. 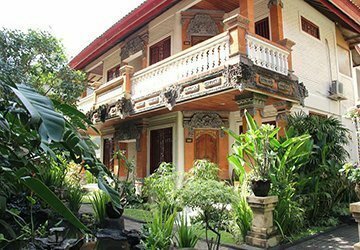 Despite its central location, the hotel is situated in leafy surroundings – with shady palms, vines and other greenery around the property. 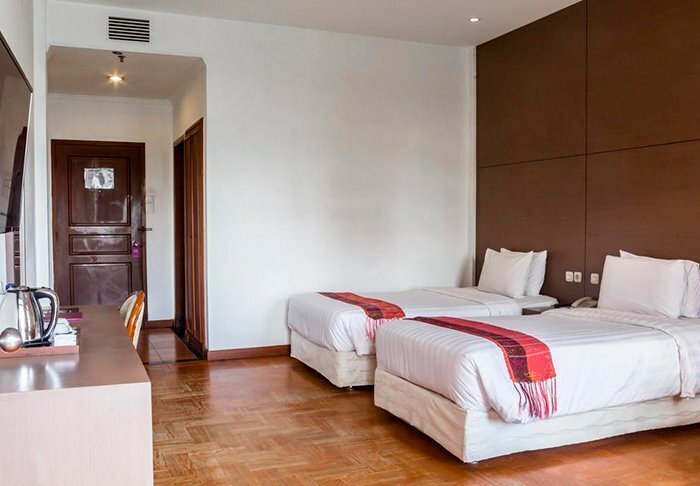 The hotel has 64 spacious rooms, all of which are decorated in contrasting colours with dark wooden furniture, light walls and cooling marble floors, providing well-balanced charm and ambience. 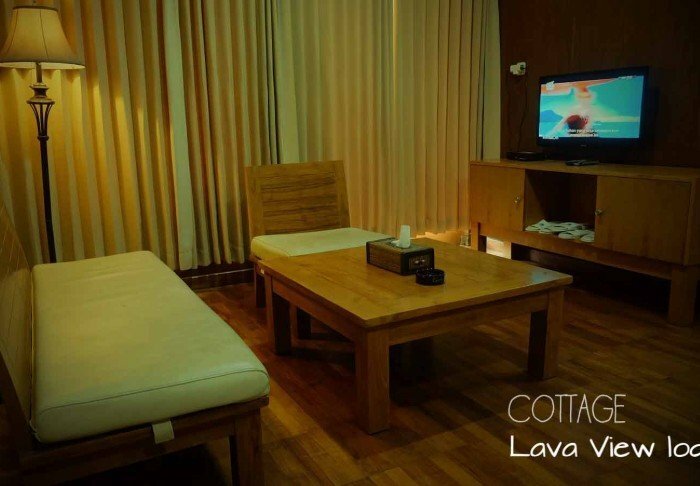 All rooms have an LCD TV, air conditioning, a safe and a private balcony with a pleasant seating area. 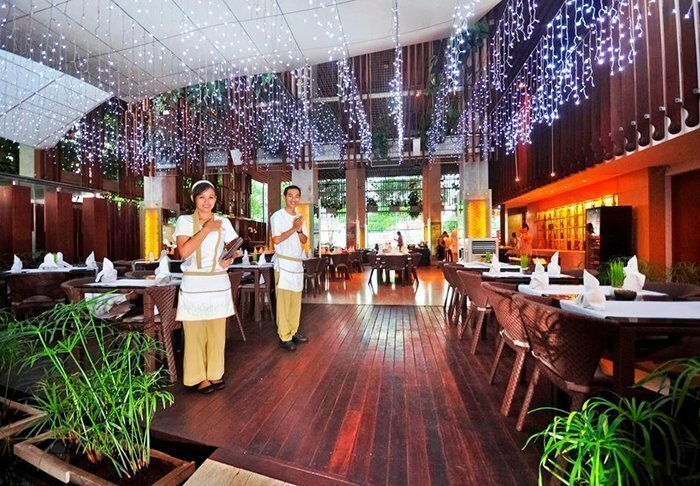 The hotel restaurant, Madu Restaurant, exudes a relaxing atmosphere and serves breakfast every day. 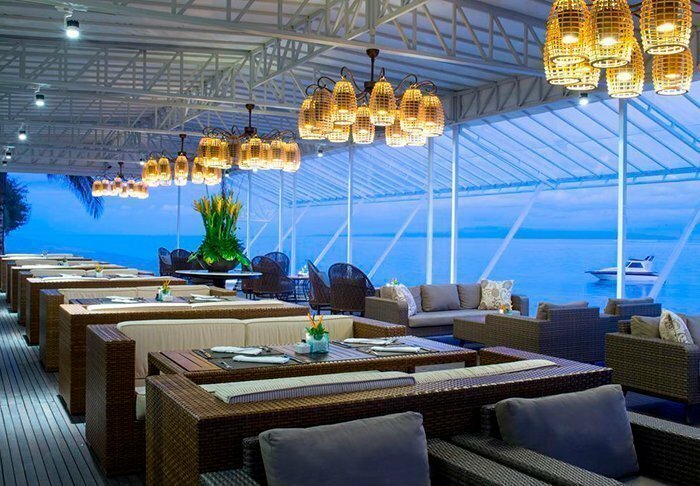 In the rooftop bar, Ulu Sunset Terrace, you can enjoy refreshing drinks, snacks and cocktails, as well as a view of the sunset and the surrounding vegetation. The hotel has two swimming pools, one of which has a special children’s area. 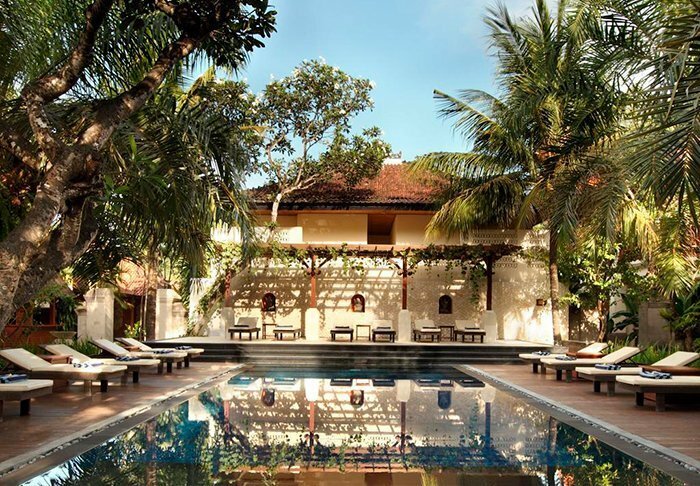 Both pools are surrounded by comfortable sun loungers and shady Balinese parasols. 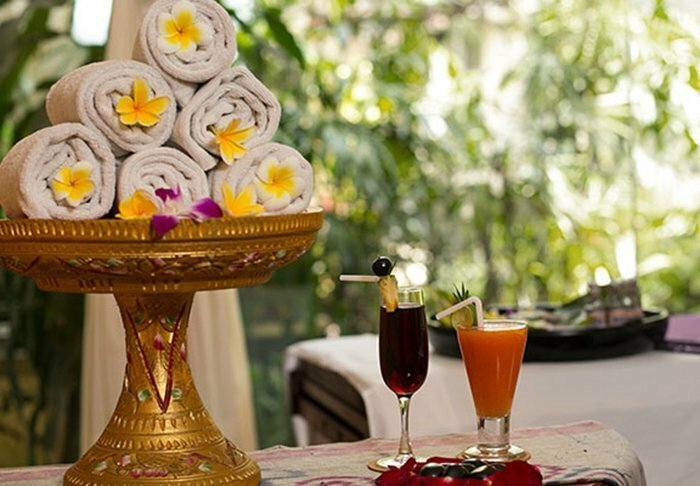 A range of nurturing massages and spa treatments is available to purchase at Kama Karana Spa. 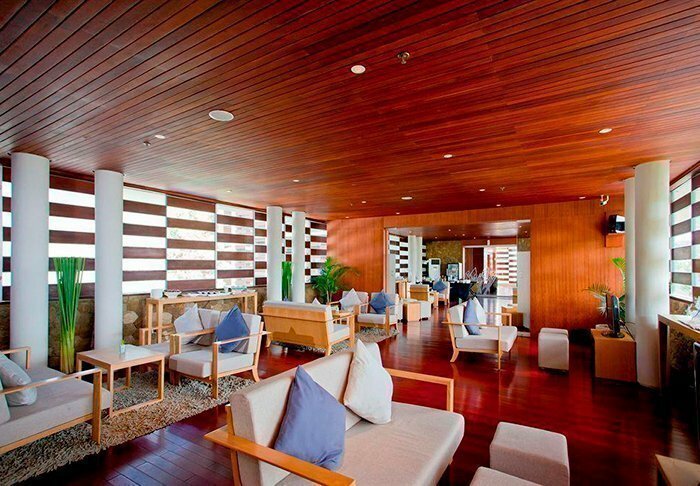 The hotel’s Lobby Lounge has comfortable armchairs and a small library of books, magazines and newspapers. There is free Wi-Fi throughout the hotel. 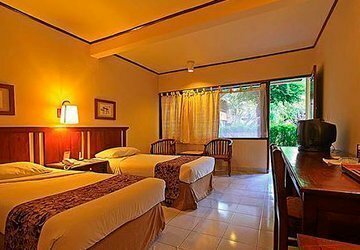 This 4-star hotel is found on the western side of Flores, just a stone’s throw from the beach and with the mountains as its backdrop. 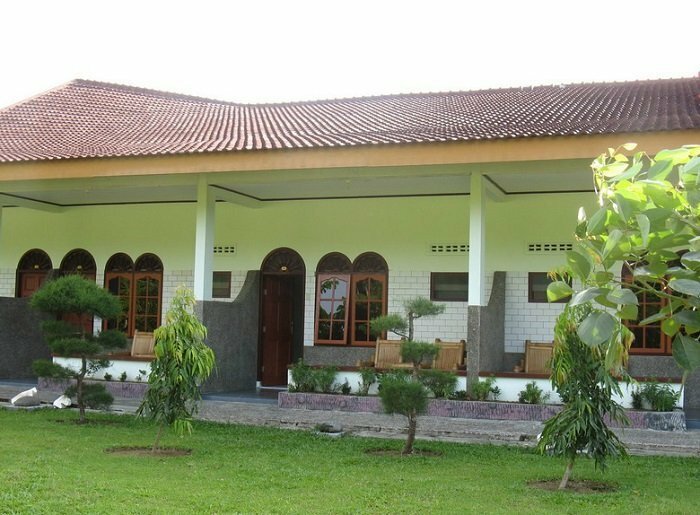 It offers 71 spacious rooms, all with en suite bathroom, a TV, air conditioning, a minibar and tea/coffee making facilities. 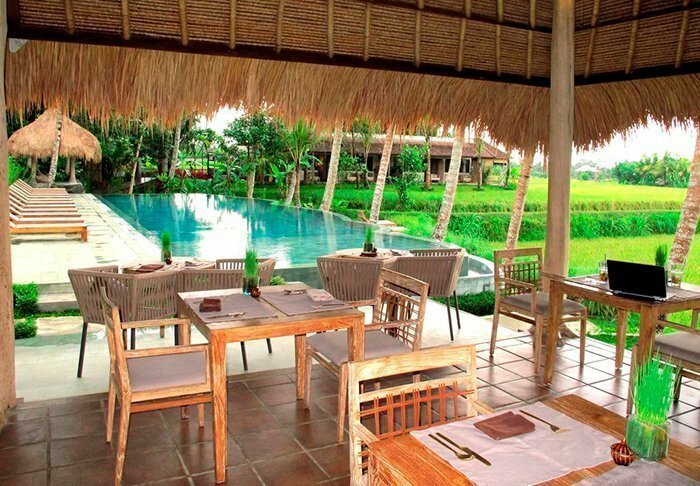 The hotel has a restaurant and bar, and in the middle of the green garden is the pool – in the shade of the palm trees, which shield you from the baking rays of the sun. 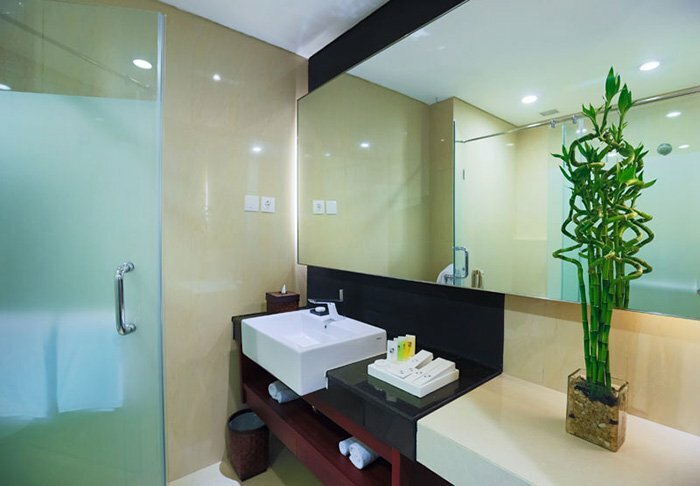 At the hotel, you have the possibility of having a massage, and there is Wi-Fi in the communal areas. 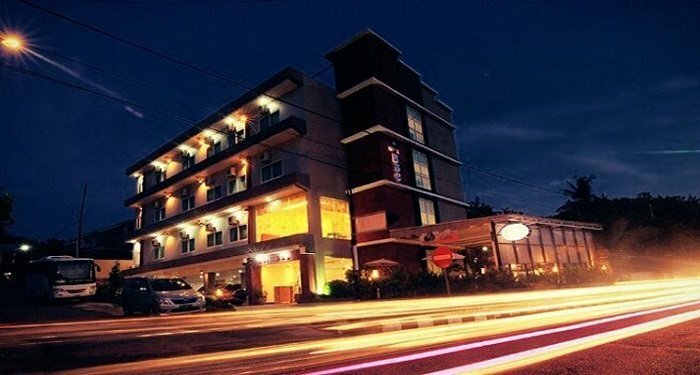 Set in the most beautiful of gardens, just a few minutes’ walk from the beach with the stunning black sand, is the charming 3-star Ketapang Indah Hotel. 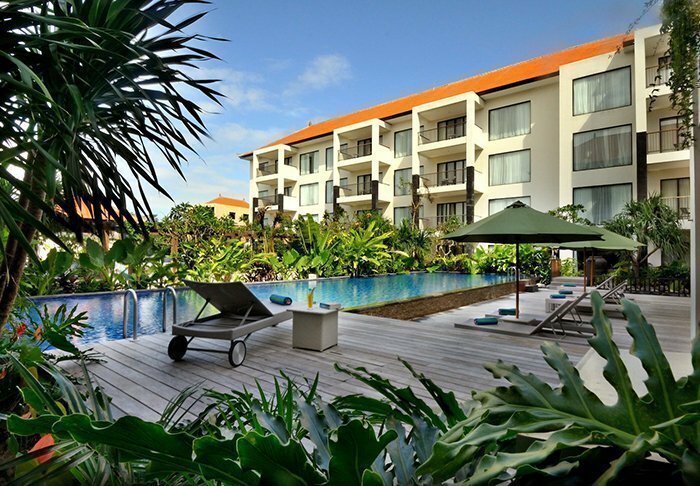 The pool is spacious, with plenty of room to sunbathe around the edge, and there is Wi-Fi throughout. 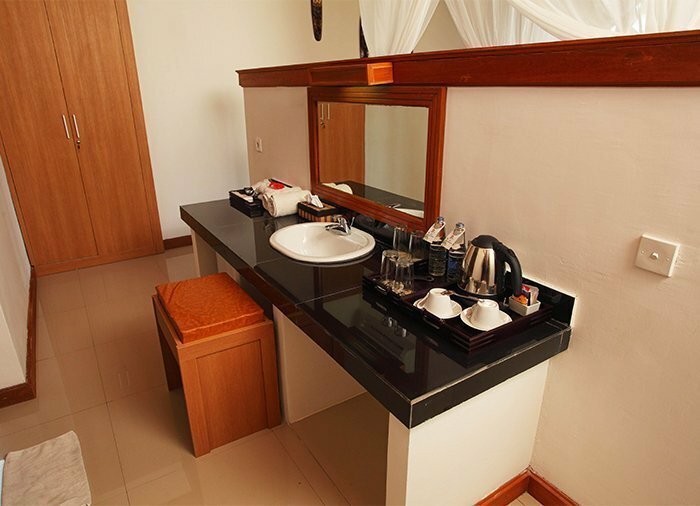 The rooms are simple yet nicely furnished, and all have an en suite bathroom. There is a restaurant at the hotel. 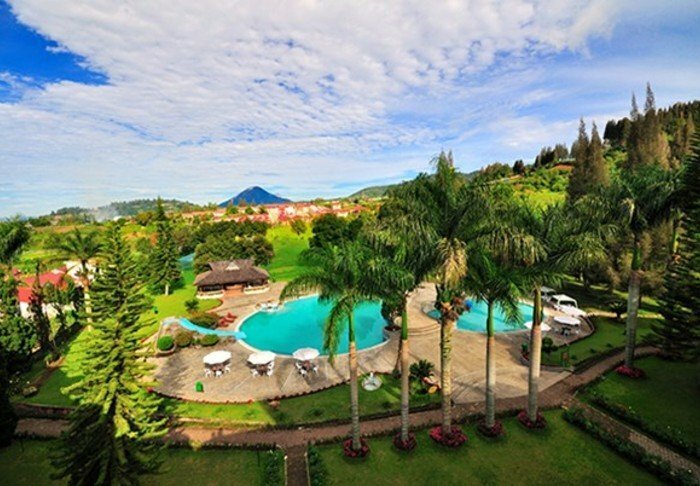 You’d be hard pushed to find a better view of Mount Bromo than from the Lava View Hotel. The hotel has a restaurant and Wi-Fi in some areas. 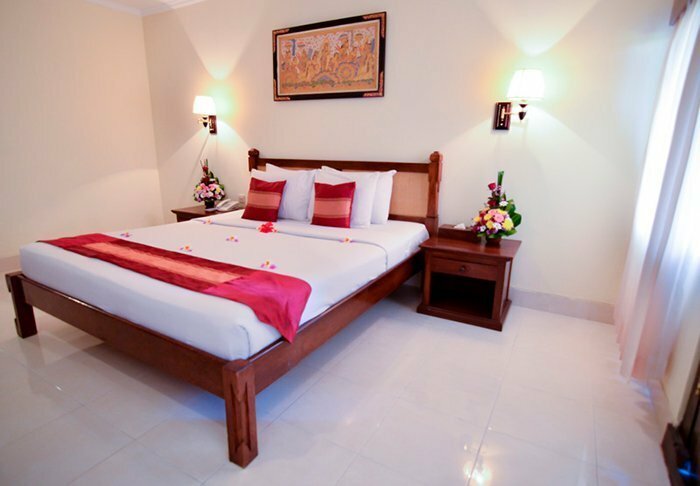 The rooms are simply appointed with basic facilities. 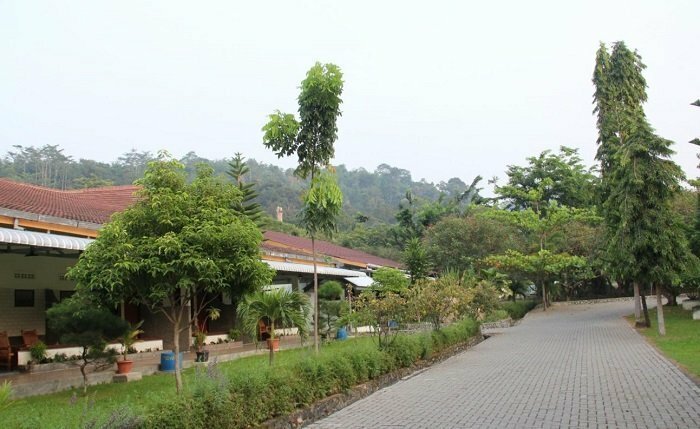 A cosy little hotel on the outskirts of the small town of Kalibaru. 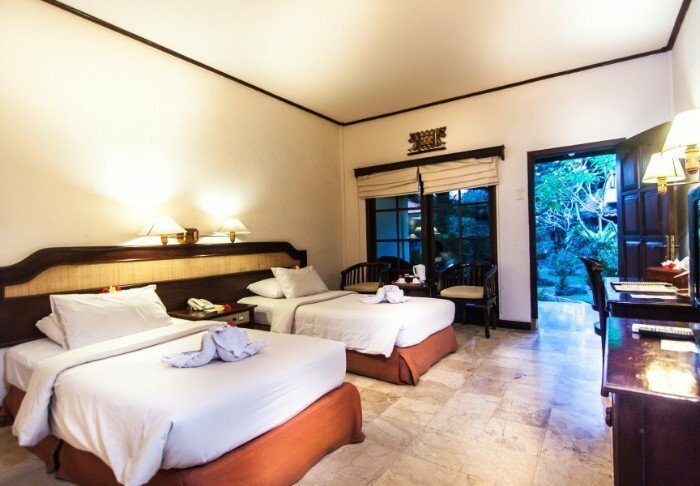 All rooms have a private terrace and are located beside a beautiful, tropical garden, which attracts many birds and butterflies. 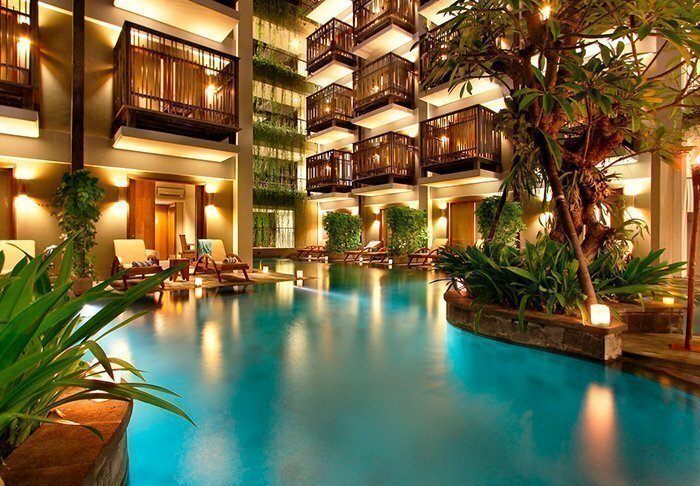 The hotel has a large pool and a spa area, where you can book a massage. 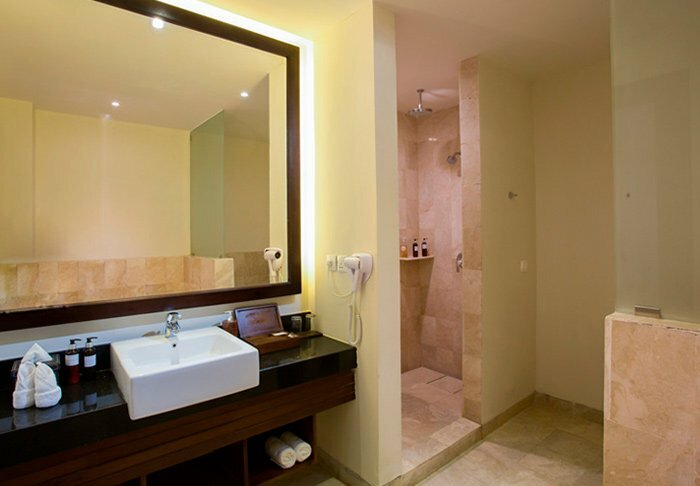 The rooms are spartan yet comfortably furnished and all have a private bathroom. Wi-Fi is available in selected areas. 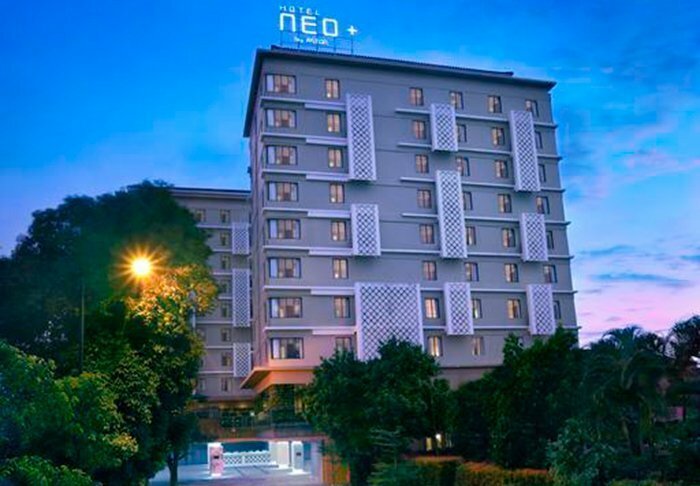 The modern 3-star hotel, Neo, is located close to the centre of Yogyakarta. 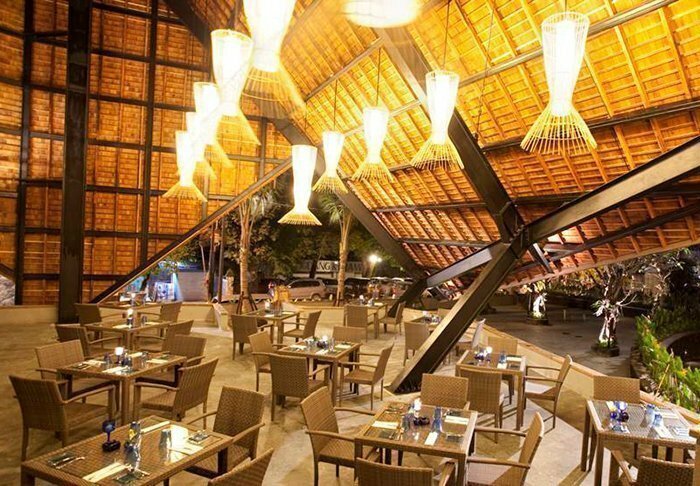 The town offers a good selection of shops and restaurants within easy walking distance of the hotel. The hotel has an outdoor pool, free Wi-Fi and a restaurant. 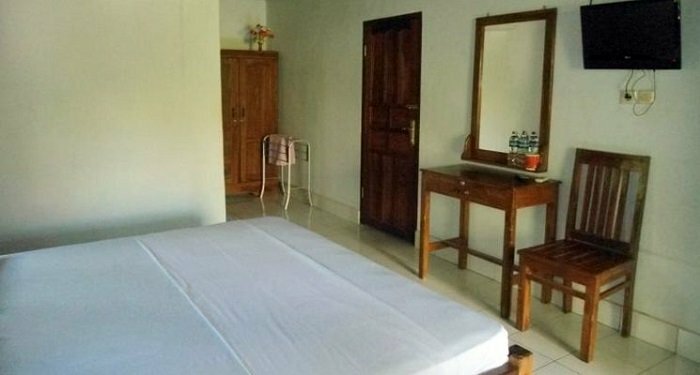 The rooms are stylishly decorated in soft colours, and all have air conditioning, a fridge, a TV, a minibar, tea/coffee making facilities and a safe. 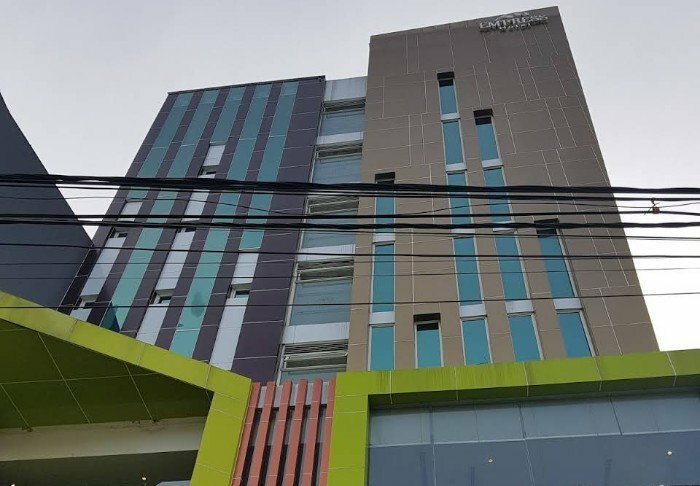 Empress is a 5-minute drive from Losari beach in Makassar, and is 30 minutes away from the airport. 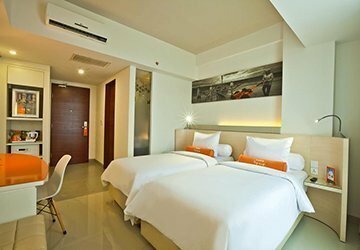 The hotel has a modern interior, including 80 rooms with simple décor, Wi-Fi, air conditioning, TVs and telephones. 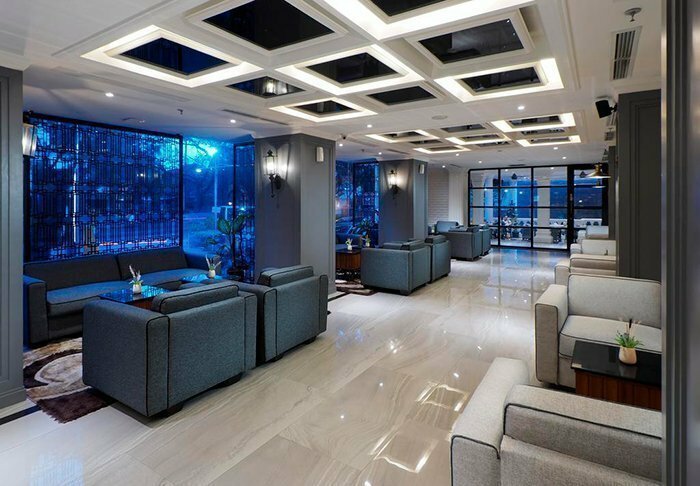 A lounge, bar and restaurant are also available here. 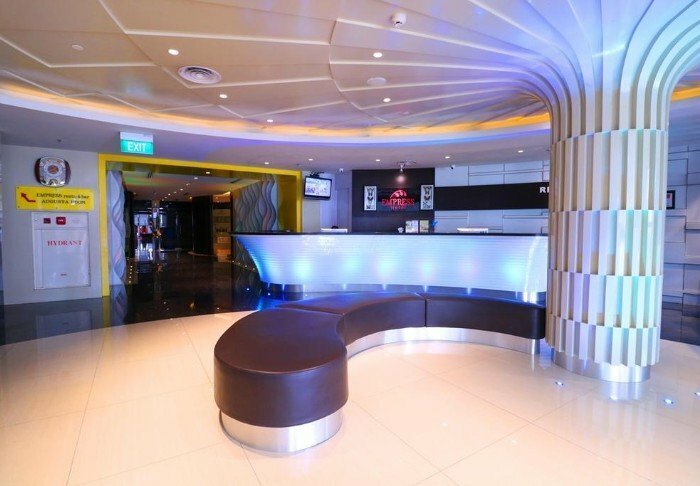 The 3-star BBC Hotel is centrally located in Sengkang, approx. 15 minutes on foot from Tempe Lake, where you will find several floating fishing villages. 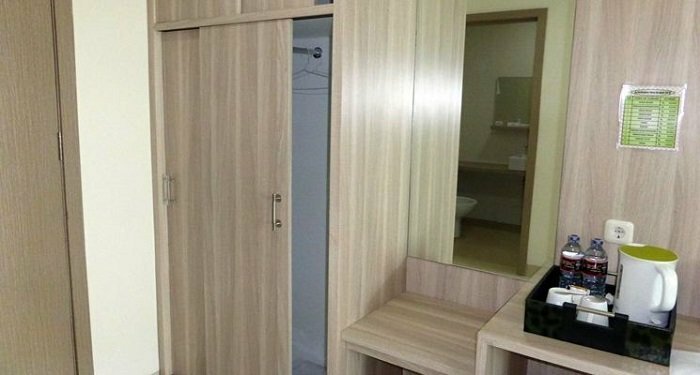 There are 28 rooms with air conditioning, a flatscreen TV and a safe, as well as a separate bathroom with either a bathtub or a shower. 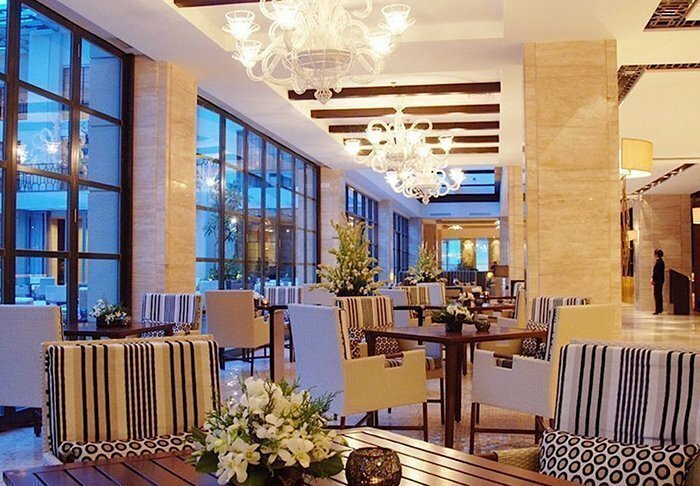 Other facilities at the hotel include a charming little café. 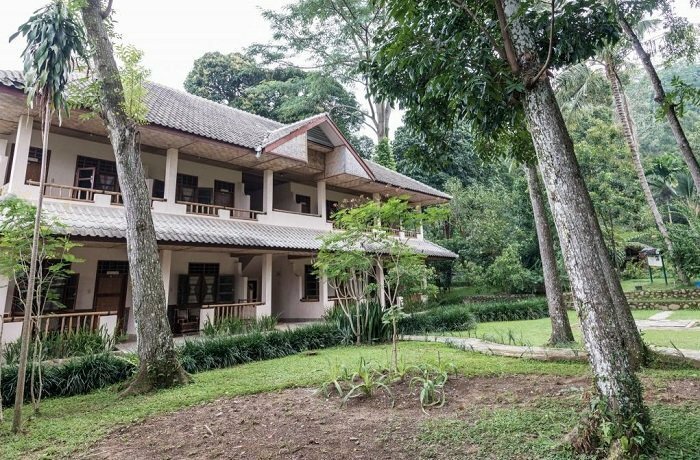 The 2-star Hotel Torsina enjoys a peaceful setting, surrounded by paddy fields in the Toraja highlands close to Rantepao and approx. 20 minutes by car from Makale. 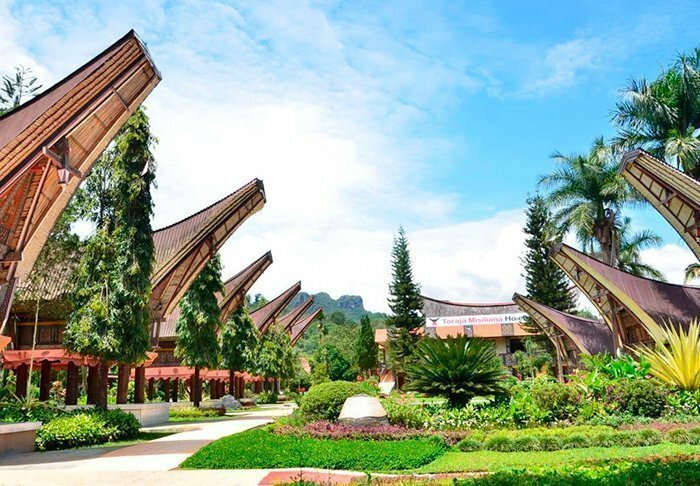 The architecture of the hotel buildings is inspired by the classical construction style in the Toraja highlands. 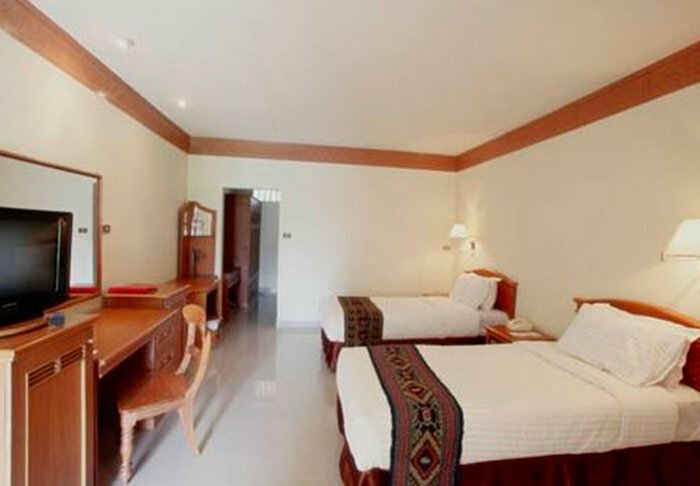 The rooms are simply furnished, with facilities including a separate bathroom. The hotel has a swimming pool. 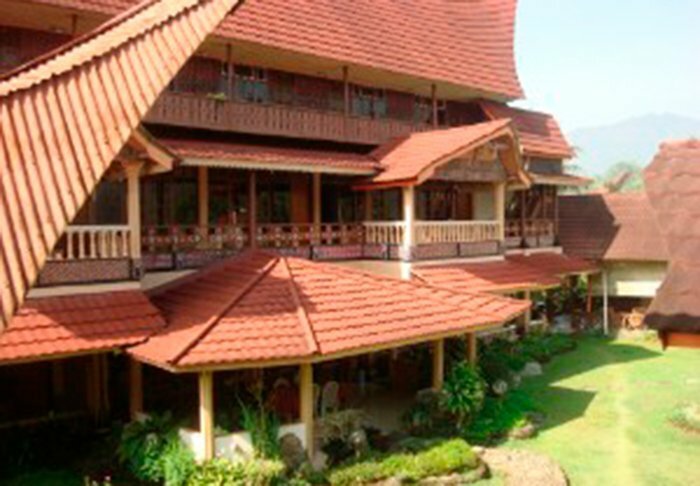 Toraja Misiliana Hotel sits at the heart of Toraja, by the Sa’dan river, just 2 km from the city of Rantepao and 12 km from the airport. 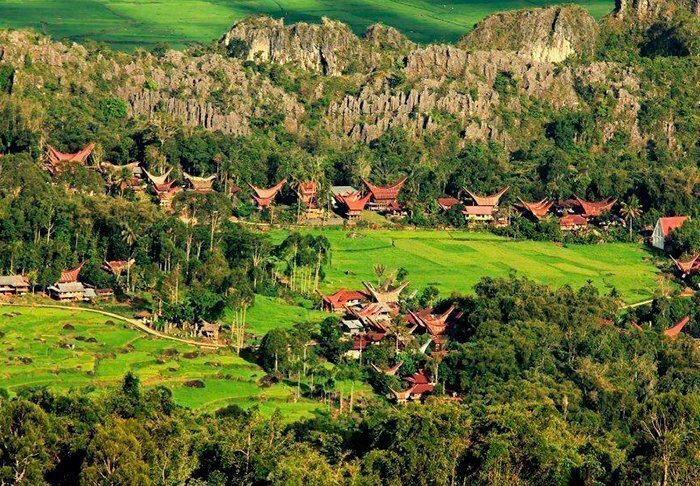 The hotel is built in harmony with its beautiful surroundings, in the traditional Toraja style. 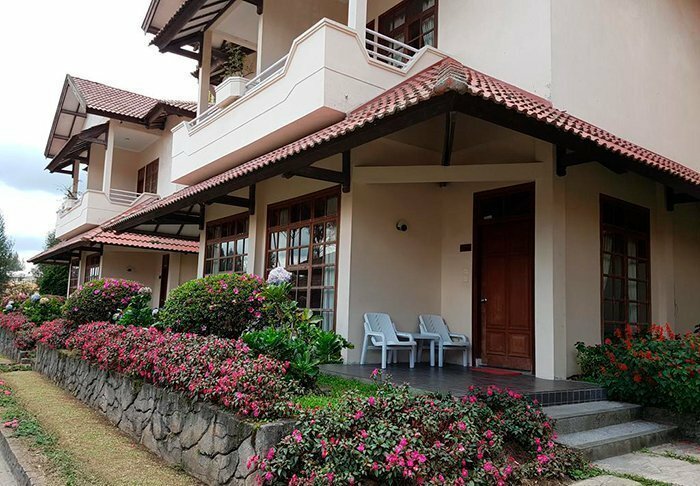 All 98 rooms are bright and spacious, and all feature free Wi-Fi, air conditioning, TV, minibars, coffee and tea facilities as well as balconies or porches with a view of either the garden or the mountains. 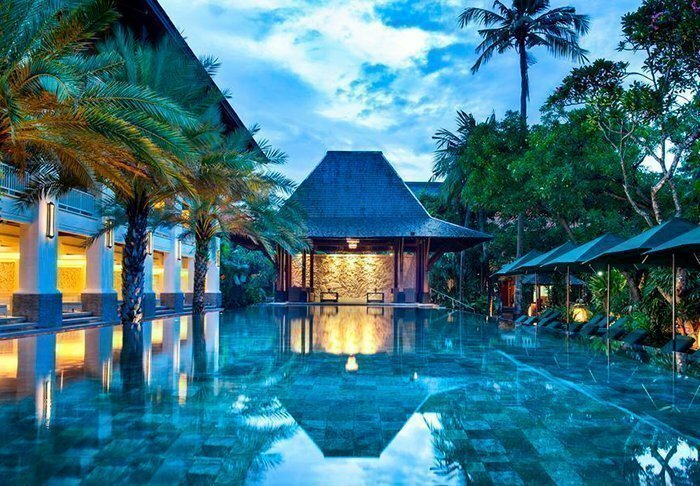 After a long day, you can enjoy the pool, or treat yourself to a massage. A tennis court is also available. 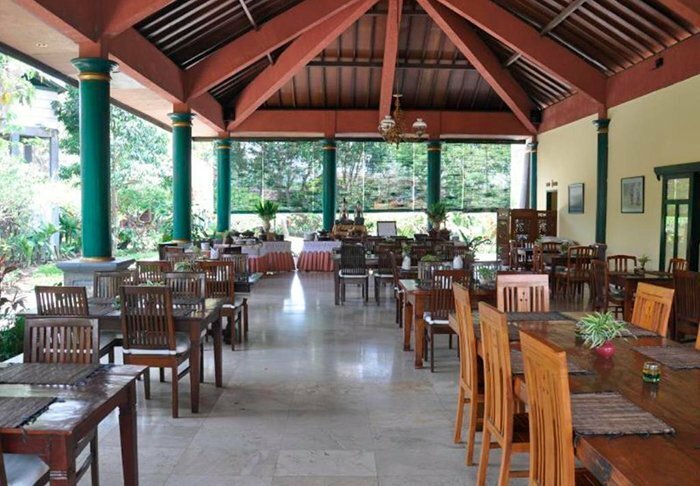 The hotel has several restaurants to choose from, each serving delicious Indonesian cuisine. 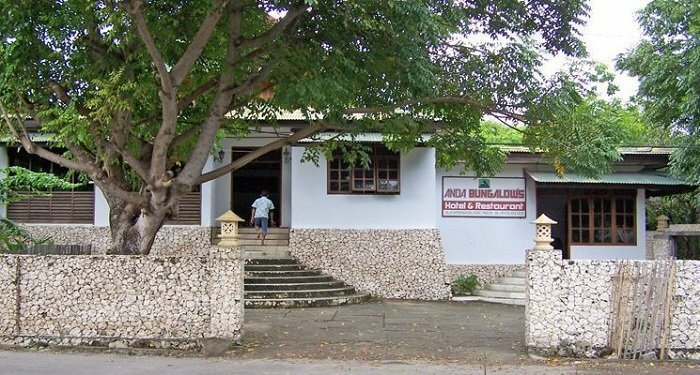 Anda Bungalows is just 50 metres away from the beach at Tanjung Bira. 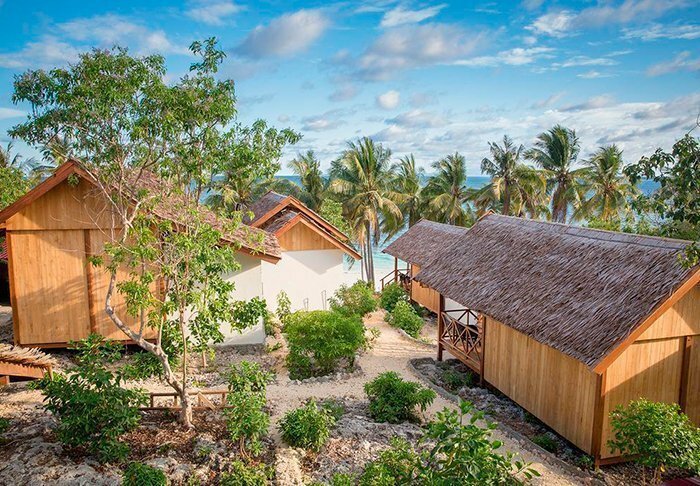 You stay in a private bungalow with a simple interior and air conditioning. 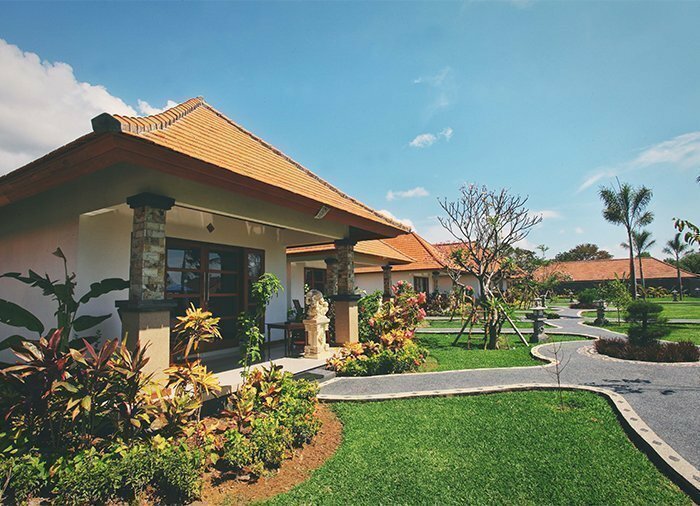 Each bungalow features its own porch with a view of the garden. 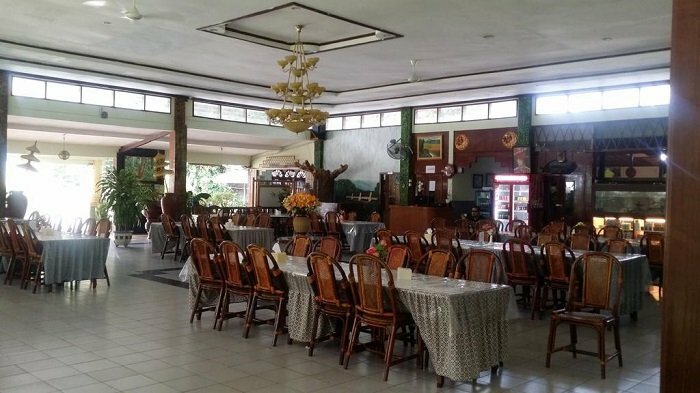 A restaurant is available at the hotel. 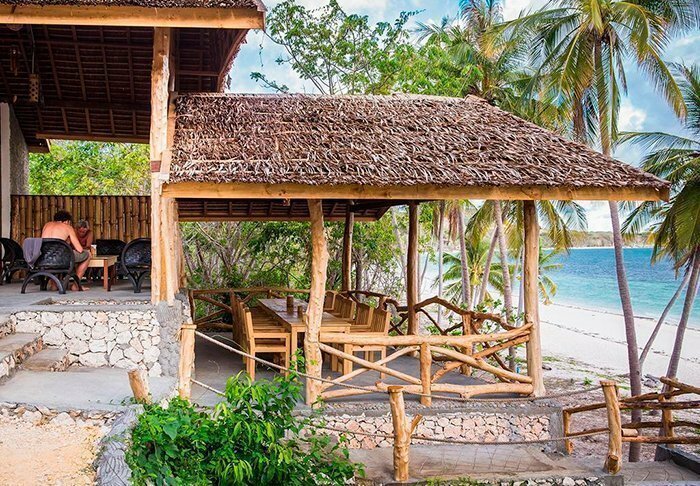 BaraCoco Bungalows offers a view of the white palm beach at Tanjung Bira, where the ocean shifts between turquoise and blue. 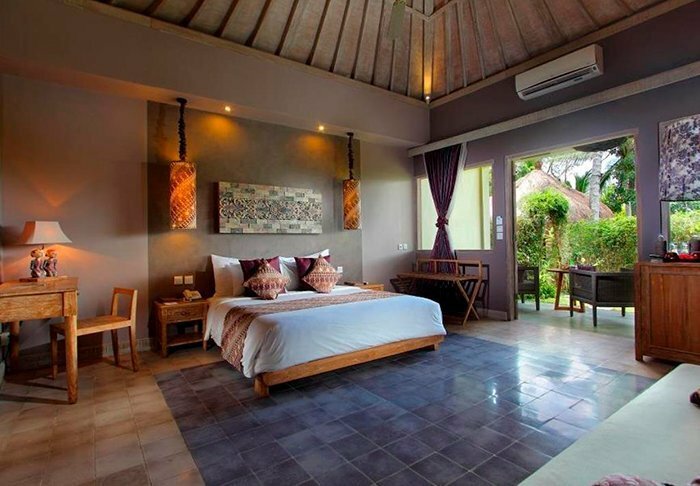 You stay in a private bungalow with tile floors and wooden furniture. 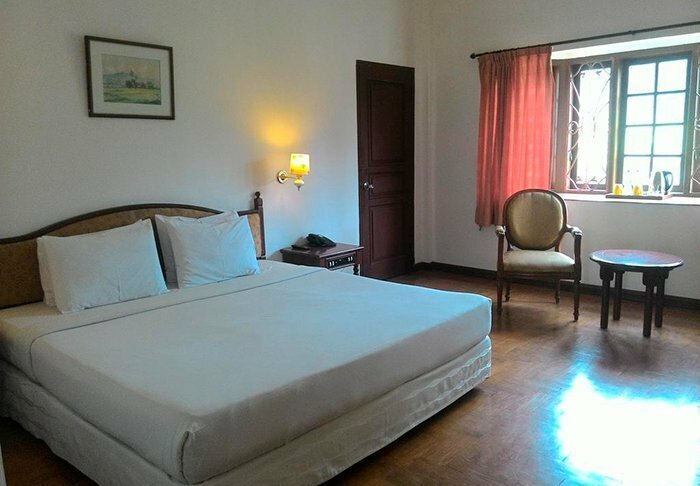 All rooms feature air conditioning, minibars, TVs and DVD-players, as well as a porch. 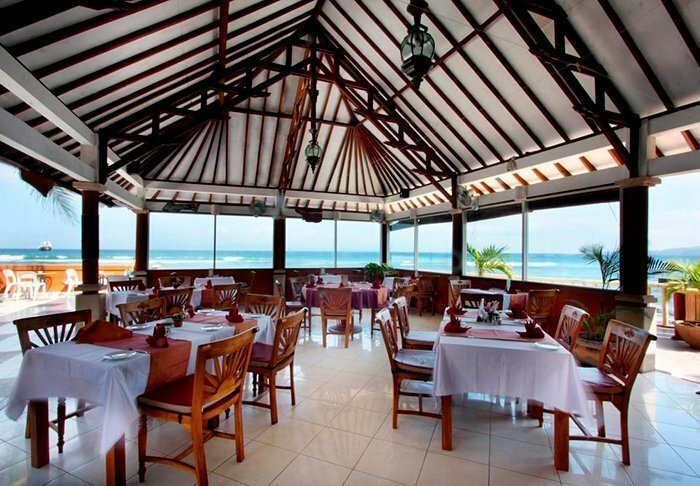 The restaurant has a view of the beach, where you can finish off your day with a stroll to the sounds of the ocean. 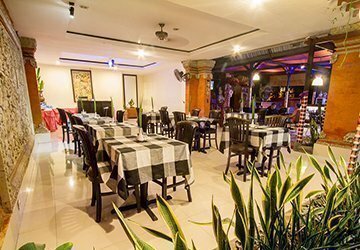 The hotel is located in the heart of the Karo area, surrounded by exotic flowers and other plants, close to the hot springs of Lau Siedebuk Debuk. 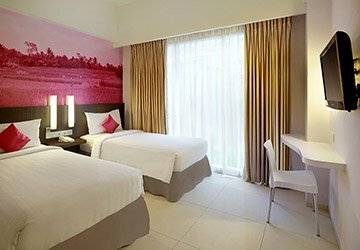 Choose the Grand Mutiara Hotel and enjoy Eastern charm, modern facilities and elegantly furnished rooms with a TV, facilities for making coffee/tea, and a balcony overlooking the garden. 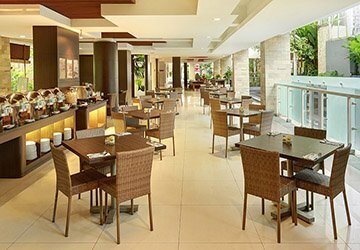 The hotel has a restaurant serving international and traditional cuisine, as well as indoor and outdoor cafés and a swimming pool. 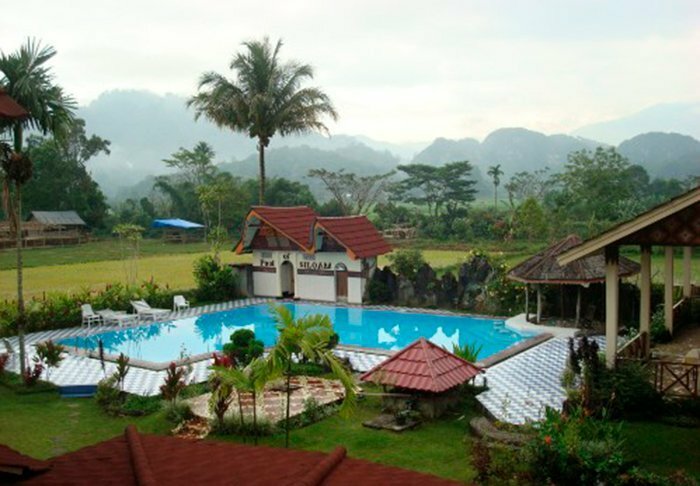 Sinabung Hills sits in the Berastagi highlands with a view of its beautiful landscape. 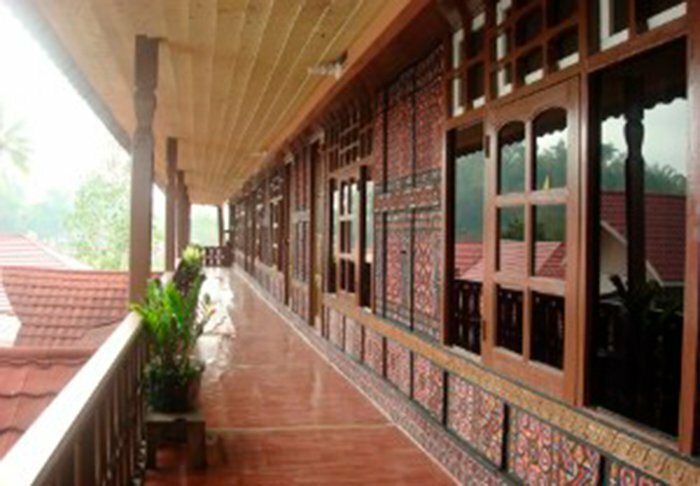 The hotel has 106 spacious rooms furnished with bright walls and dark wooden furniture. 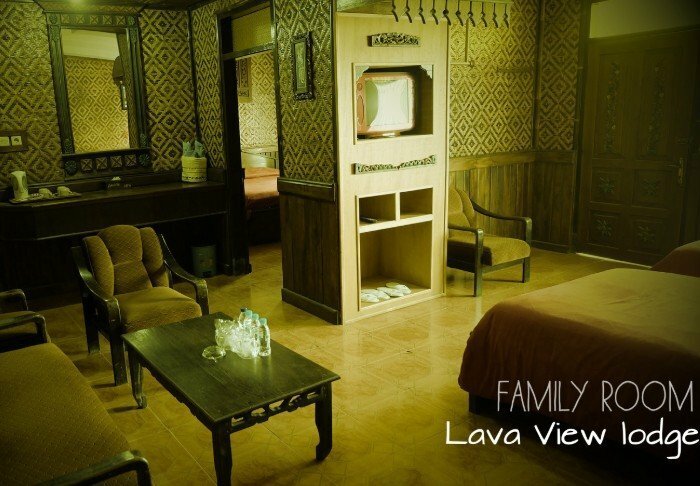 All rooms have Wi-Fi, air conditioning, TV and coffee and tea facilities, and your balcony offers a view of the volcano Mt. Sibayak. 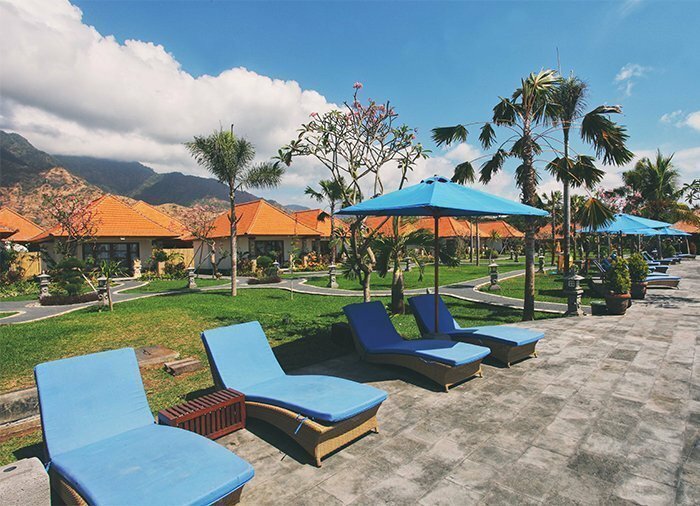 To relax, you can unwind by the pool, which is surrounding by palm trees, and for the active among us, tennis and basketball courts are available as well. 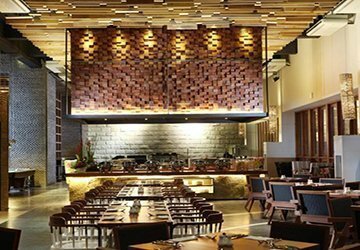 Sinabung Hills also features a coffee shop, lounge and restaurant, where you can find Chinese, Malaysian, Indonesian and Western cuisine. A souvenir shop is available as well. 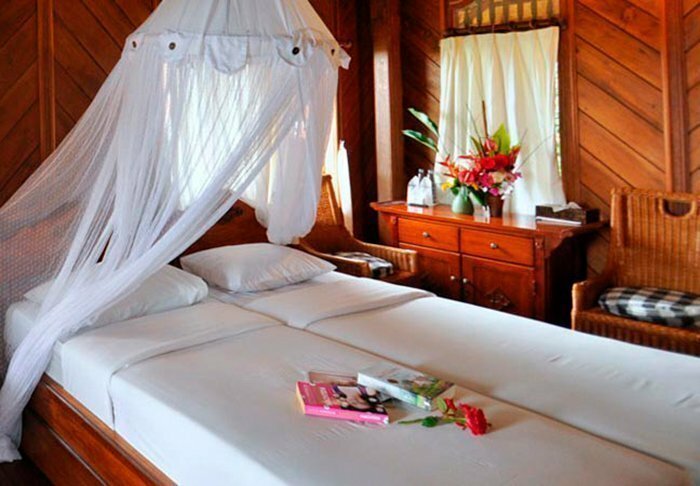 In the rainforest in Gunung Leuser National Park, on the banks of the Bohorok River, stands Bukit Lawang Ecolodge. 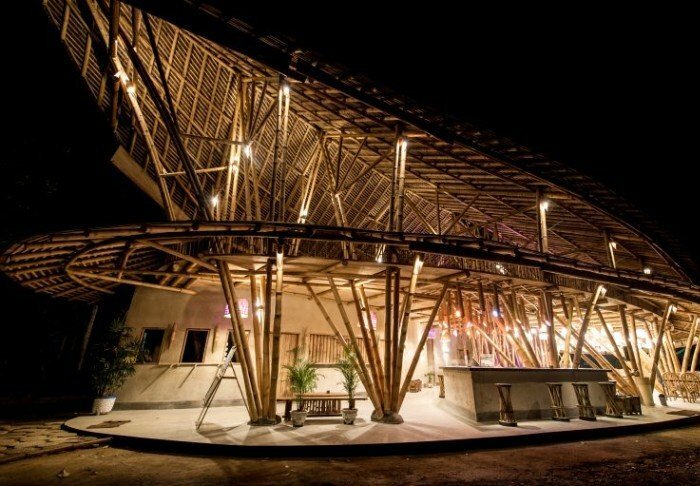 When the hotel was constructed, the designers drew inspiration from the natural surroundings, and the 34 comfortable rooms are all built of natural materials. 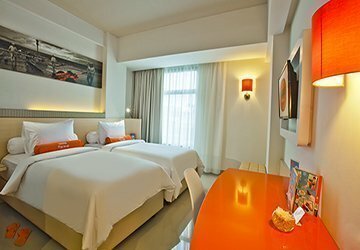 The rooms are divided up into four different types. 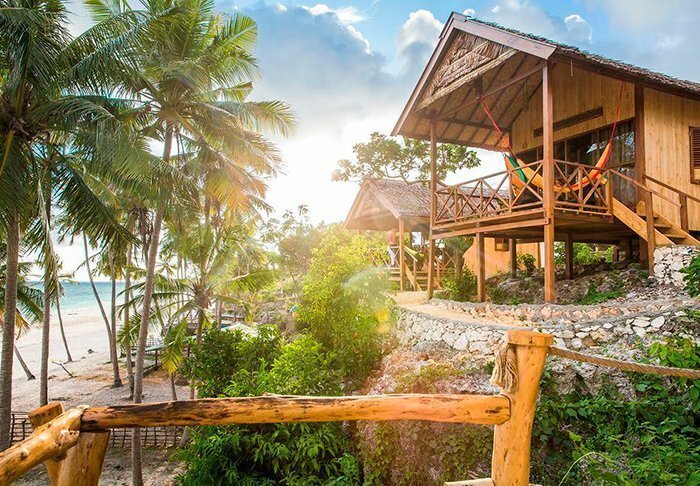 However, they all have their own bathroom, fan and mosquito net, and all feature either a balcony or a terrace where you can relax and listen to the multifarious sounds of the rainforest, at the end of a day packed with experiences in the national park. 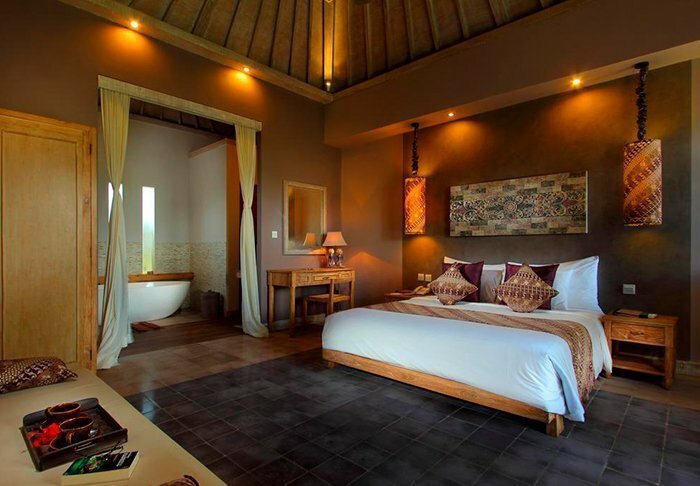 The rooms and the lodge are generally very simply furnished, with basic amenities. 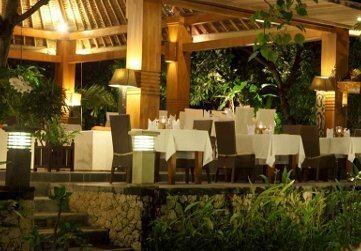 The restaurant serves cuisine prepared using organic vegetables from the hotel’s own garden. 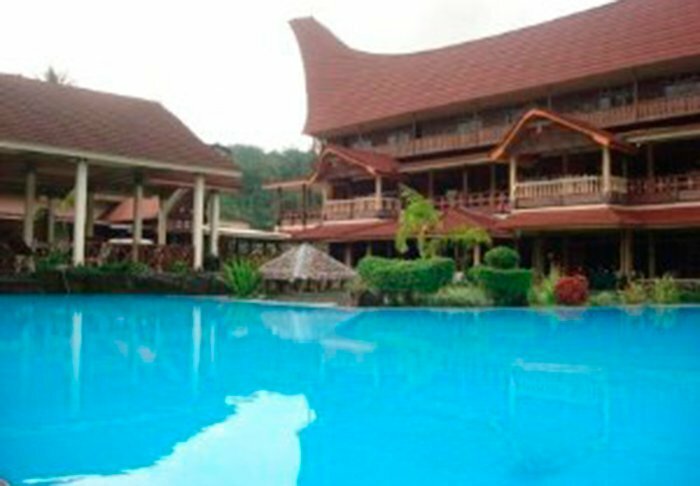 Rindu Alam is located in the village of Bukit Lawang in gorgeous natural surroundings on the banks of the Bohorok river. 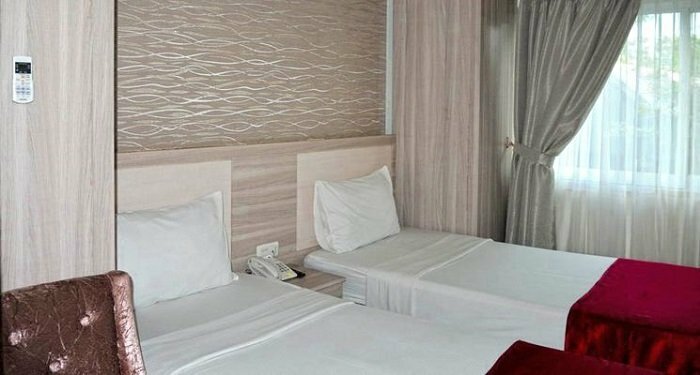 The hotel has 40 rooms, all equipped with ceiling fans, air conditioning and TVs. 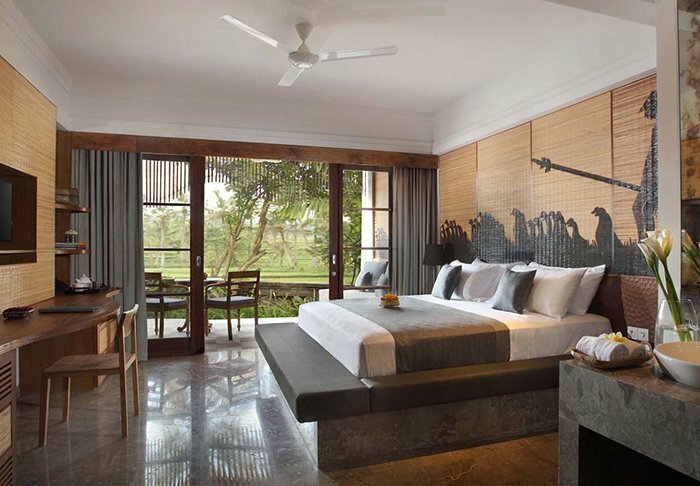 From your room, you have a view of either the garden or the river. Free Wi-Fi and a restaurant are available at the hotel. 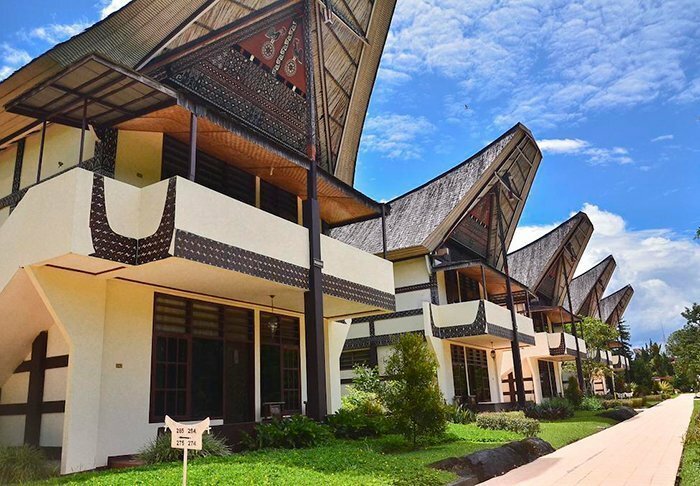 The island of Samosir in the middle of the crater lake Toba is the setting for this charming hotel, surrounded by paddy fields and plantations. 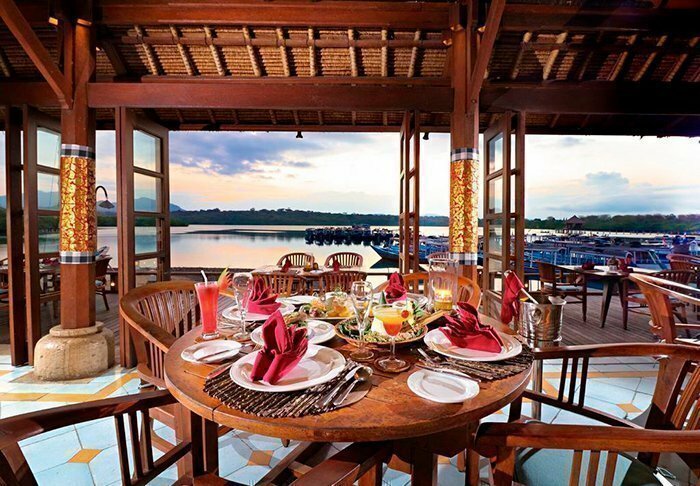 The hotel is designed in natural, traditional style and enjoys a magnificent view out over the lake and the mountains. 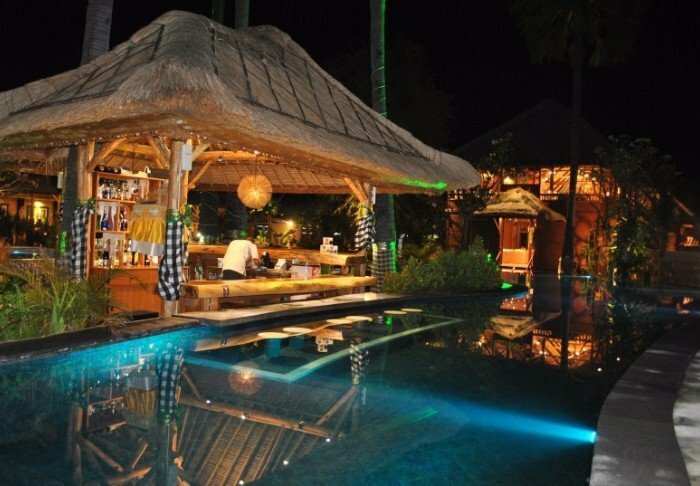 The location, the unique style and the verdant tropical garden combine to create a truly amazing and relaxing atmosphere. 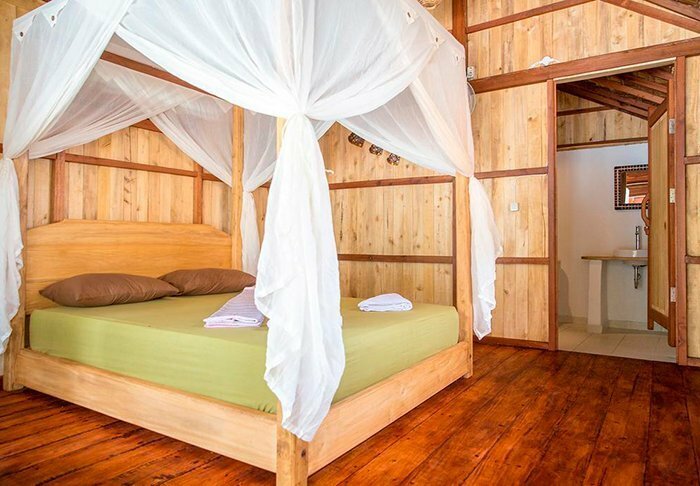 The rooms are simply furnished and equipped, have their own bathrooms, and provide a view of the garden and the idyllic mountains. 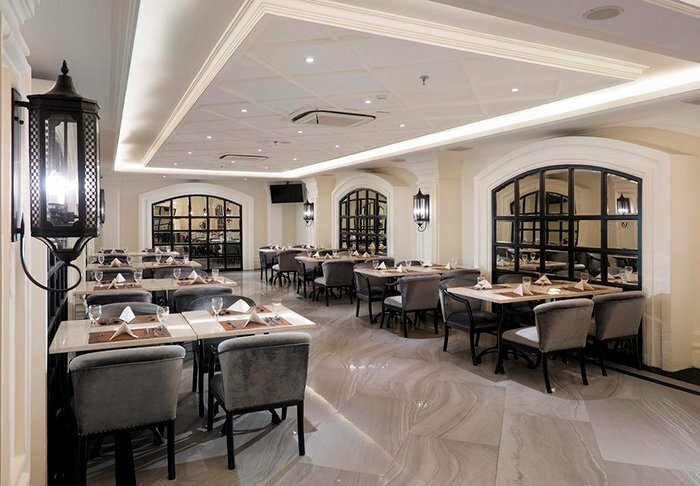 The hotel has its own bakery and a restaurant that serves international and traditional cuisine. 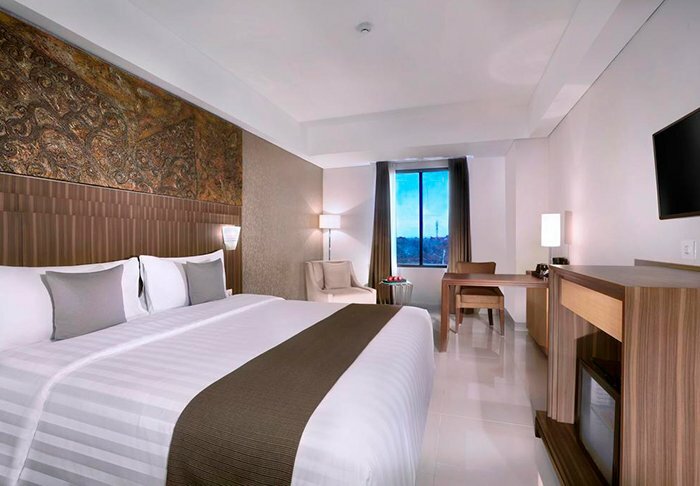 In the heart of Indonesia’s third largest city, Medan, you will find the Aryaduta Hotel. 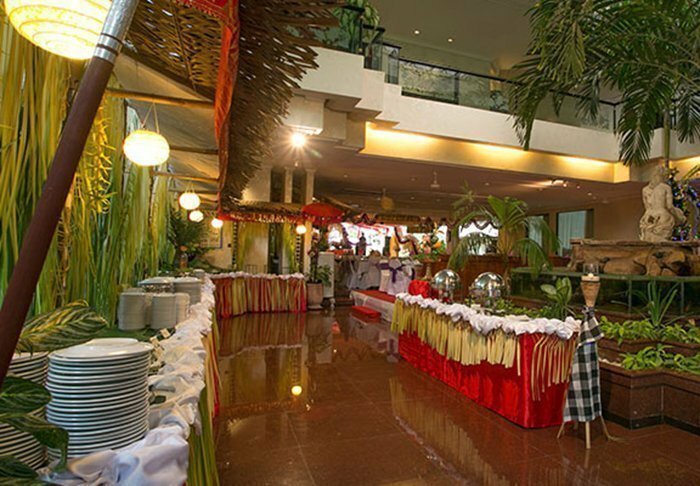 The hotel is located on the top floors of the Grand Palladium Mall, where there are also cafés and a supermarket. 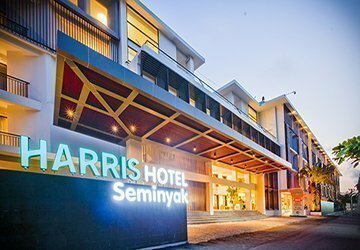 Merdeka Walk is just a few minutes’ walk from the hotel. 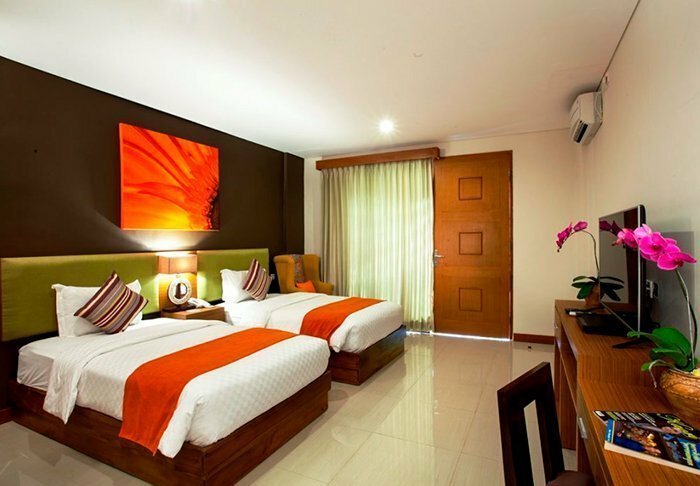 The rooms are spacious and all have an en suite bathroom/toilet, TV, air conditioning, minibar and free Wi-Fi. 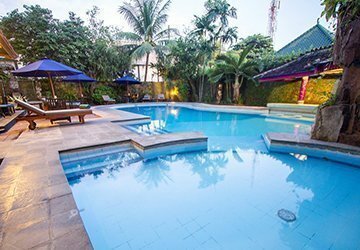 In the middle of the hotel complex are the pool and garden, where you can enjoy a nice cup of coffee or a cool drink in the sunshine. 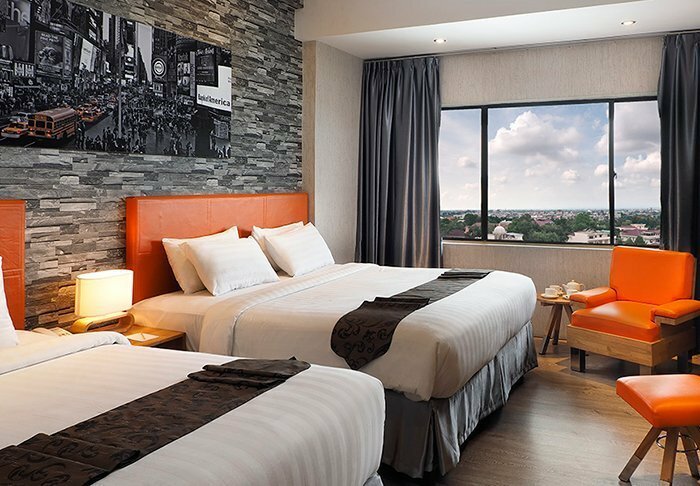 This 4-star hotel is located in the heart of Medan, close to the Borobudur Vihara Temple. 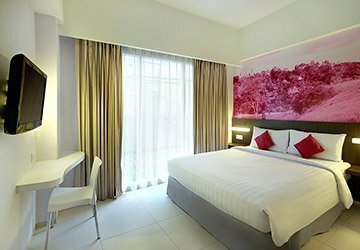 The modern rooms are tastefully appointed and equipped with Wi-Fi, air conditioning, a safe, a TV, coffee and tea facilities and a hair dryer. 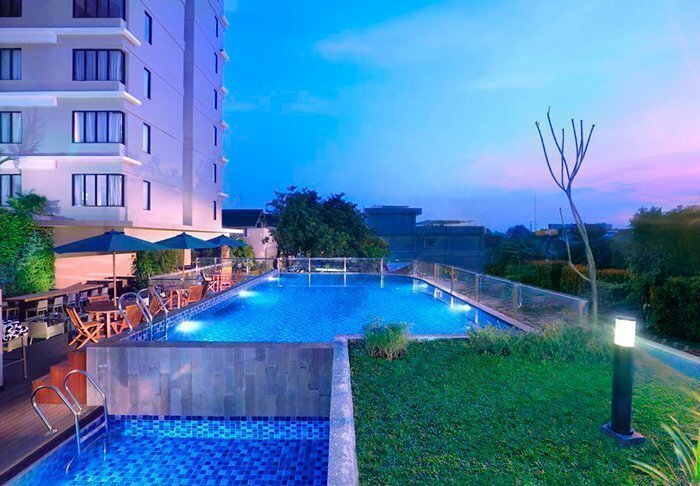 After a long journey, you can relax at the hotel pool, and in the evening, you can enjoy delicious local and western dishes at the hotel’s restaurant. 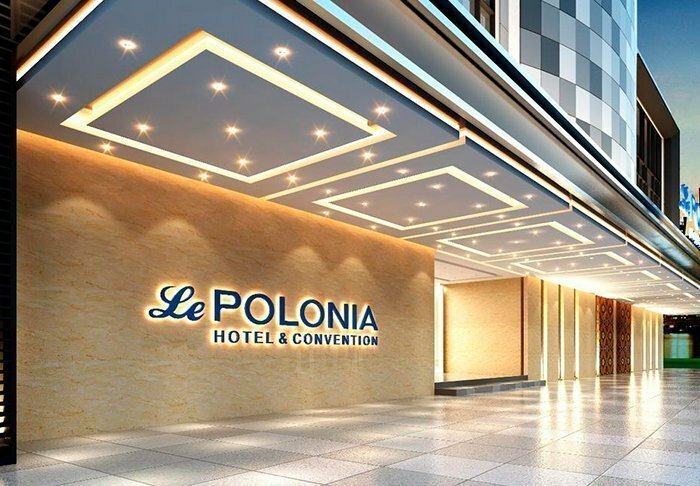 Polonia also has a gym and a barber’s salon offering body treatments and massage.